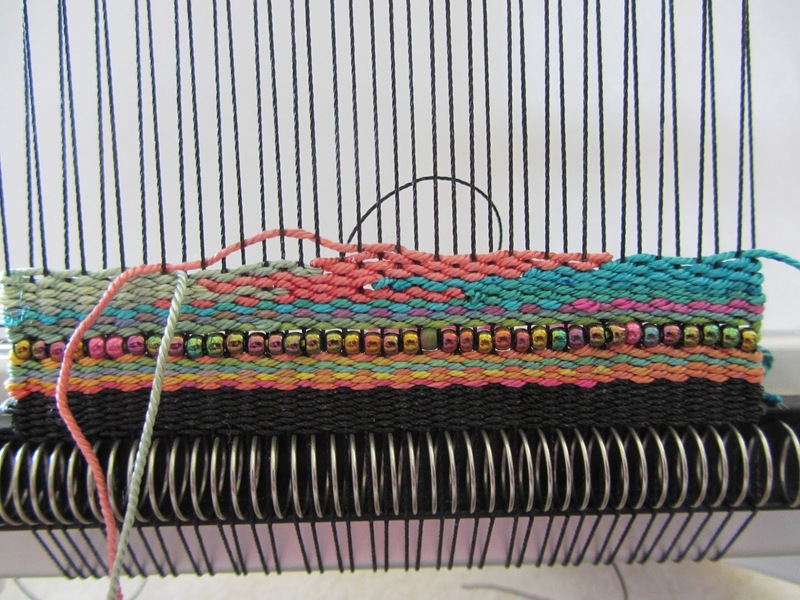 Time for some weft interlock. 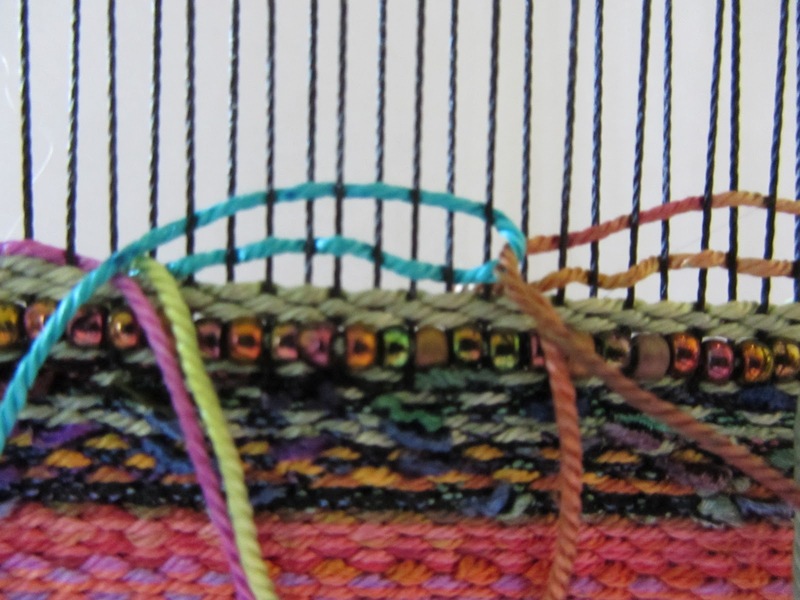 Using some scrap yarn, divide your warps into roughly four evenly spaced sections. 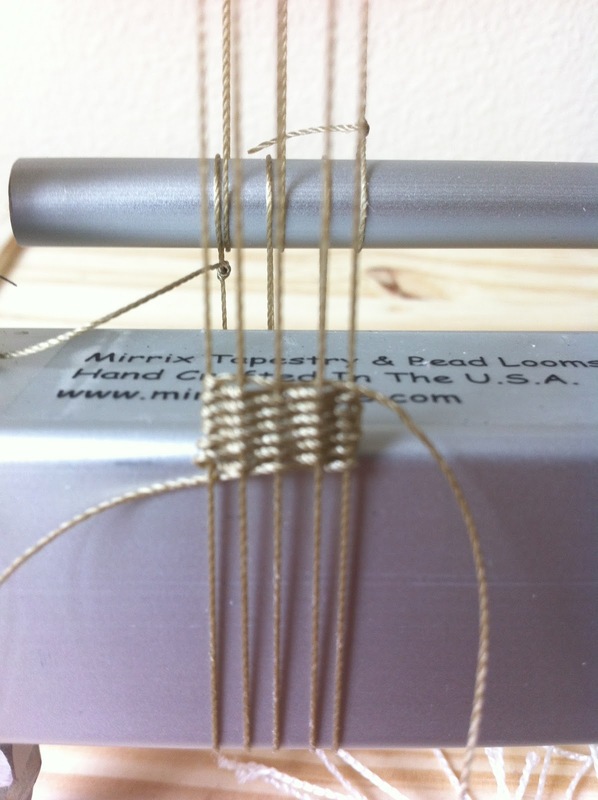 Insert your four wefts going in the same direction, from left to right. 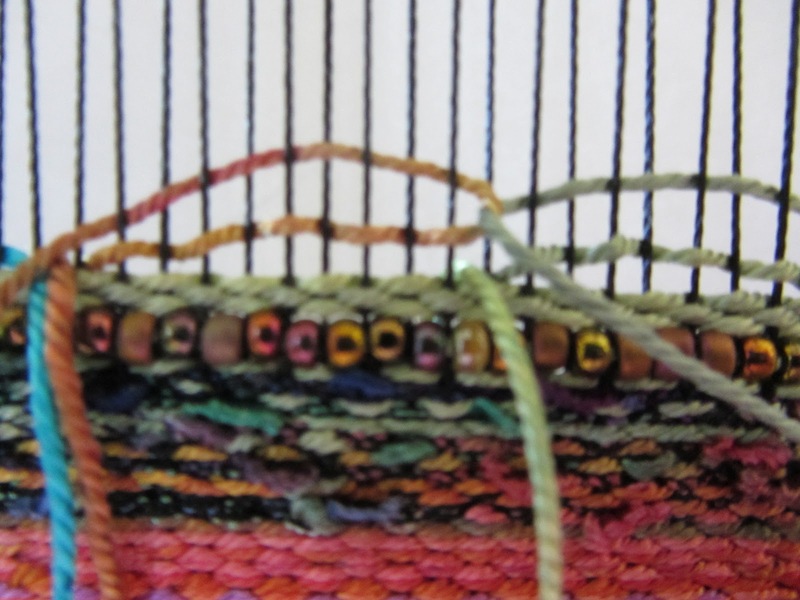 Then head back to the right starting with the weft on the right. 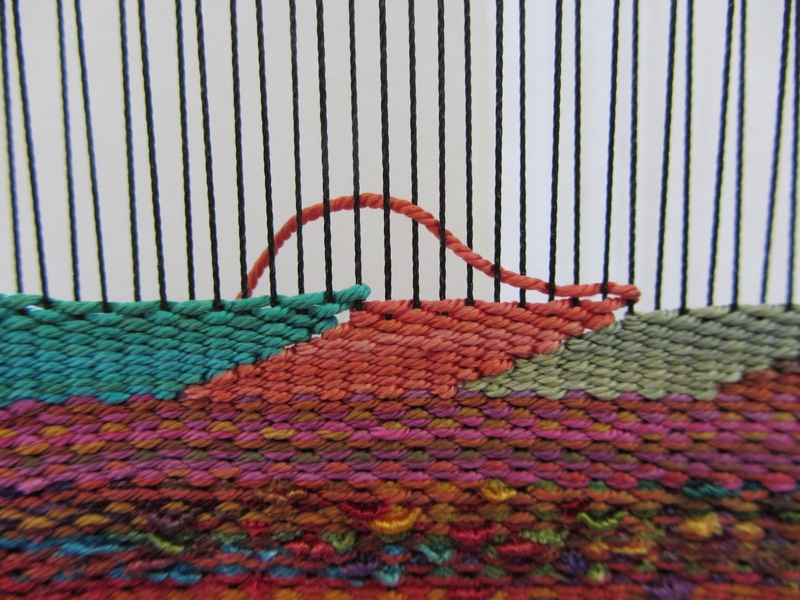 When you weave the second weft, catch it around the first weft and weave. Do this with the following two wefts. 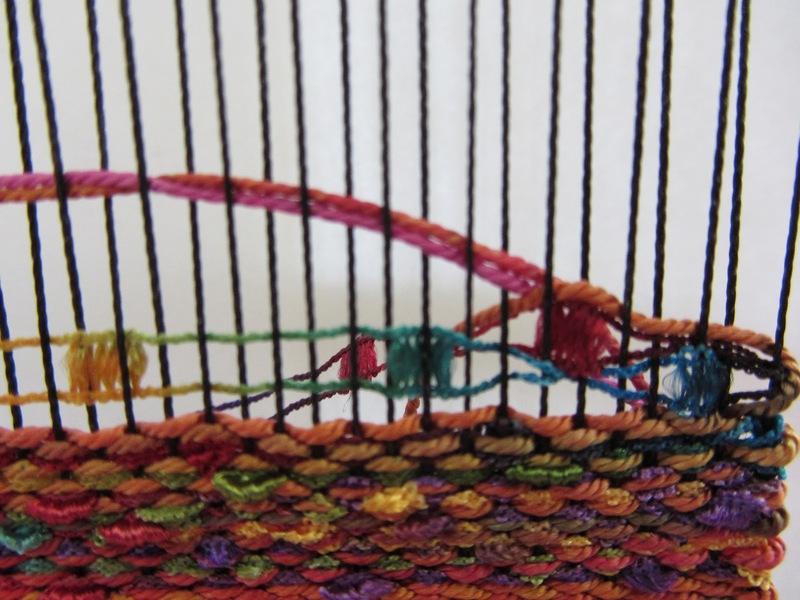 Essentially, the wefts, where they meet, loop around one another. 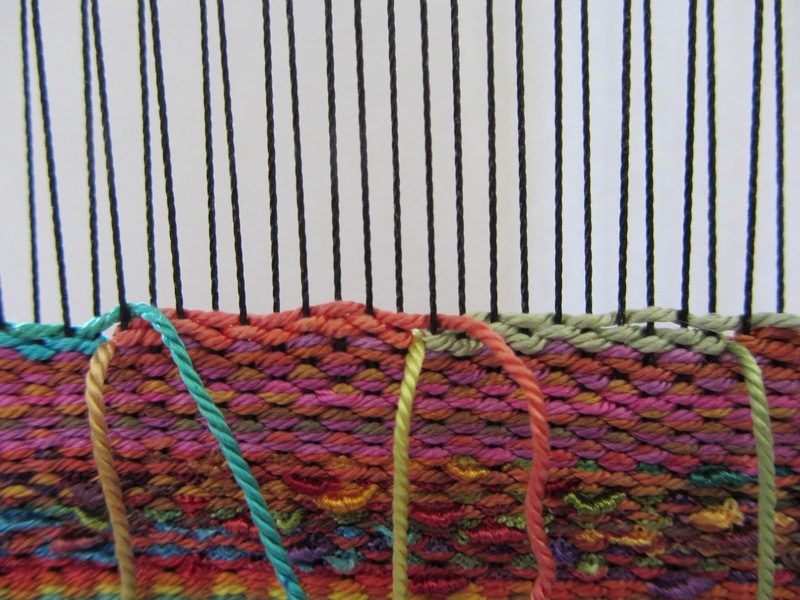 The line between the wefts will be in between warps making this very different from warp interlock, where you wrap your weft around the same warp. 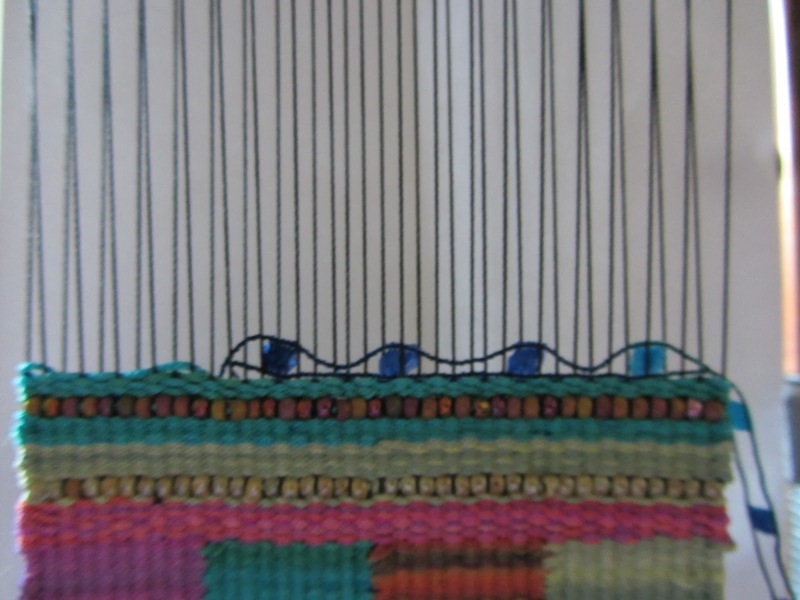 With weft interlock, which is frequently used in Navajo technique, there is less building up of higher weft areas where they interlock making it a better technique for building up straight lines. The best technique is obviously slit technique where there is no build up, but then you have those pesky slits to sew up. Next weave back from right to left. 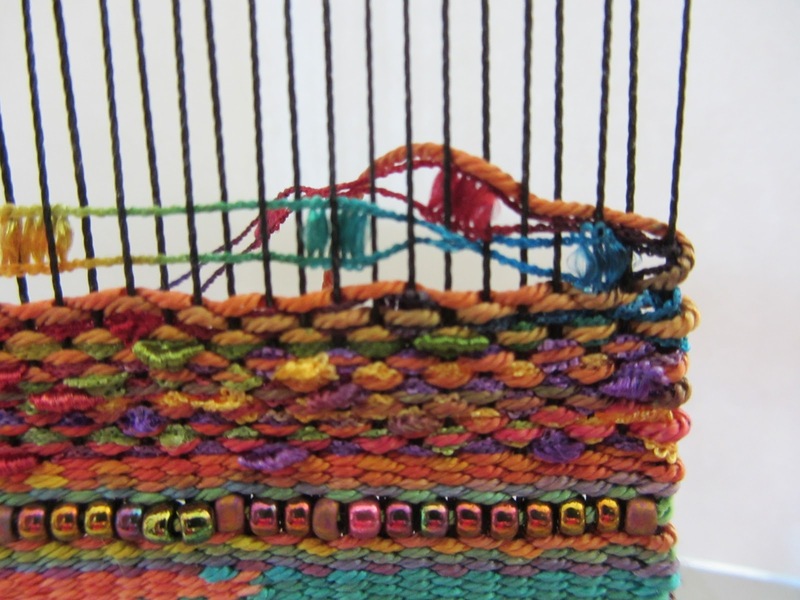 Your wefts are already caught around one another so you are just weaving back. 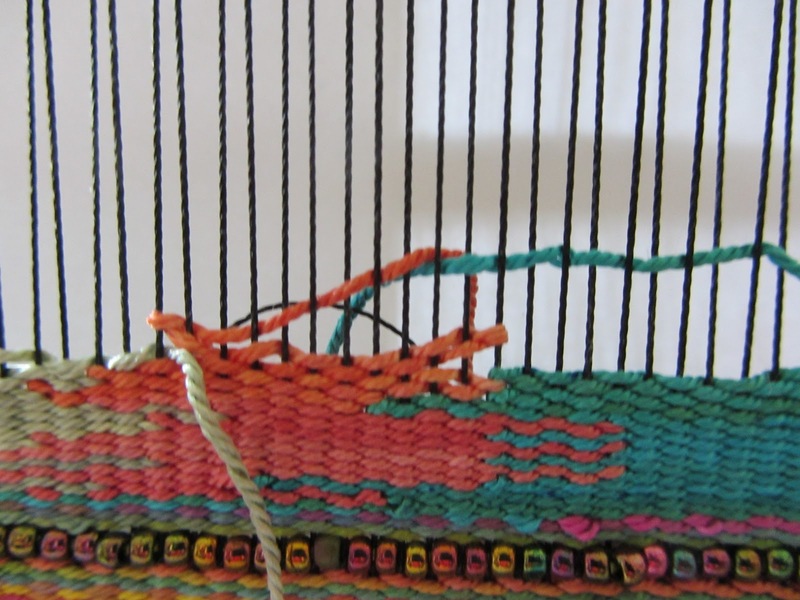 The next step is to weave from left to right, catching the wefts with one another until you get to the right side of the weaving. Continue this process with the next wefts. Weave until you’ve built up about half an inch. End your wefts except for the far right one. 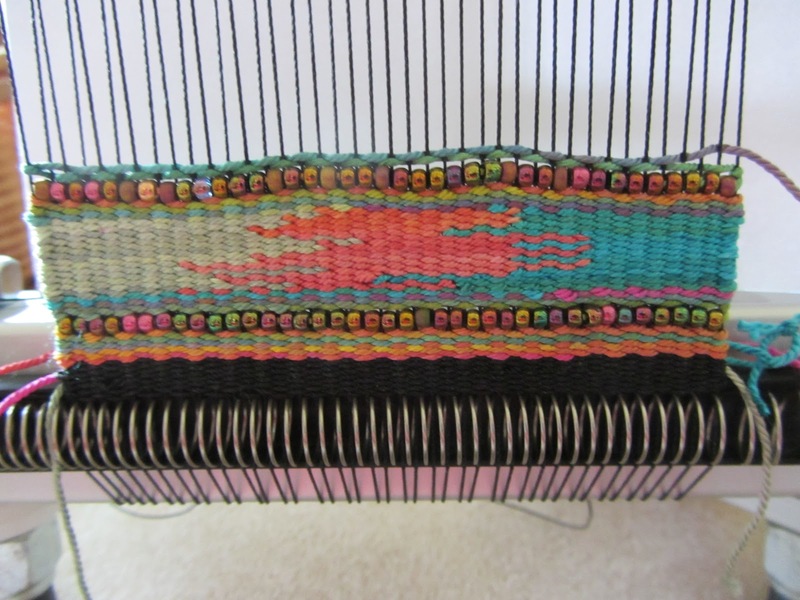 Weave that back to the left slightly and replace it with two silk wefts. Add two silk wefts and weave for a bit. 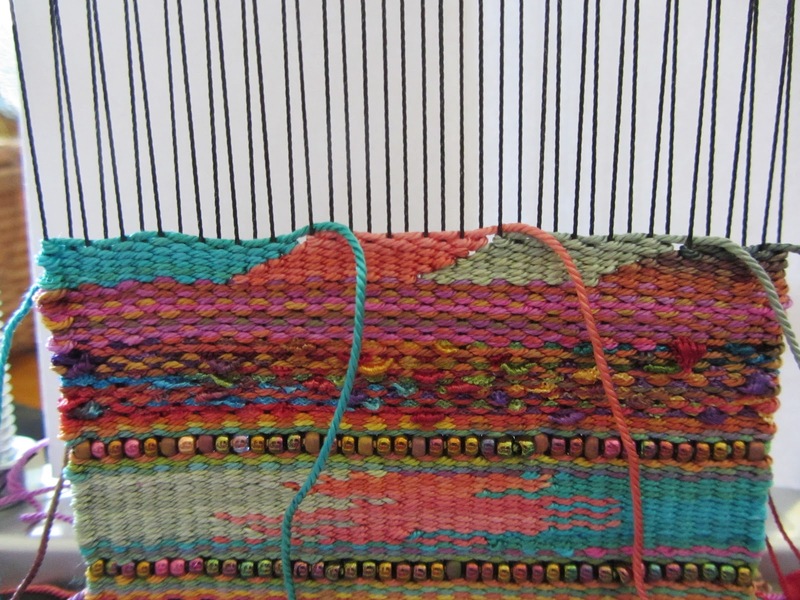 Then replace with single silk weft. 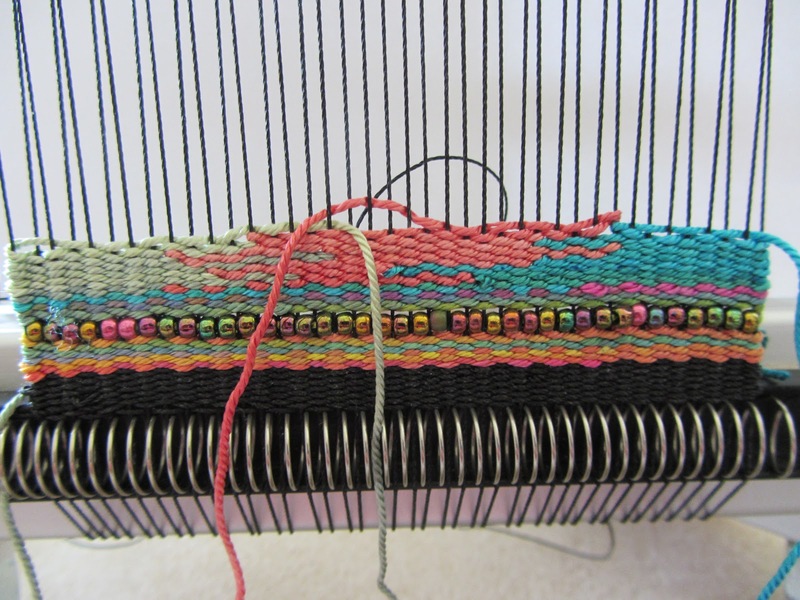 Add a row of beads. 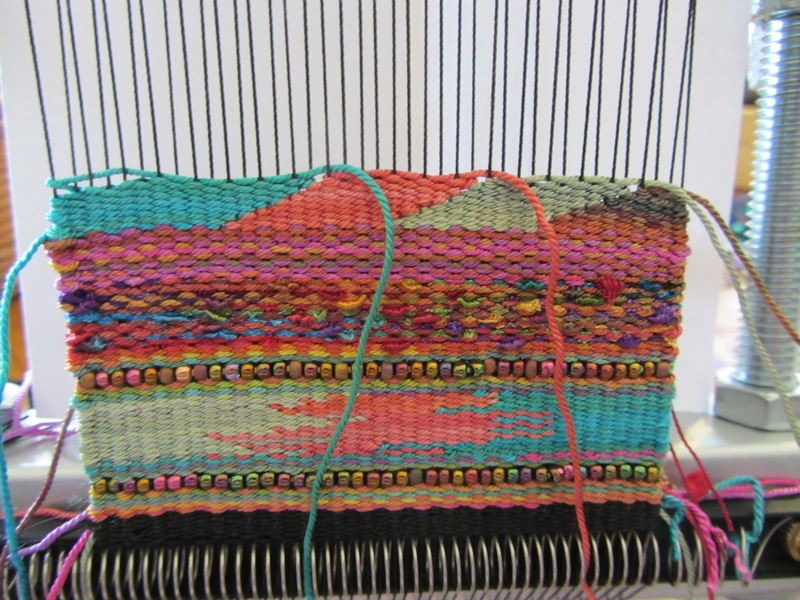 Weave a the silk weft. 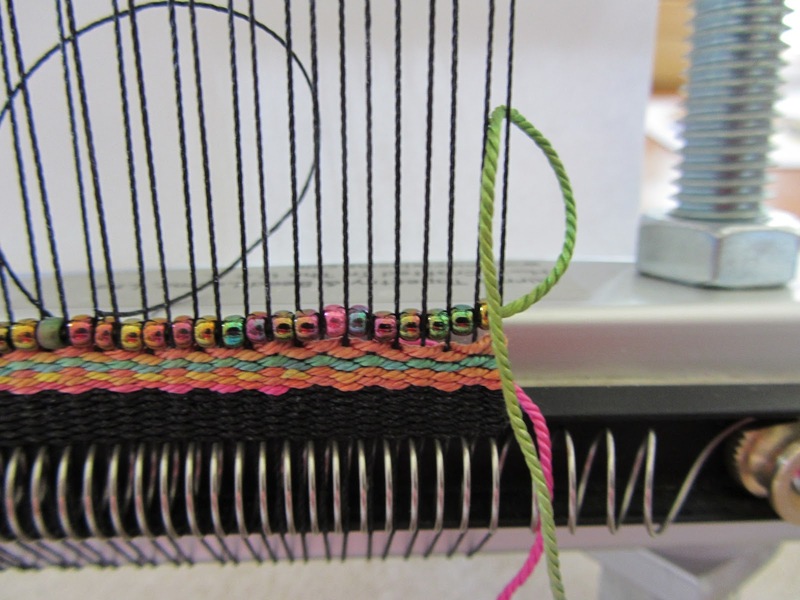 Add another color of single silk weft. 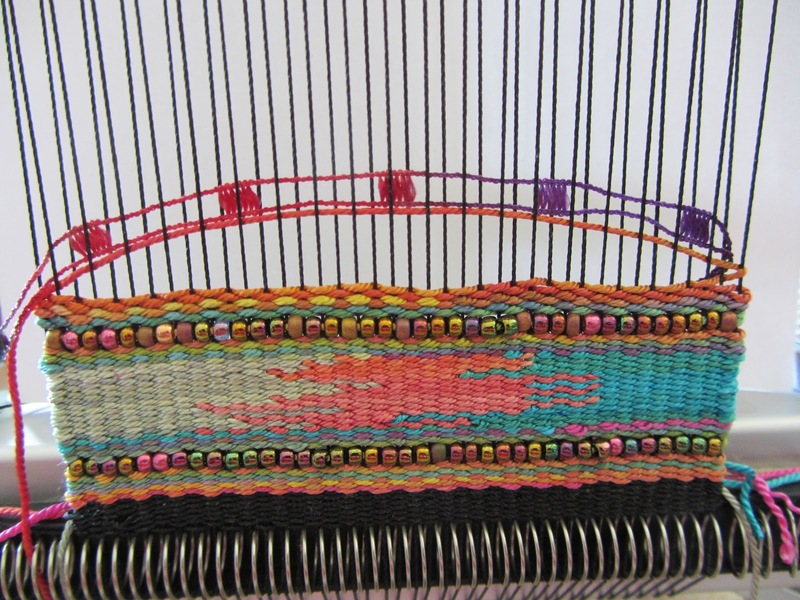 Weave for another bit and then add another row of beads. 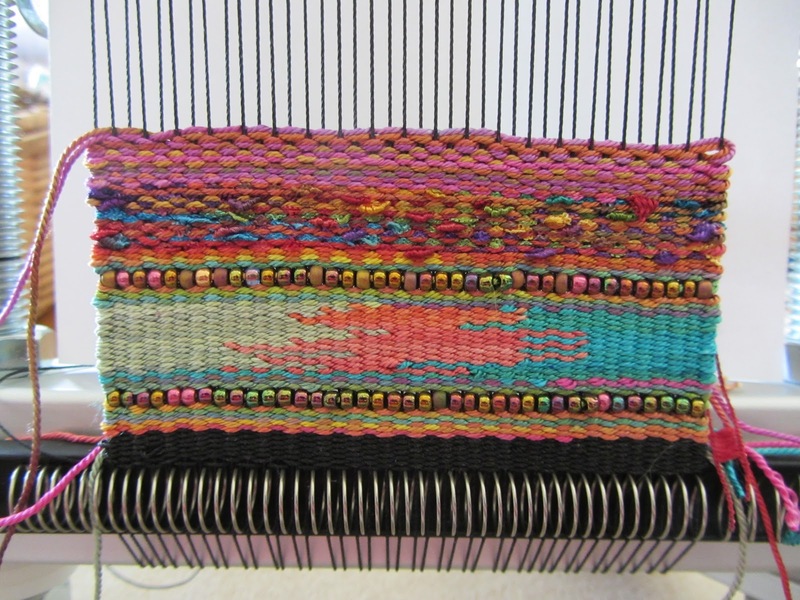 Continue with some single silk weft. 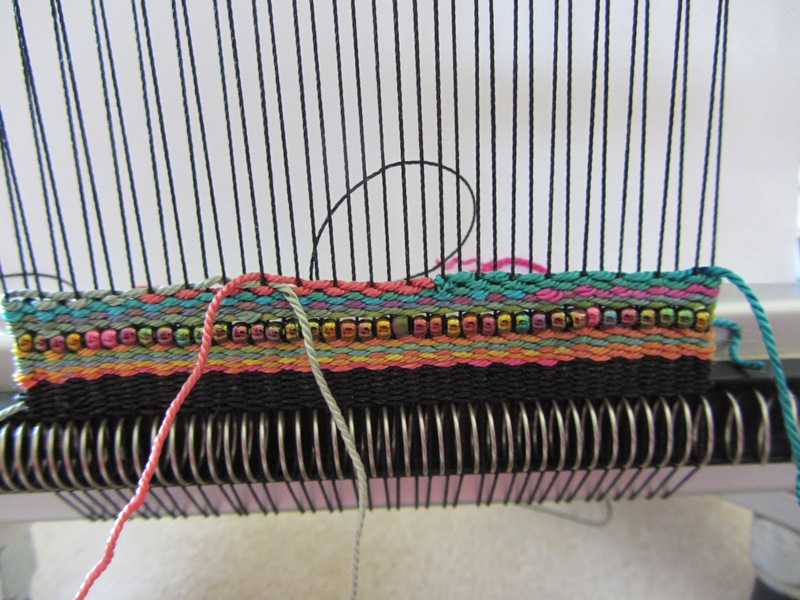 Add some railroad yarn to the silk weft. Weave a bunch of it. 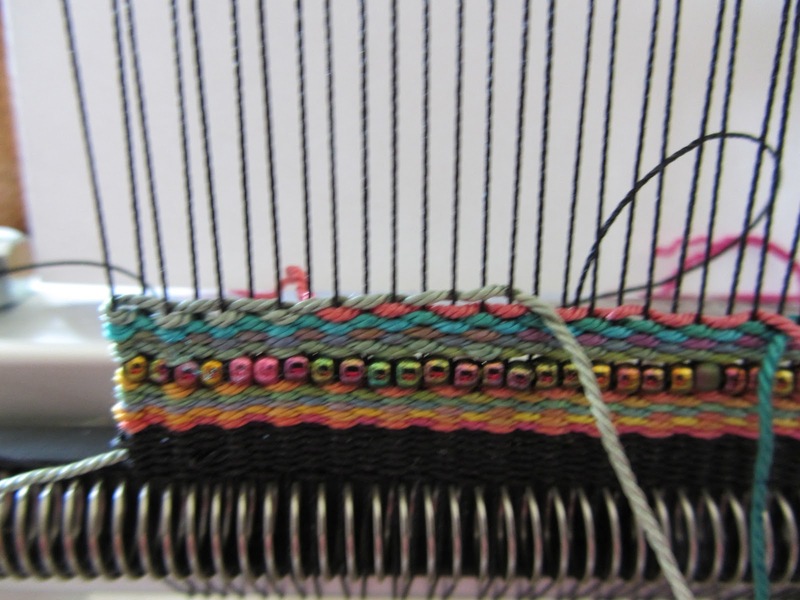 Add some single silk weft. The double it up. 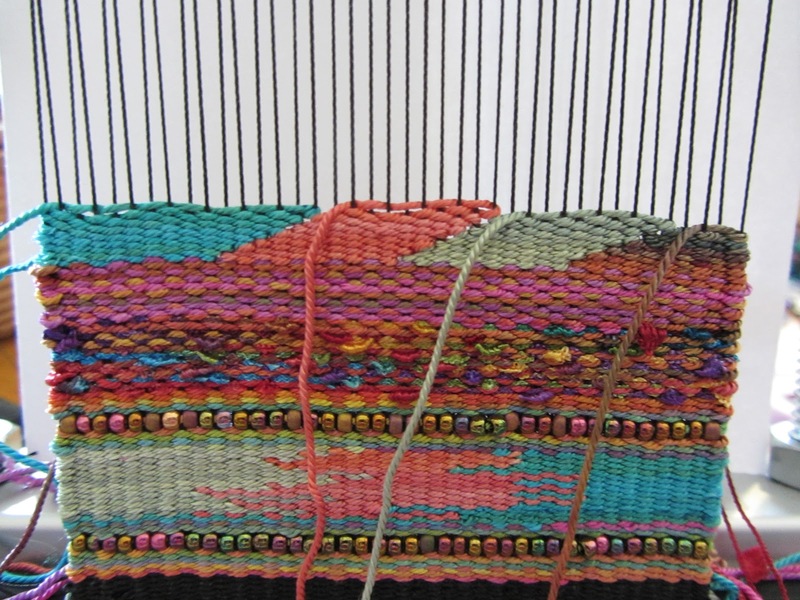 Weave some doubled silk weft. 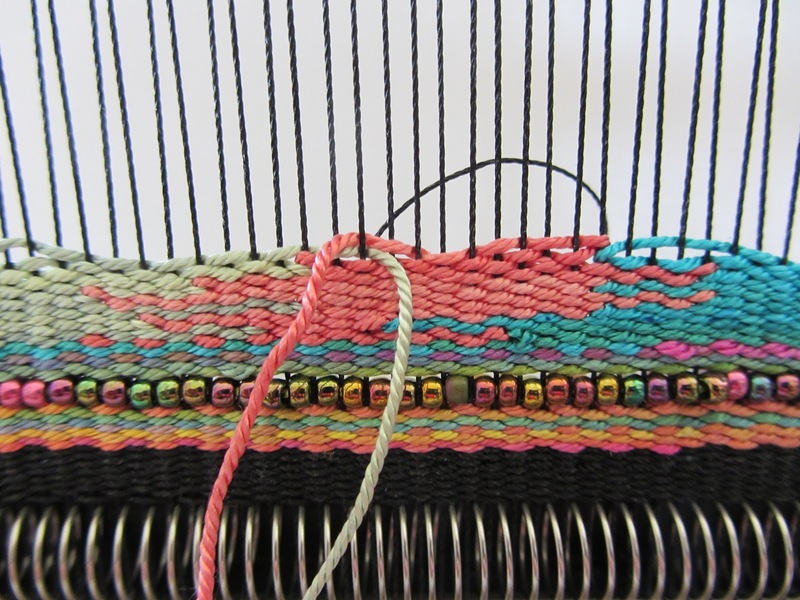 Change it up a bit by replacing one silk weft with a new color. Play! 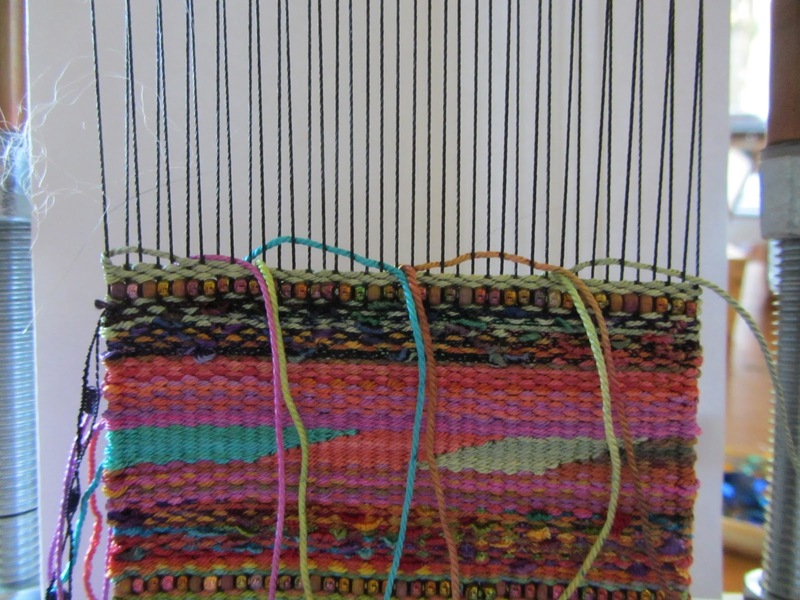 Play with some of these techniques (maybe try those fun squares again) until you’ve woven another four inches! 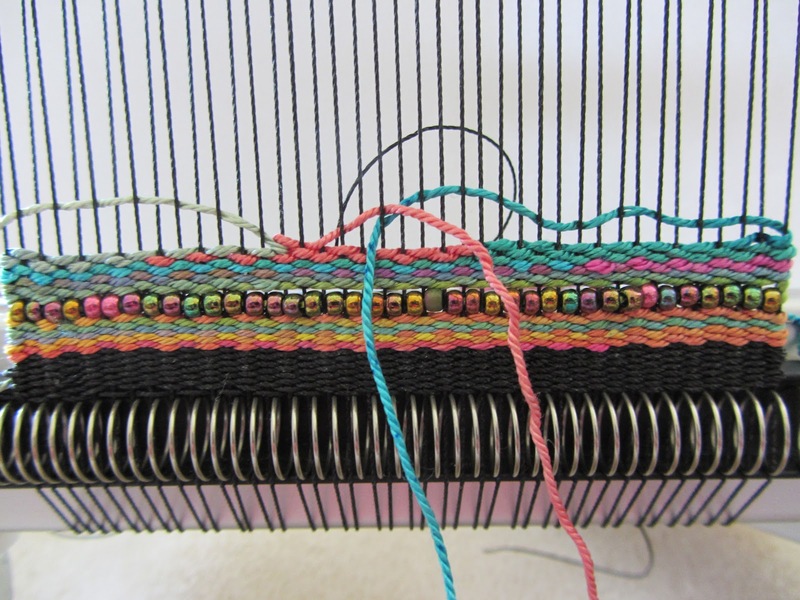 As you probably know, the usual method of bead looming is to tie a length of weft to the edge warp then load your beads, and pass through them from the top. That’s how I started, and the only way I knew. Until someone introduced me to the two needle method. In this branch, there are two methods. In one, the needles move in opposite directions. In the other, they move in the same direction. Since discovering these, I use then (mainly the former) 99.999% of the time. That obviously tells you I prefer them! I can work with a longer length of thread, skip beads less often (not that I did much previously), and seem to add new thread less often. 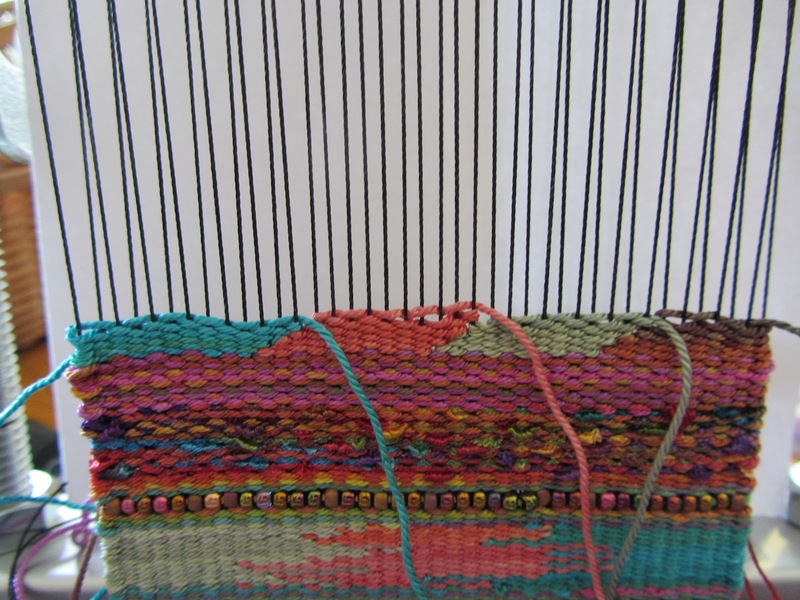 The latter method, where the needles move in the same direction, is very useful when you’re working an area of the same colour. 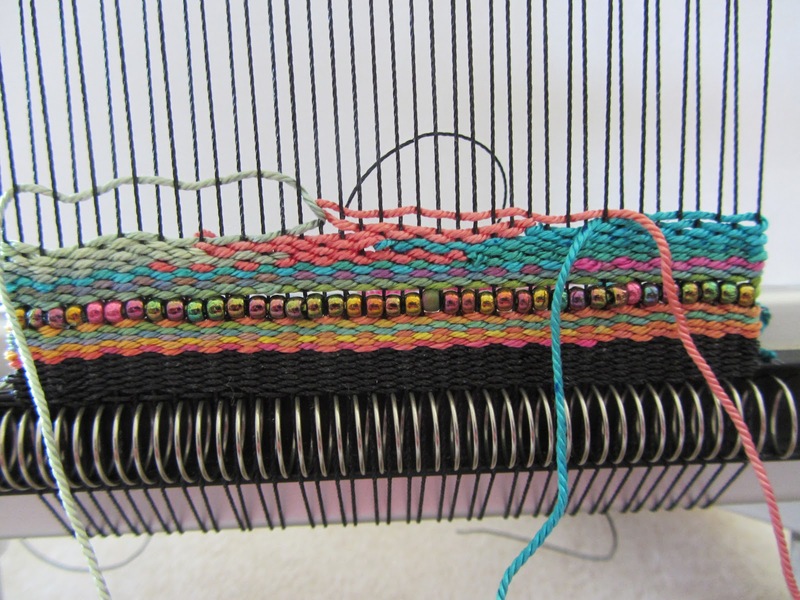 You just load one half of the weft with beads and go on your merry way. This advantage is best seen with wider pieces. I used it in one of my previous portraits for the background. I got tired of counting, and loading using the bead spinner then having to remove some! So on that note, here is my second video. 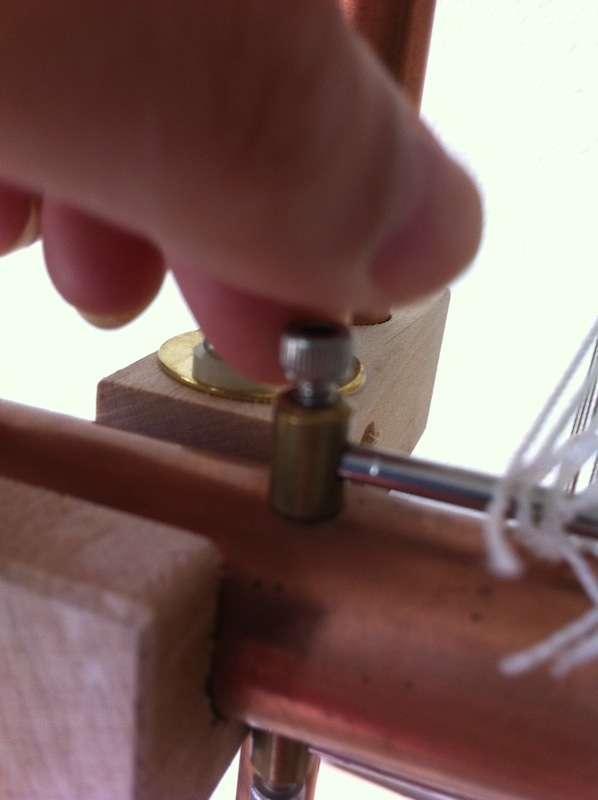 I try and explain the first of the two methods, including a few close up pictures. I hope it’s clear enough and gets your interest. I don’t think these methods are talked about much, at least not as far as I’ve seen. If you have questions, contact me through the blog. Lastly, I found a way to work on the Mirrix in a horizontal position. 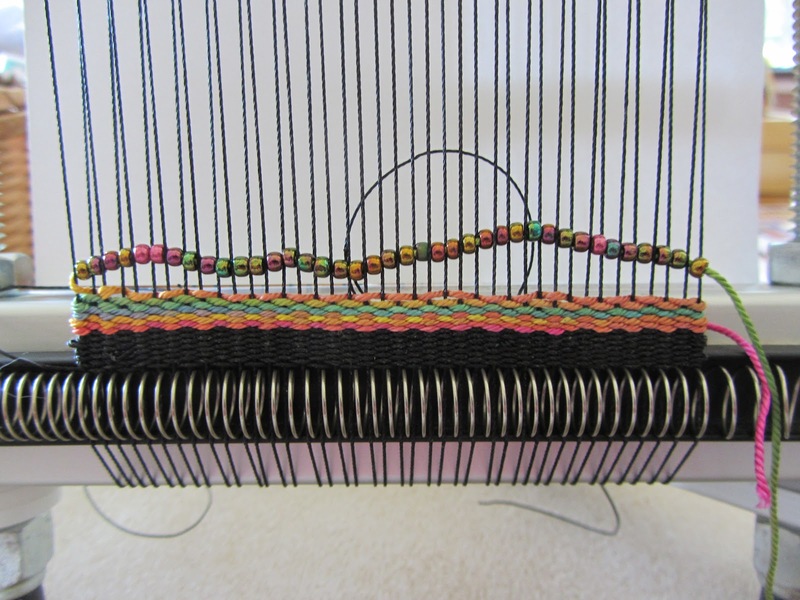 Just pull out the legs and place the clips behind the loom. Bobs your uncle! I’ll edit this tomorrow and post the photo. In the meantime, stay well and happy reading. 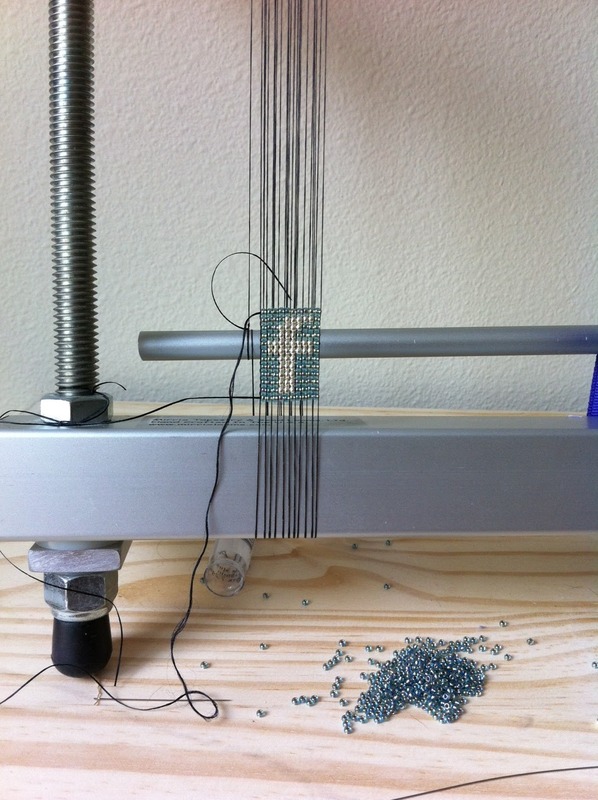 I saw some cute hand-painted social media icons on Pinterest yesterday and thought… I need to make beaded ones! Here’s my first one, for Facebook of course. Getting to the good part! The plan for yesterday included looming in the afternoon or evening. By the time I was done with shopping, cooking, washing and getting a packed lunch ready, it was too late to get in a decent amount. 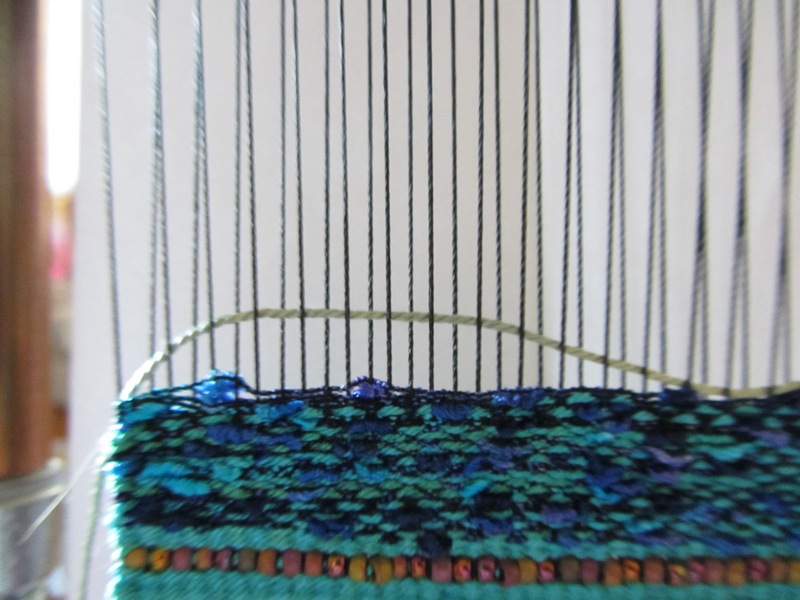 I was also tired – more probe to mistakes and redoing rows several times over! 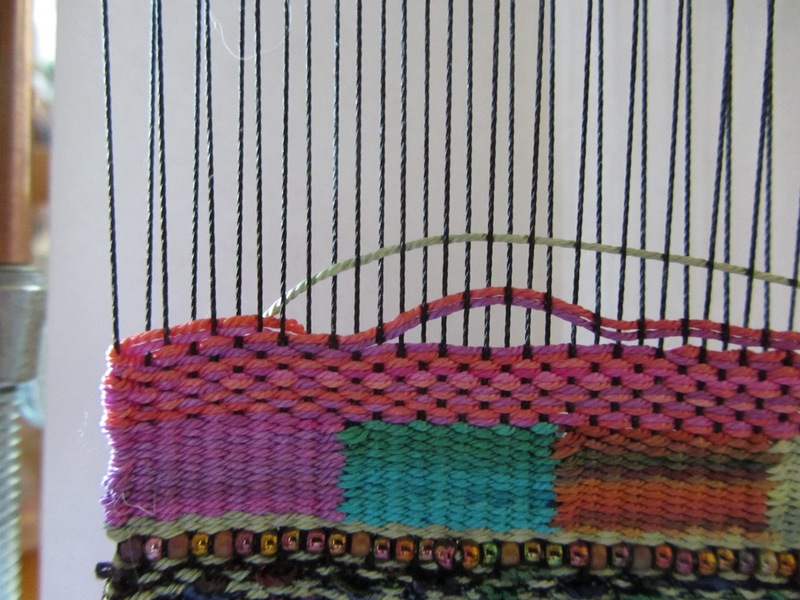 With the purse on the loom (Mirrix), I’m working with 37 colours. The setup looks like below. It takes about 3-4 minutes to get all the colours laid out in order (lowest to highest DB number), and put away when I’m finished. I have been using this setup for a while, and it works for me. 5 colours in each row numbered from 1 to 9 then A and up. I’ve used it enough to memorise which letter or number is at the start of each row. I don’t need to count very often I’m so used to it. When I first worked with two mats worth of colours, I stuck a piece of paper to the wall in front. It just had the start number/letter for each row, serving as a reminder. The getting out/putting away can be tiresome, so I need to think of a way to store them so they’re ready to be used without too much faffing around! I’ll have to think about that a bit more. I have done two things with this. The first, and new, is to loom from the bottom up. I didn’t reverse the rows in the word chart so I’m reading from the bottom up! I haven’t confused any rows yet so that’s good. But I think I prefer to work top down. I guess that’s what I’m used to. 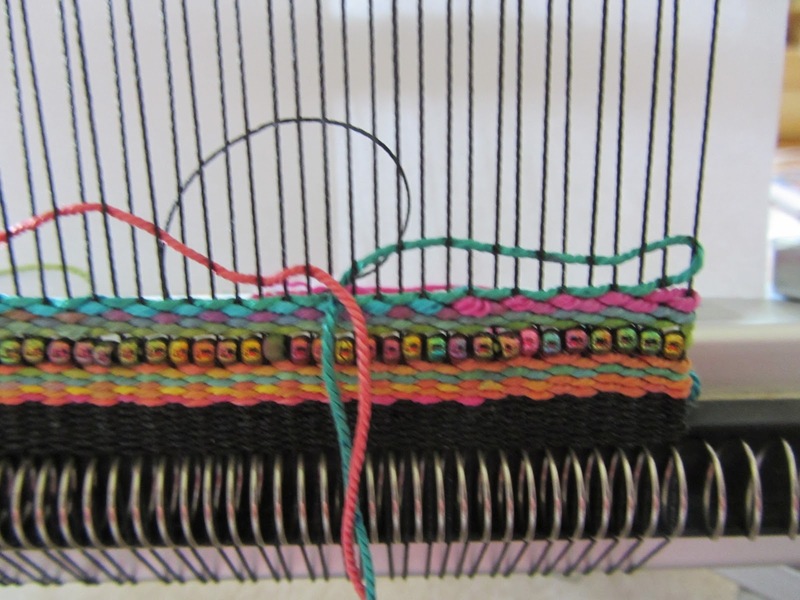 The second is I worked those first rows with a single needle (usual method of looming). 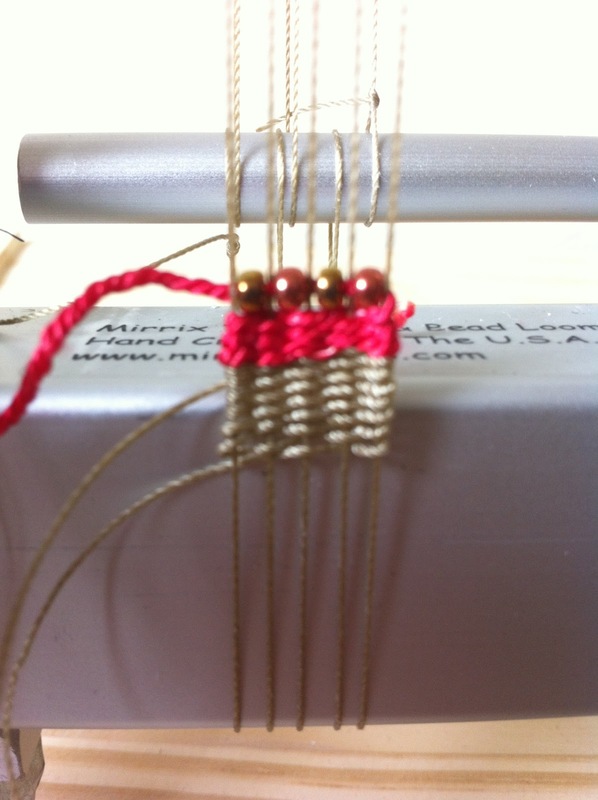 I normally use the two-needle method regardless of whether I’m working on a bracelet or wider piece. The needles travel in opposite directions. There is another where the needless travel in the same direction. That is very useful for areas of solid colour. 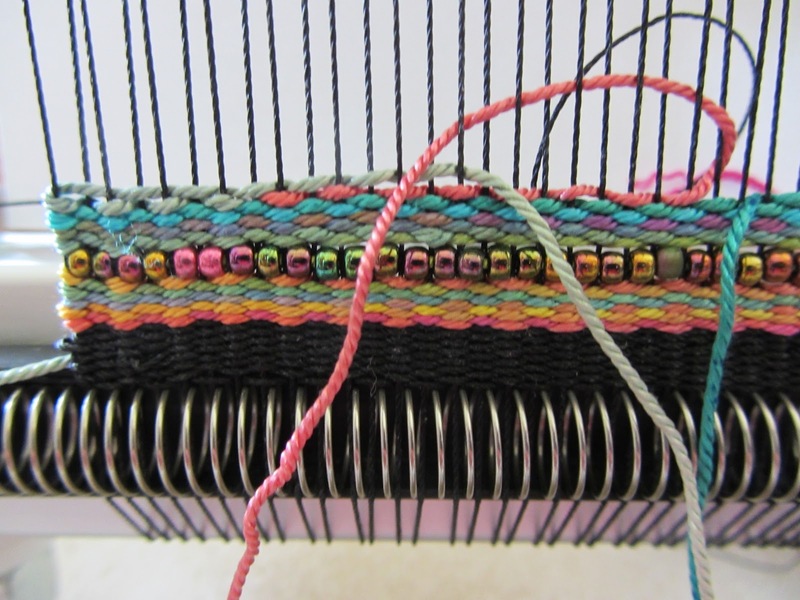 You can load beads onto one half of the weft, and use the other end to pass through to secure them. 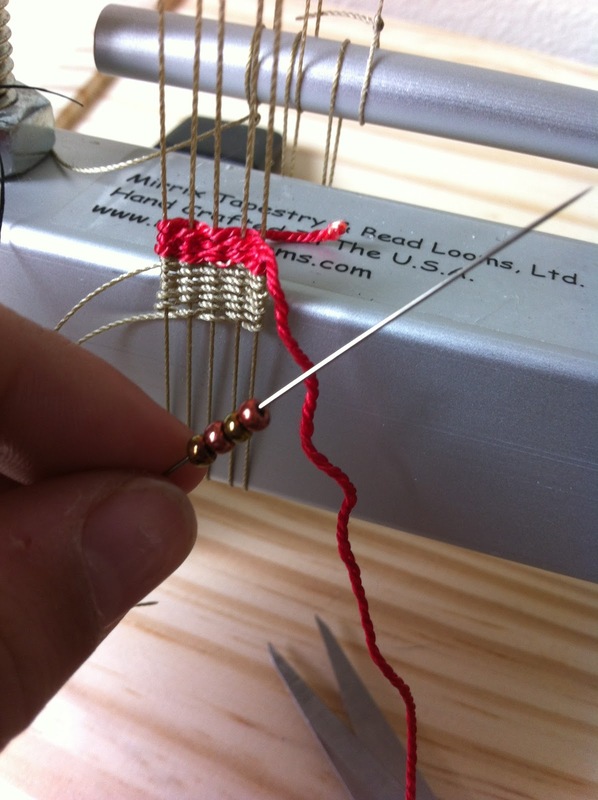 The advantage is being able to use a longer length of thread without fear of it becoming tangled. I also seem to add thread less often. it’s better seen so I’ll try and show it in my next YouTube video. On that note, here is the progress. That’s a hand appearing on the left! The excitement starts now! 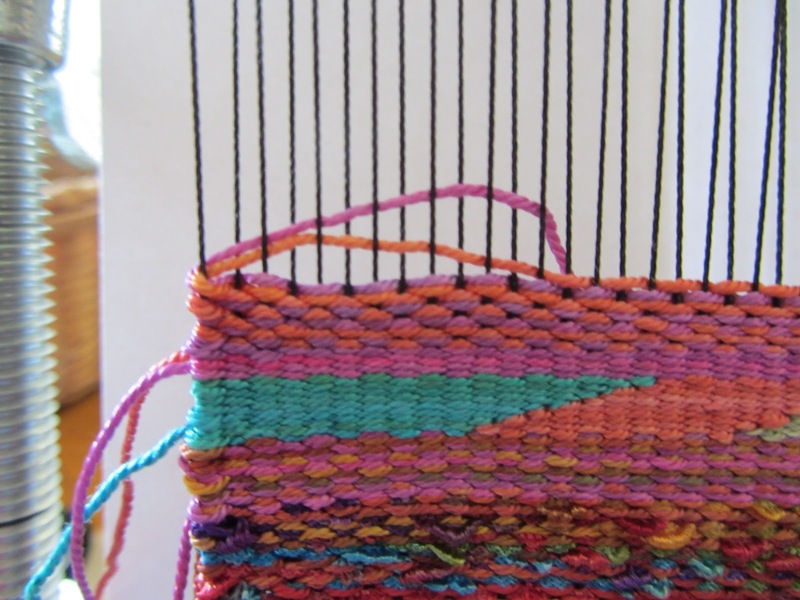 There’s one colour I need more of, so don’t know how much I’ll be able to loom tomorrow. I’m getting more on Wednesday so can continue soon. 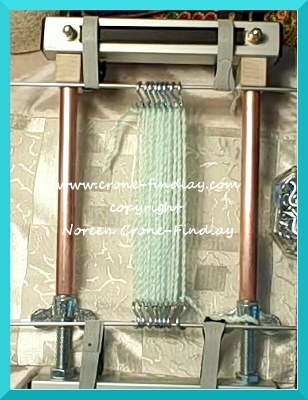 If you have a bottom spring kit, as I do here, start weaving your header. 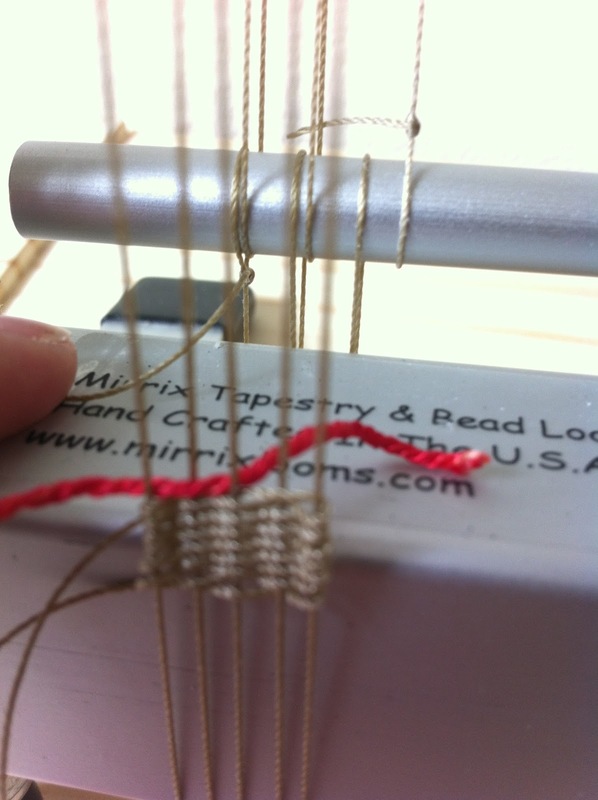 If you don’t have a bottom spring kit, cut a thread three times the width of your loom. Engage the shedding device, weave it to the threaded bar, wrap it around the threaded bar, change the she and weave it back to the other threaded rod. 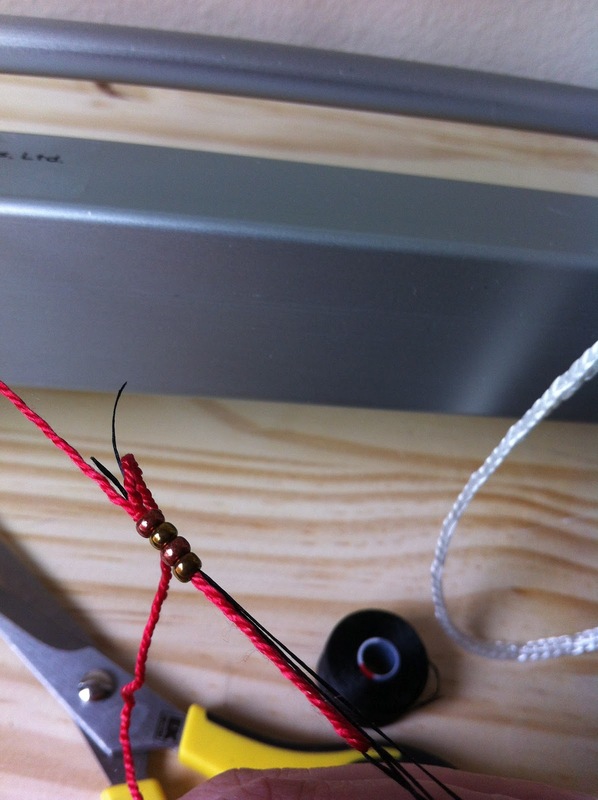 Tie the two ends tightly around the threaded bar. 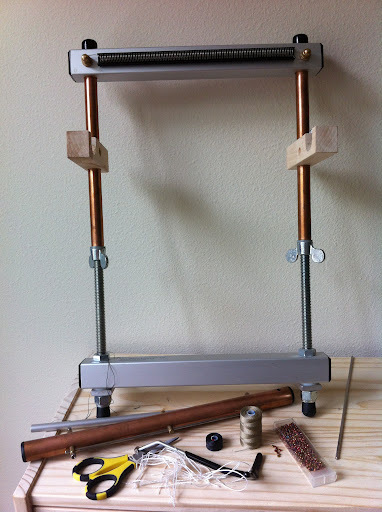 This will serve as a base for starting your weaving. Make sure the two threads make a straight line. 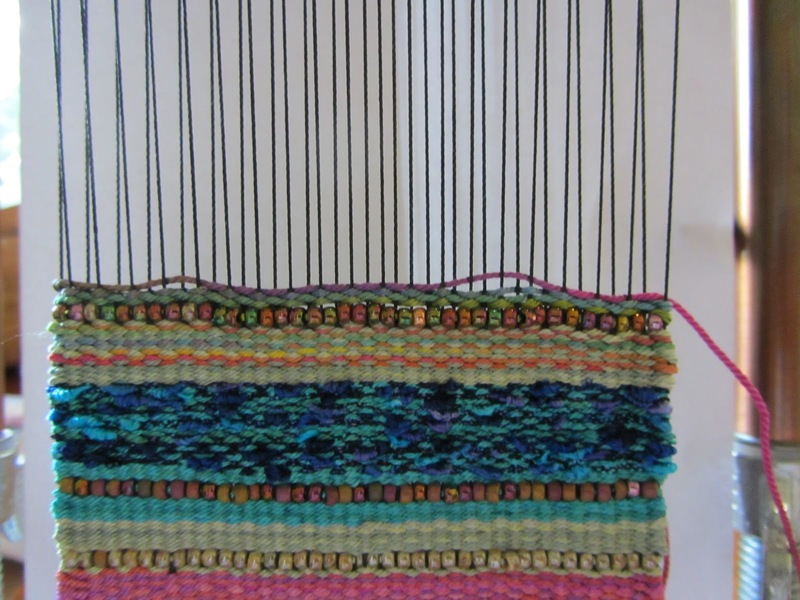 Arrange the warps so that they are evening spaced at ten ends per inch. 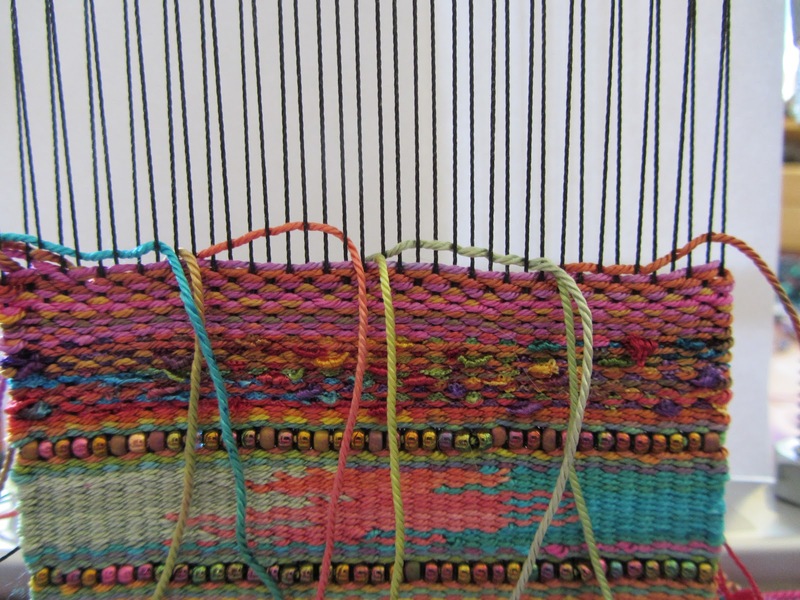 Then begin weaving a header. 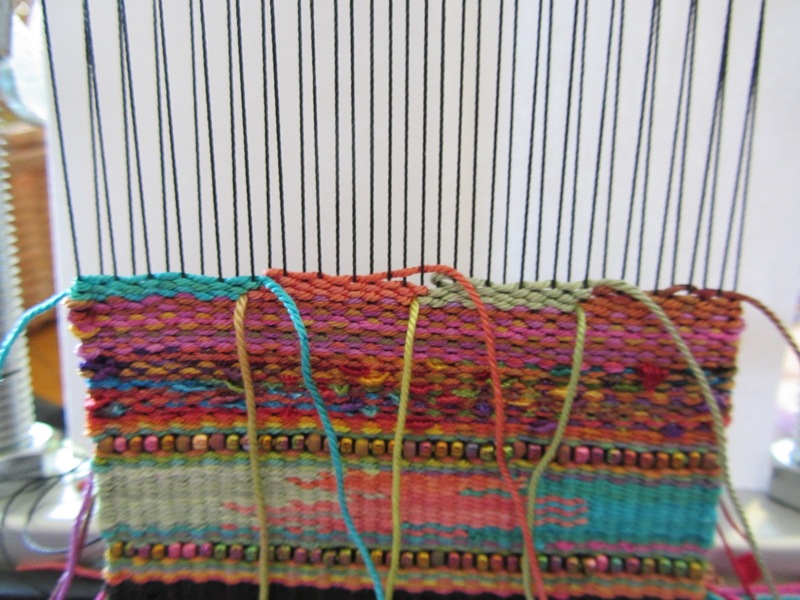 Two weave a header: cut a manageable length of warp thread and weave it back and forth for about a third of an inch. 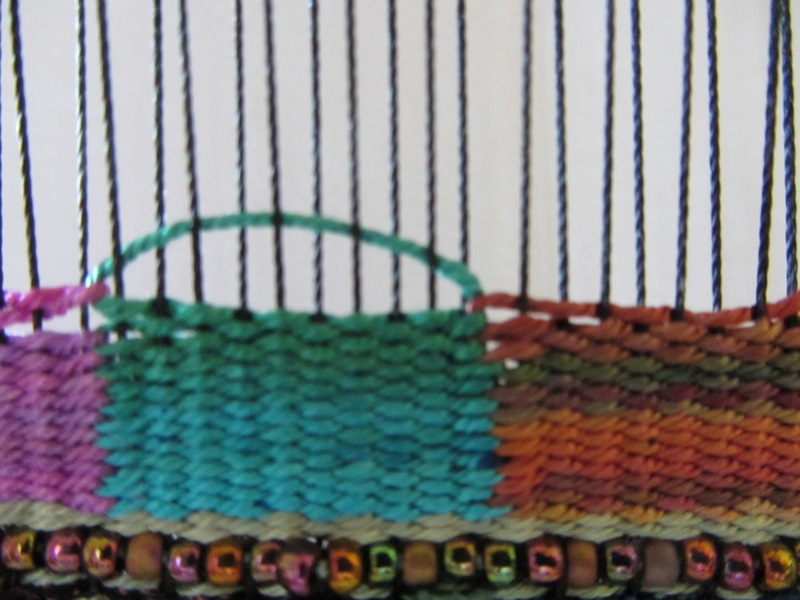 This header will be folded over to the back of your weaving when you finish your piece. 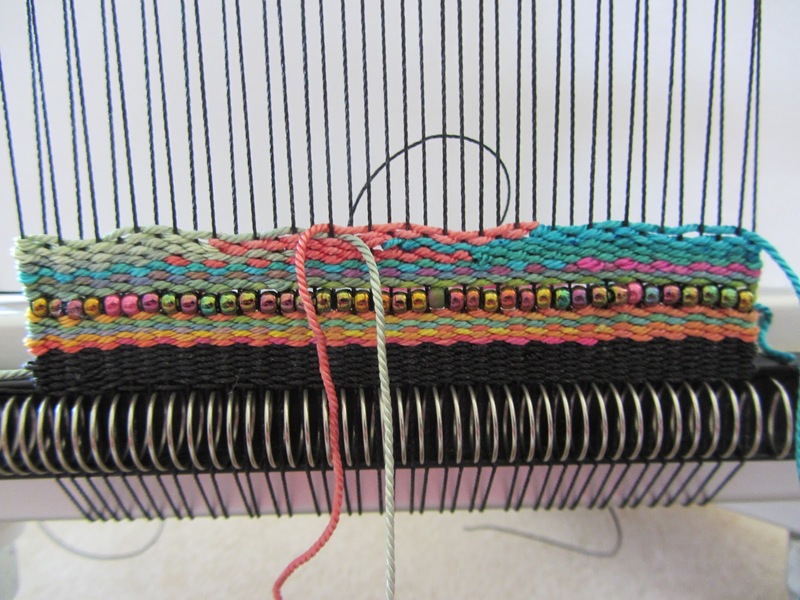 Be mindful to not pull too tightly at the sides of your weaving but also to not leave loops at the edges. Beat it down with a tapestry beater or, if you don’t own one a kitchen fork. 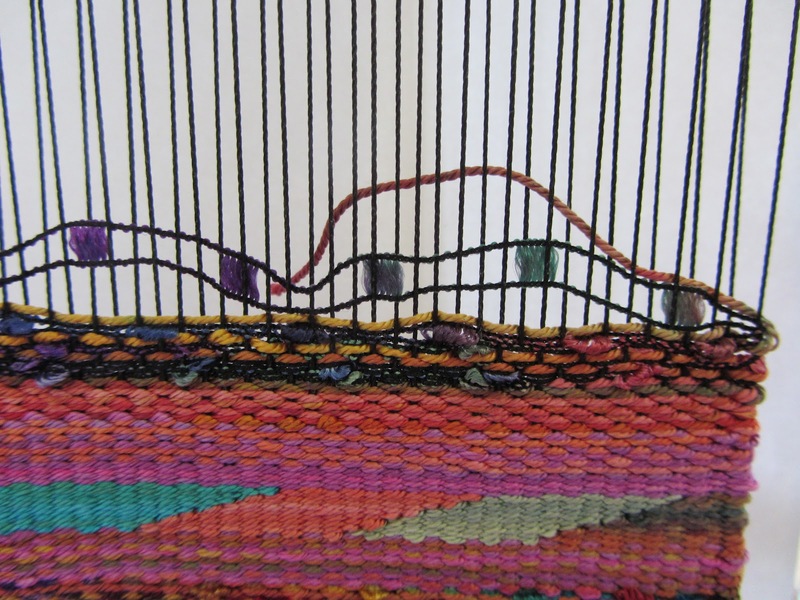 End your header about six warps in and begin a weft of just silk where the header ends. Remember, you always want your ends hanging to the back of the piece. You will begin new threads when old ones end, if possible. The back will not show. It will be lined in silk. So it can be a complete mess. 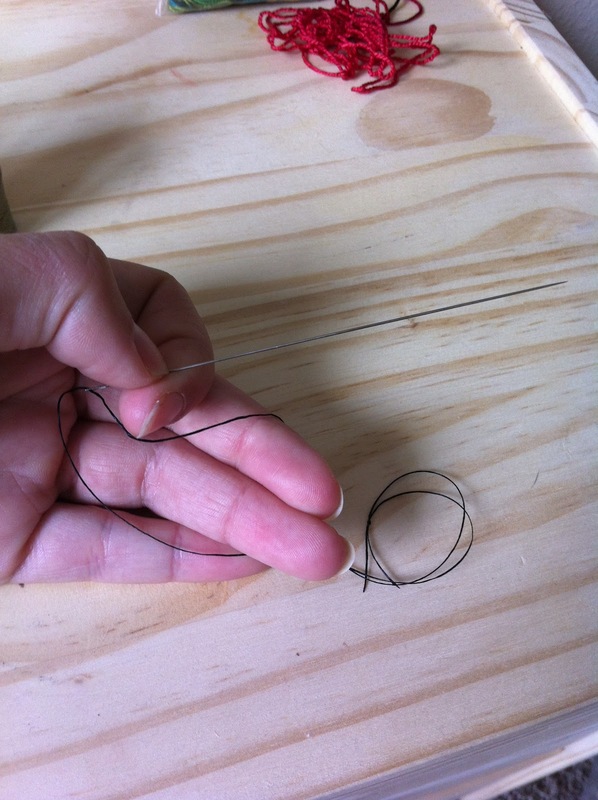 Thread a beading needle with beading thread. Tie a knot so that it forms a loop. 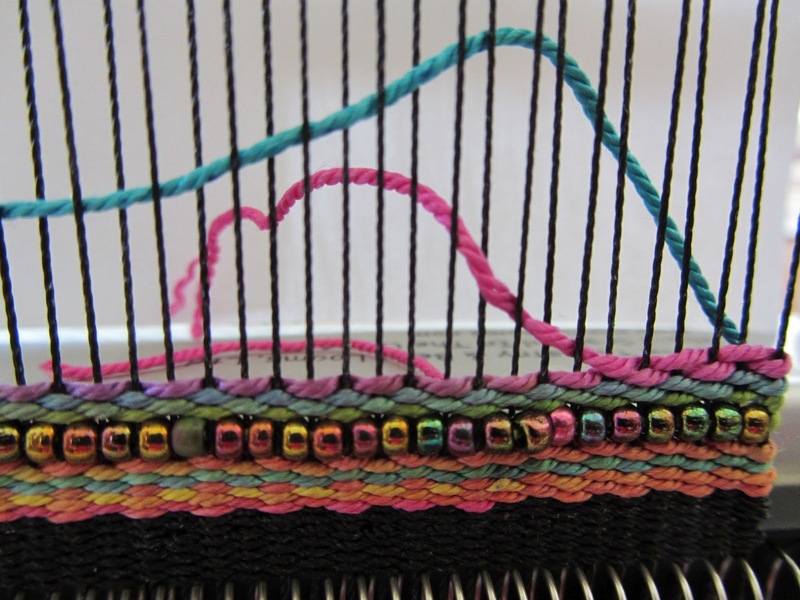 Loop the silk weft into the loop and load your beads onto the needle. 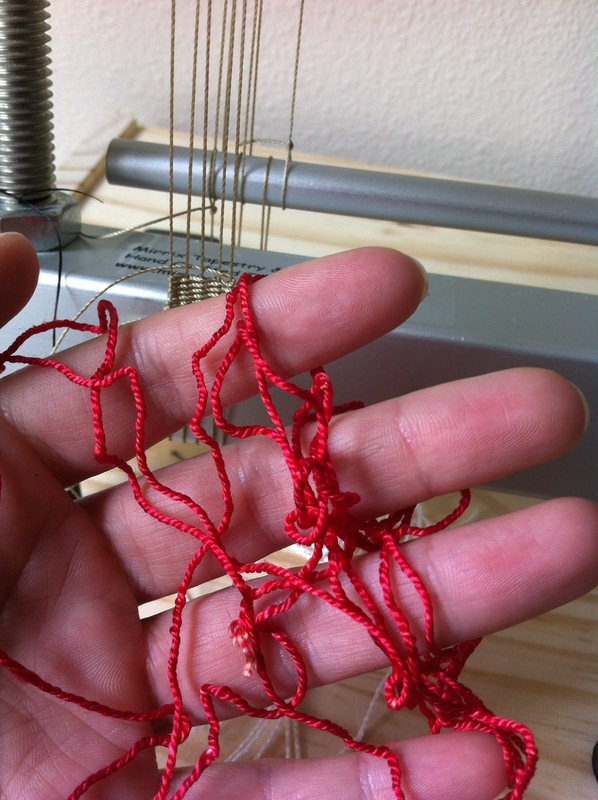 They will easily slide onto the silk weft. 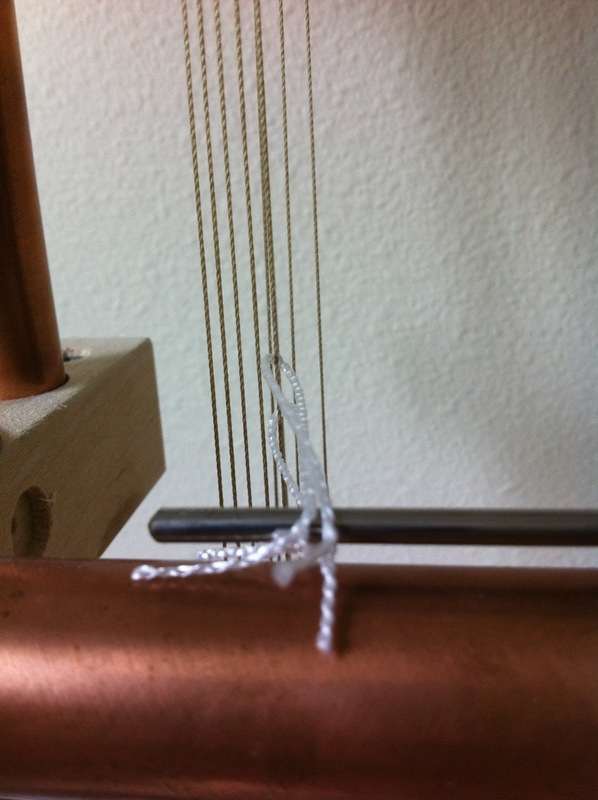 Place the strung beads into the shed (the space between the raised and lowered warps) and push them down into the V. Pull tightly on the silk weft so that there is no loop at the end and it is wrapped snugly against the opposite warp thread. 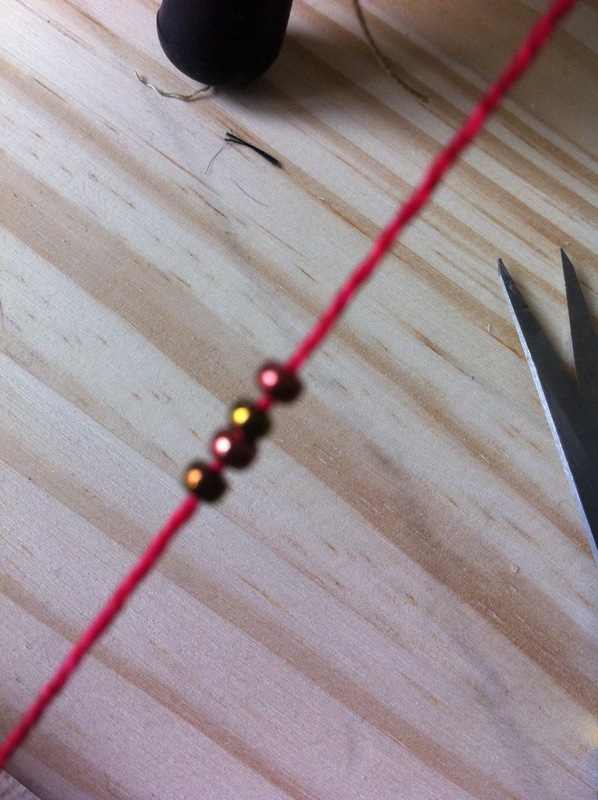 The beads are hard so they will prevent your from pulling in at the edges. 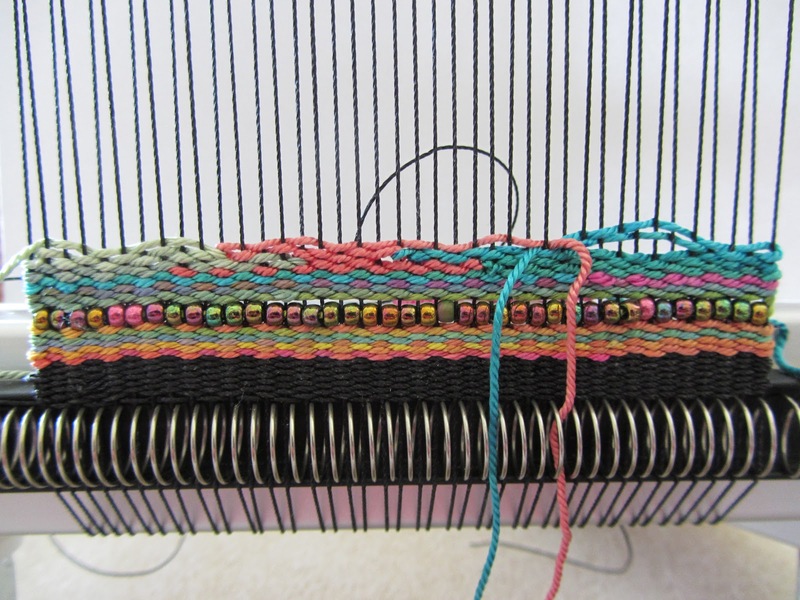 In fact, if you warp was at all uneven, the beads will even everything out nicely. 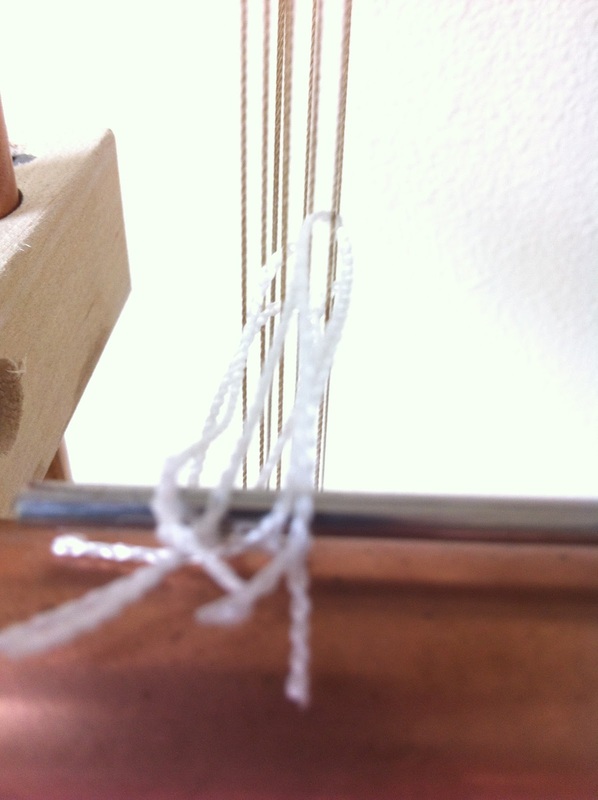 Warp the silk around the warp thread to keep that last bead in place. 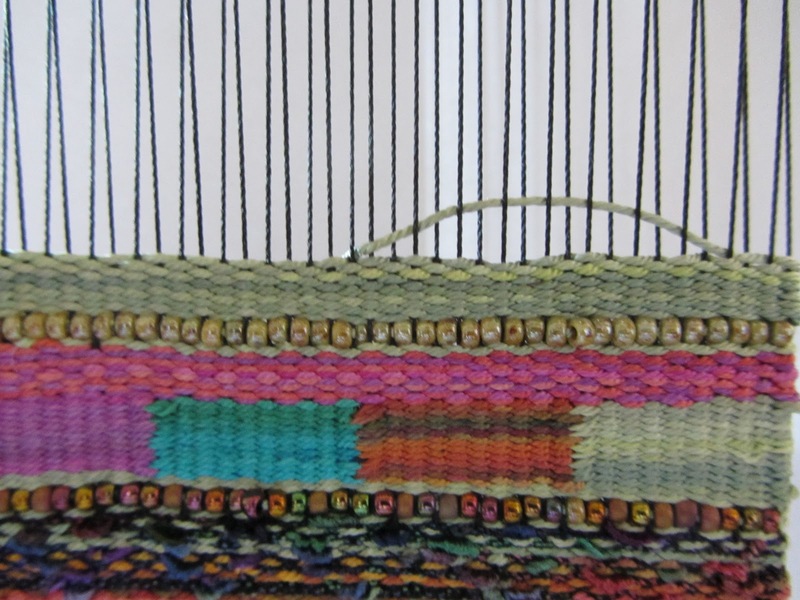 Change the shed and weave the silk weft to the other side. 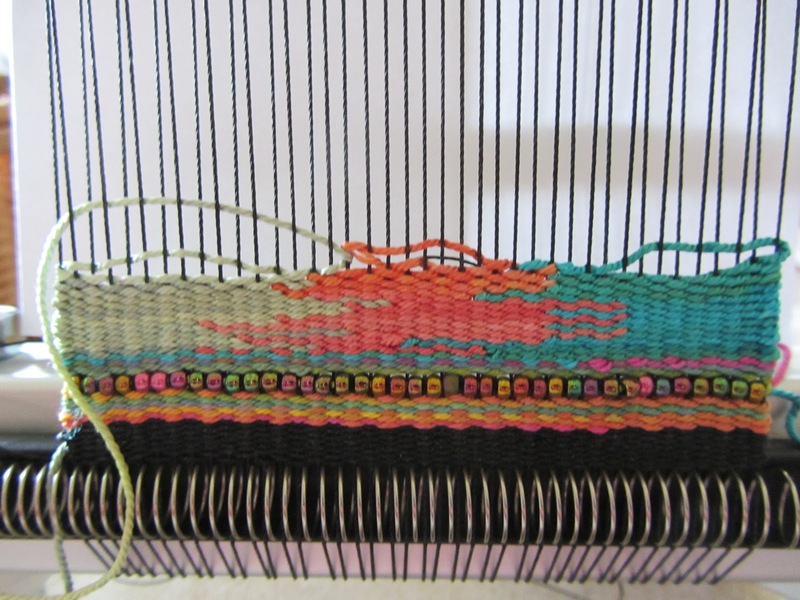 Weave until your run out of weft and then begin a new color where the original weft ended. Weave that color for two passes. You are now ready to add a second and third color. You will be inserting these two additional wefts in opposite directions. 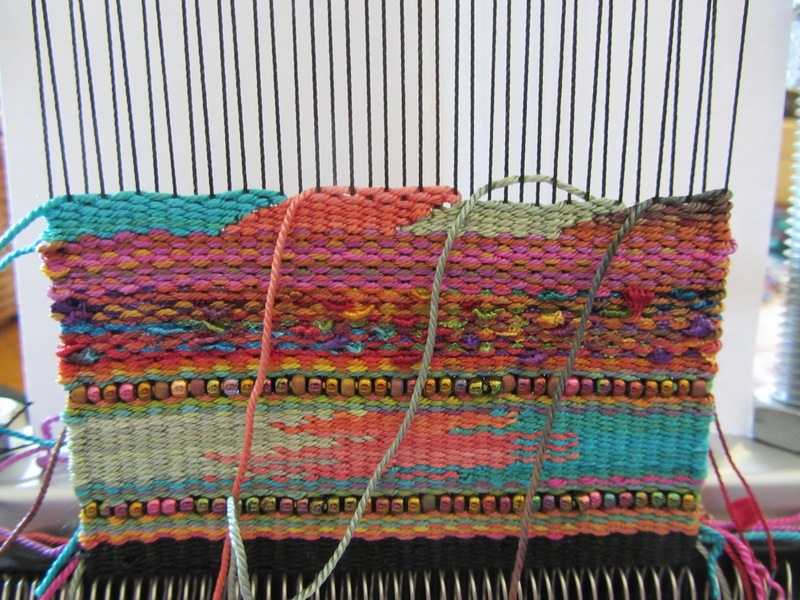 The second weft (the salmon colored weft in my example) will head toward the existing turquoise weft. 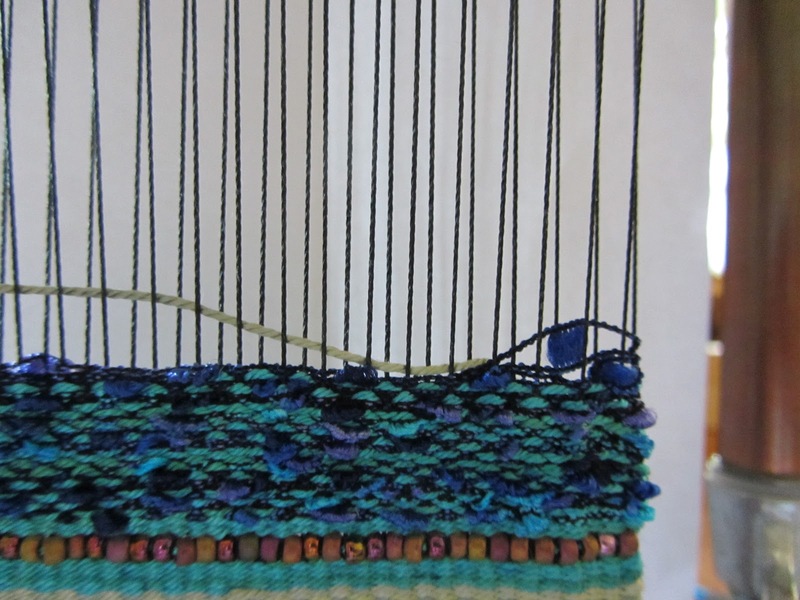 The sage weft will be headed away from the turqoise weft. 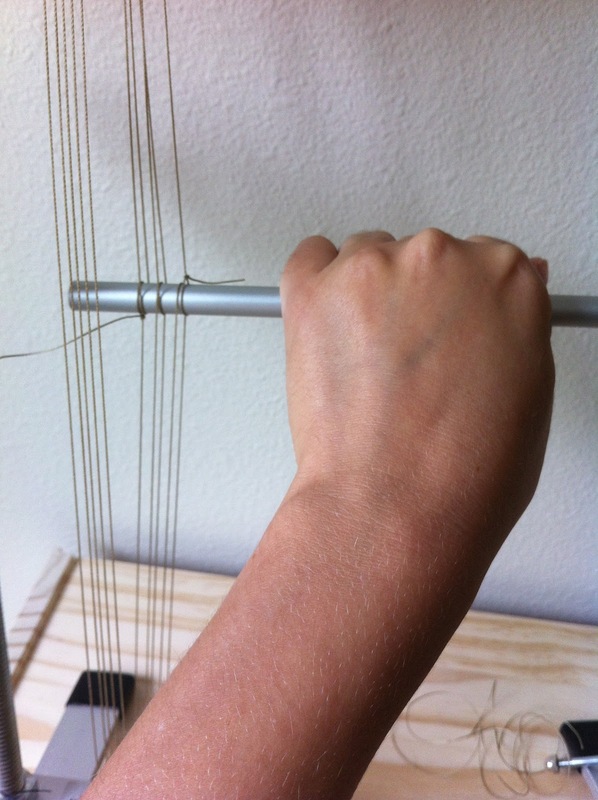 By doing this, your wefts can cross into each other’s territory and still be in the correct shed. This is a kind of difficult concept to understand before you’ve played with it. 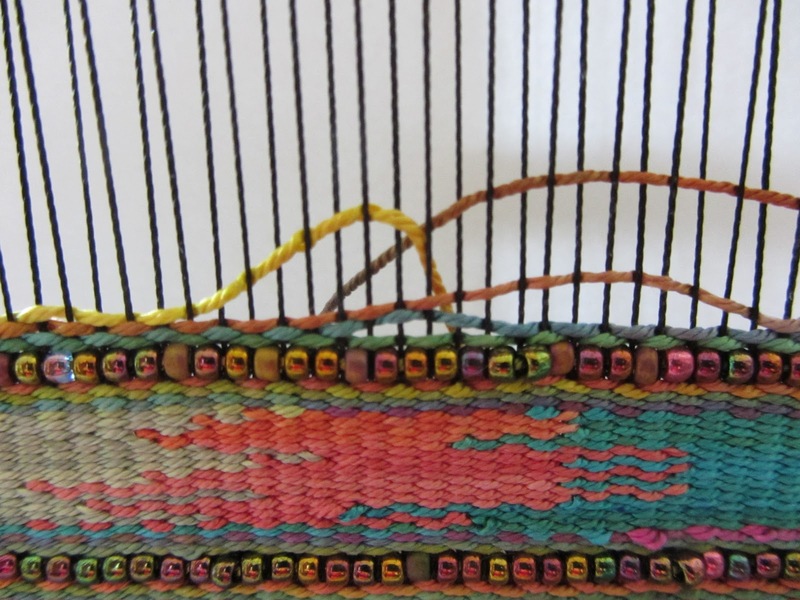 So now that we’ve got our silk wefts in place, let’s play with them. 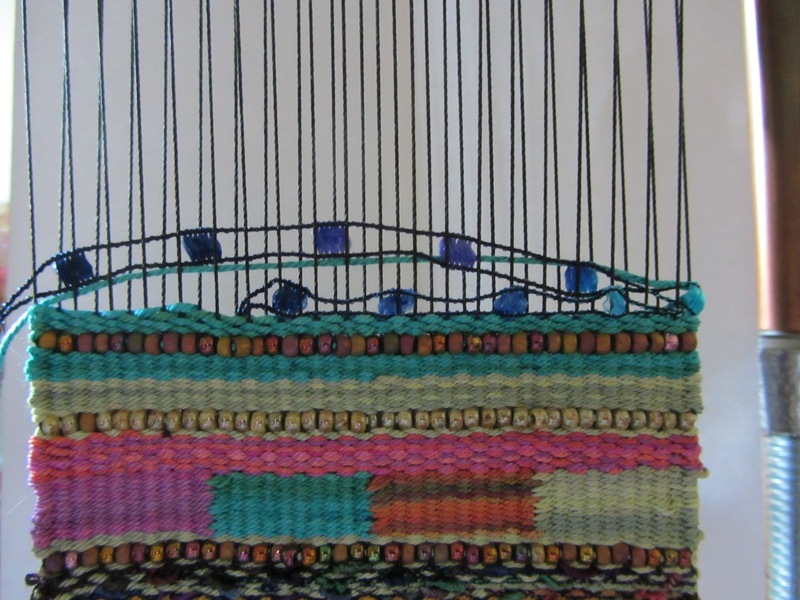 Weave the sage weft into the salmon wefts territory but don’t go past the tail of the salmon weft. 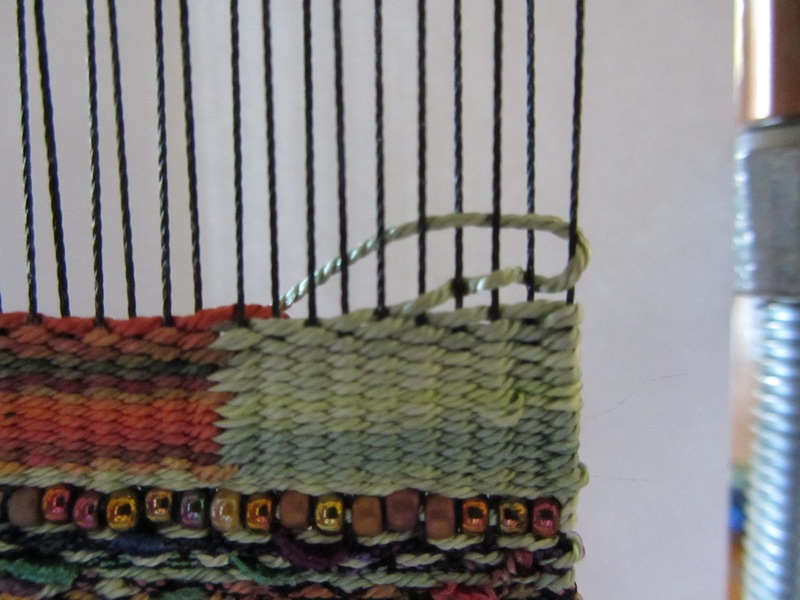 Weave the salmon weft back to meet the sage weft, wrapping around a common warp. 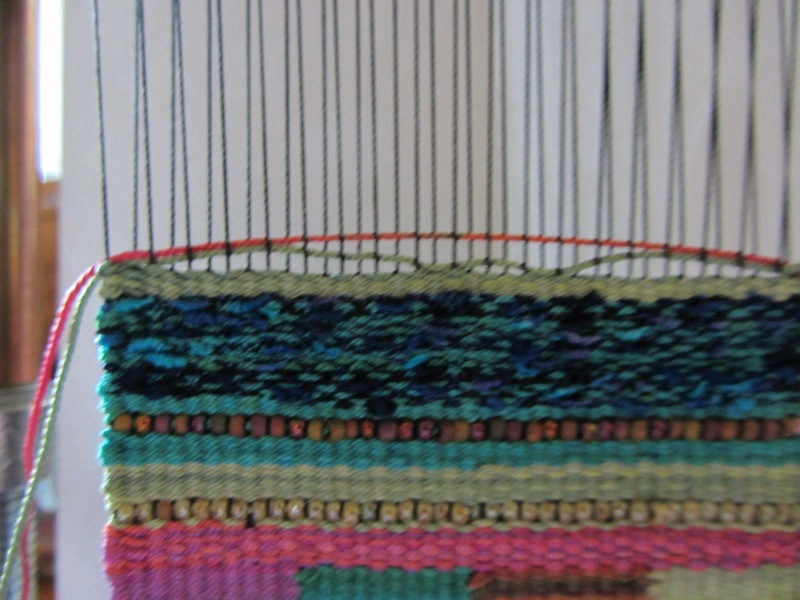 Weave the turqoise weft back to the right. In this case, I’ve wrapped it around the next door warp but could have wrapped it around a common warp. Keep playing with this method for a while. 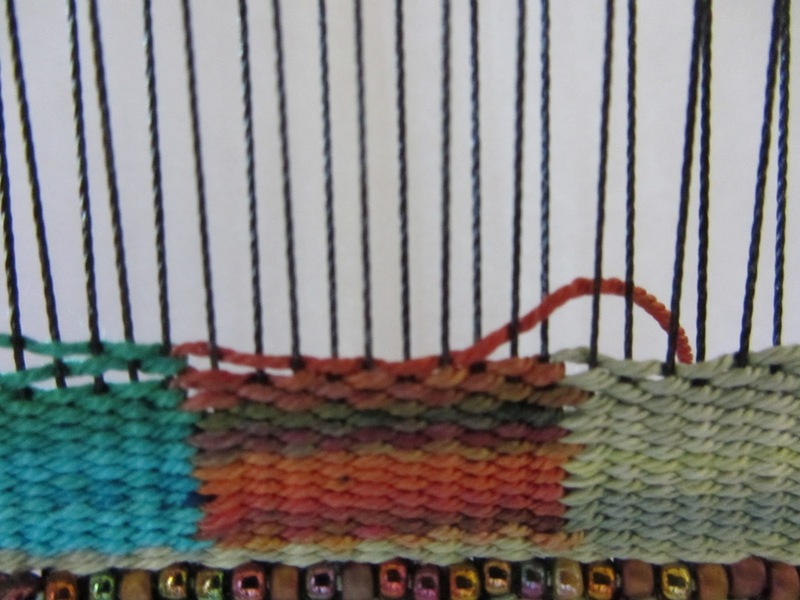 I will show you pictures of each row I weave. As I mentioned, you can either wrap around common warps or not. 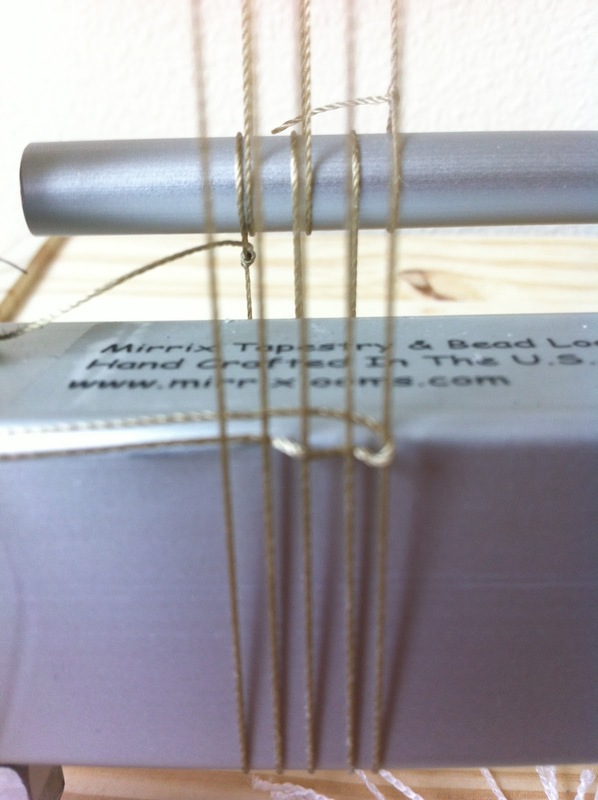 For this technique it makes little difference although one does have a natural tendency to wrap around common warps. 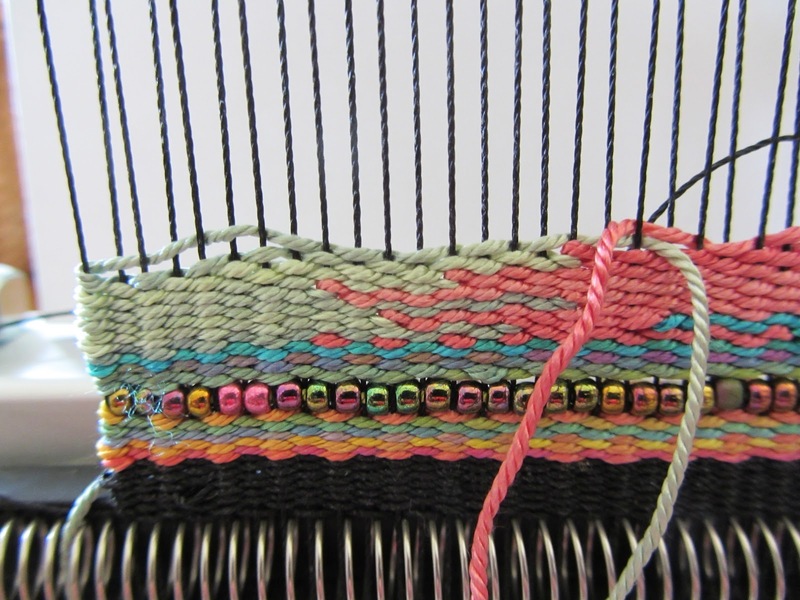 Weave several wefts in opposite directions. Create shapes (note the salmon shape you’ve created). 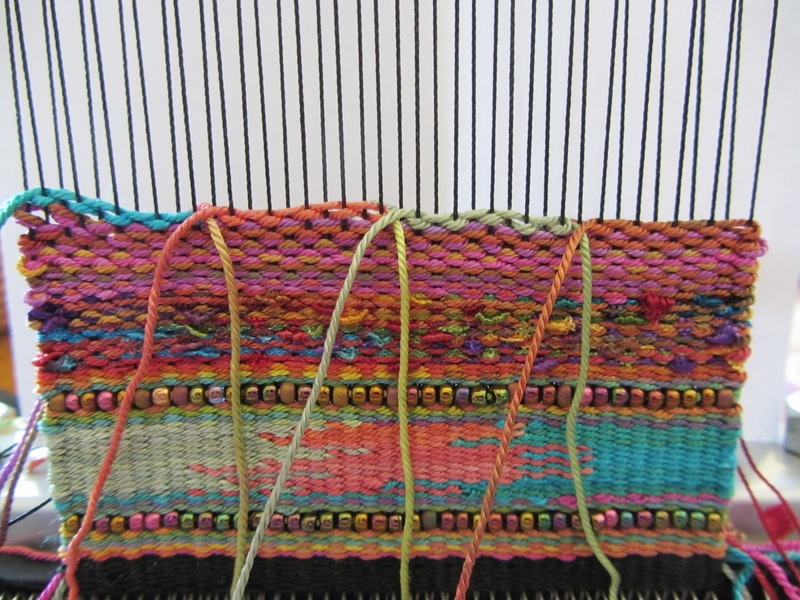 To end the three wefts, first weave the right ones toward each other and end them by sticking their ends to the back of the weaving. 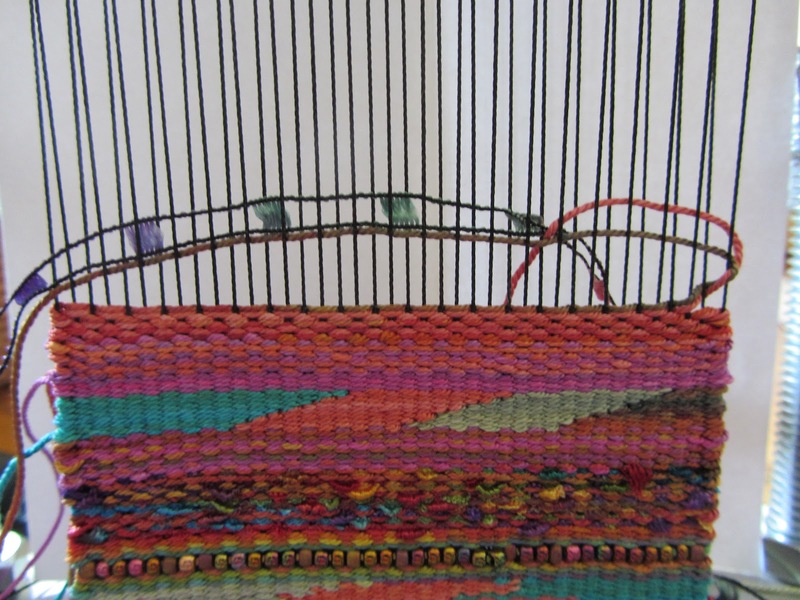 Then weave the left weft to the left warp. 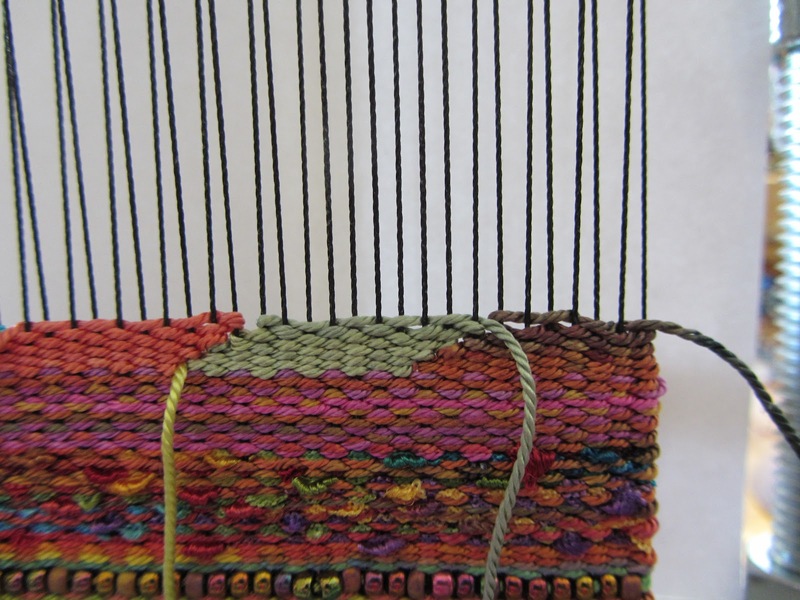 Weave it until it is used up and then replace it with an entirely new color. I used the color we began with. 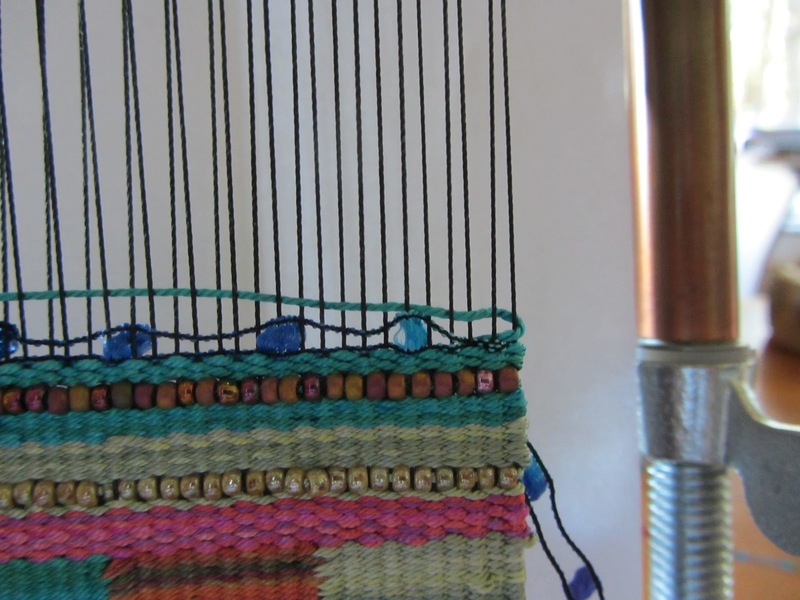 Weave a few passes and then thread with beads and weave a row of beads. 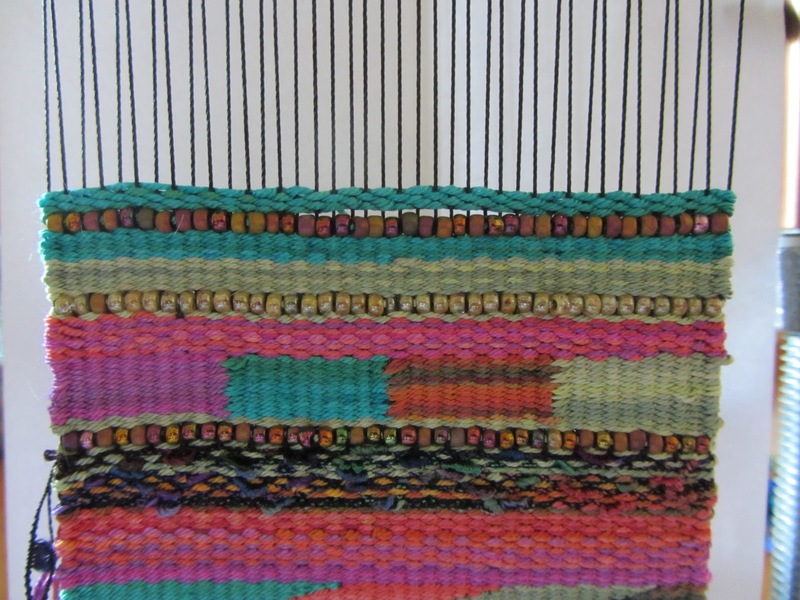 Weave the silk weft until it runs out. 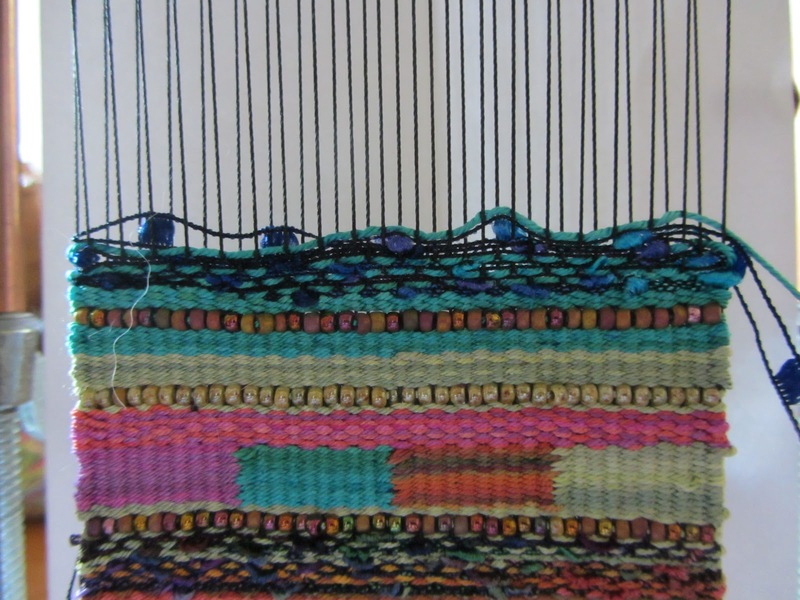 Add another silk weft and weave a couple of rows. 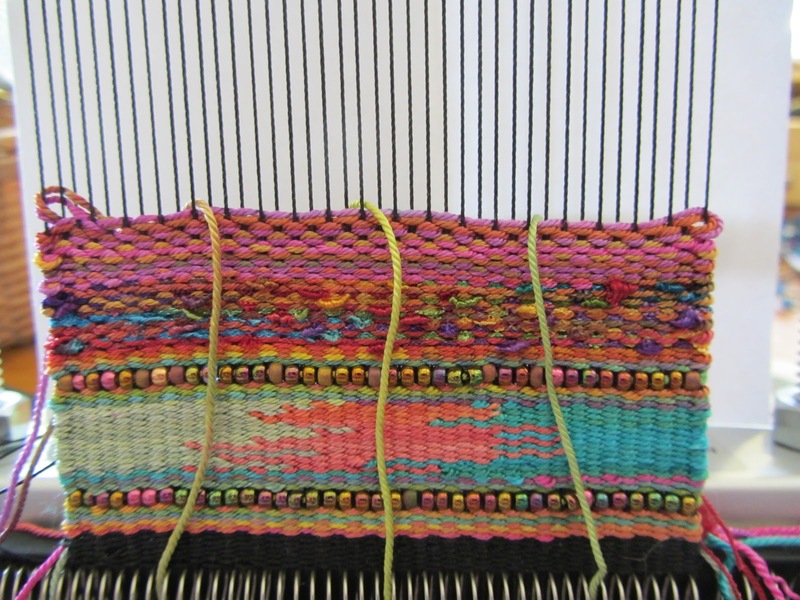 Add some railroad yarn to the silk and weave the two at the same time. 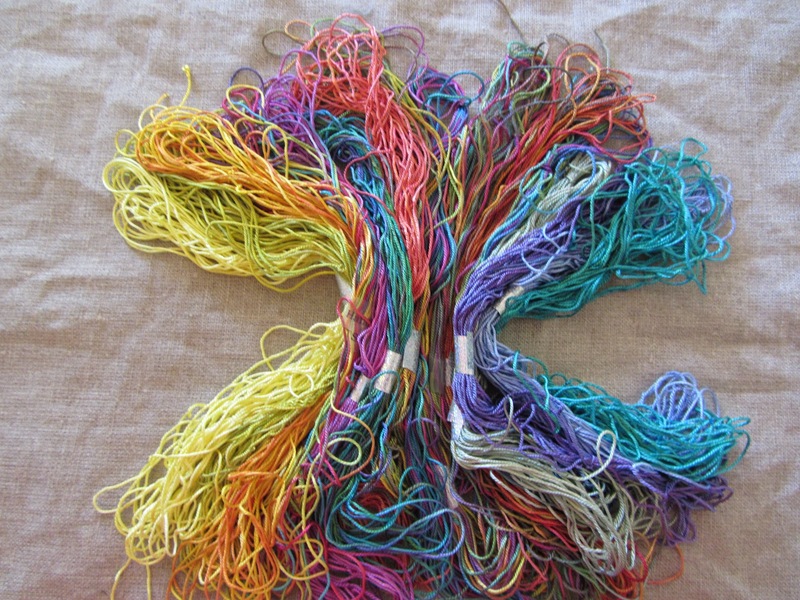 This will add both texture and some great color to your piece. 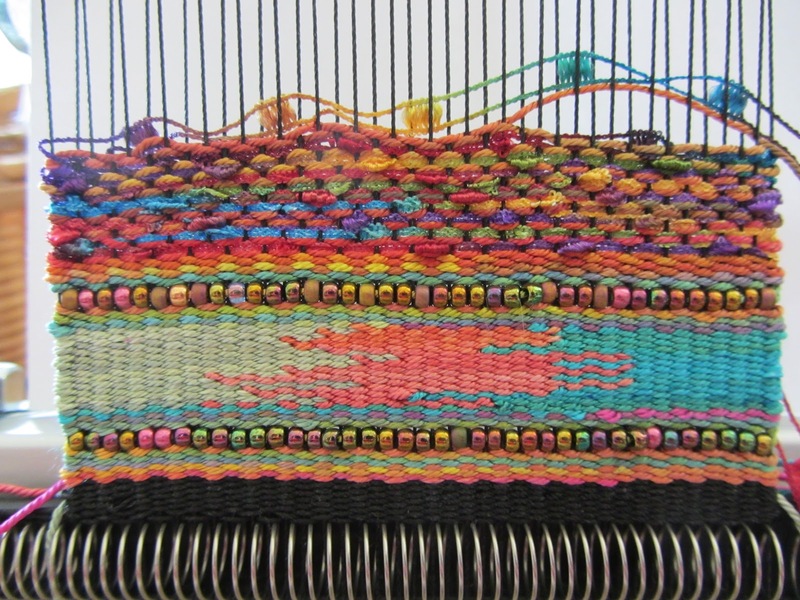 End the silk/railroad combination weft and replace with two different colors of silk also to be woven at the same time. Next we are going to weave sections of diagonal shapes. 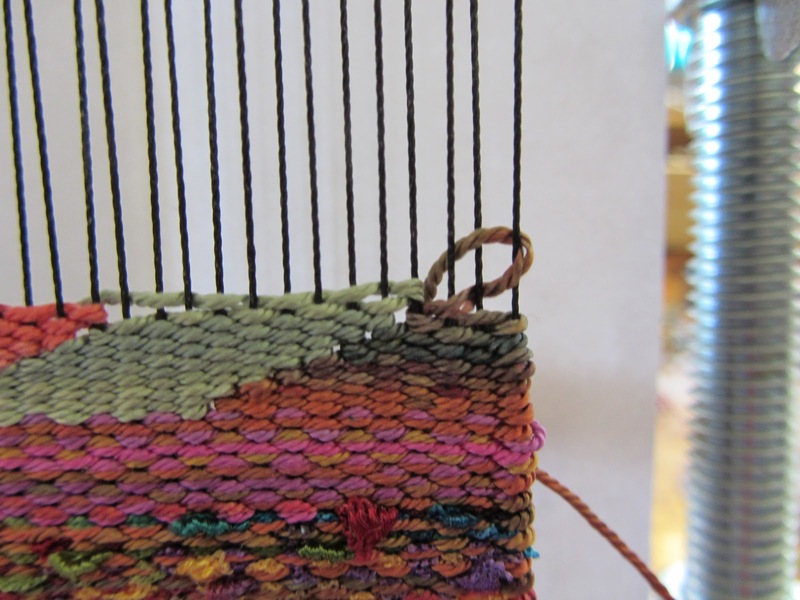 End the double silk weft by wrapping around the outside warp so it hangs to the back of the piece. 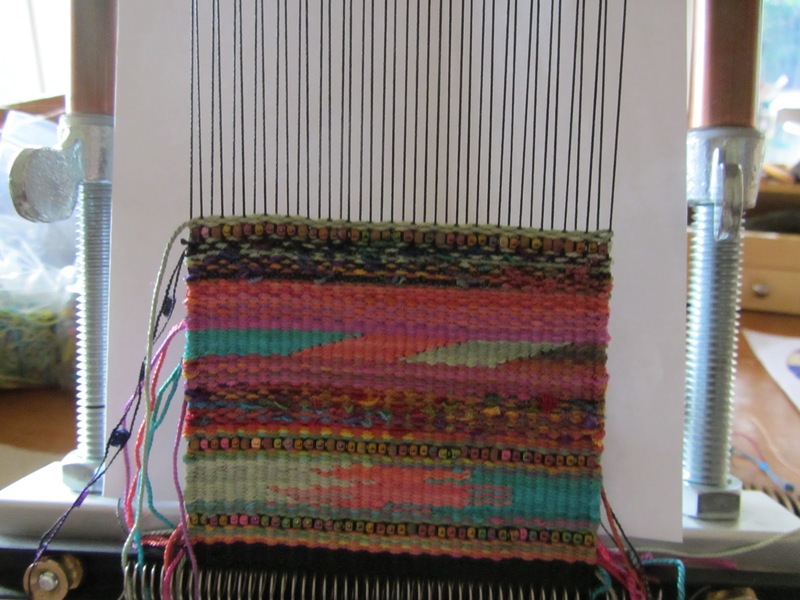 My piece is 40 warps so I will make each shape 10 warps wide. 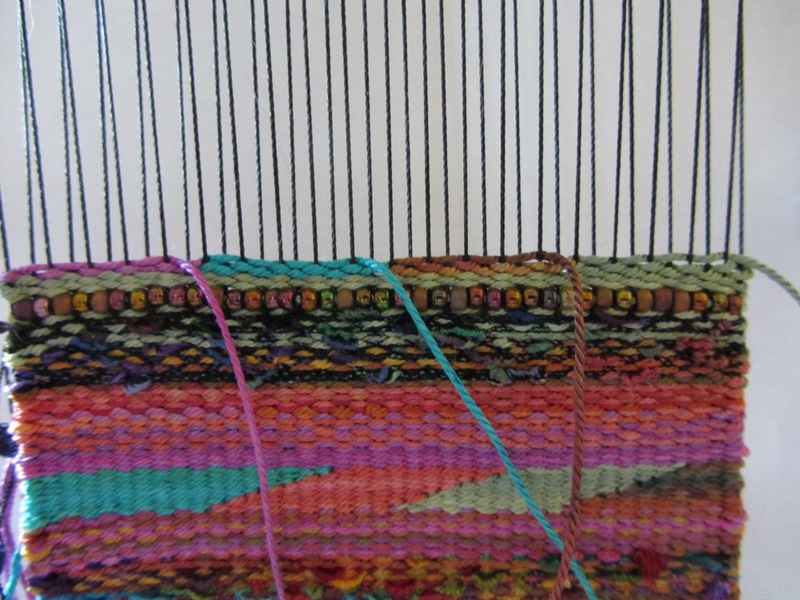 The best way to guide yourself through this is to stick markers in the warp so you can see where you will begin and end a shape. 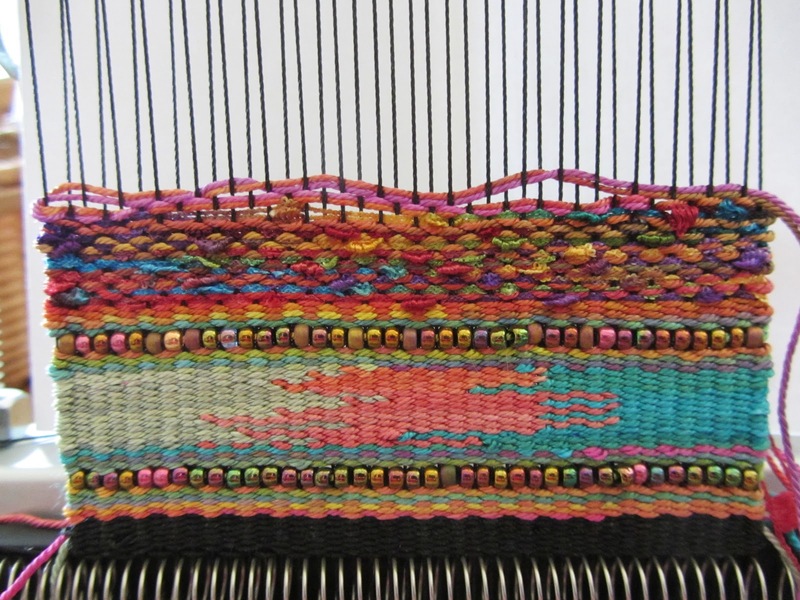 You are going to be weaving these four single silk wefts in the same direction. 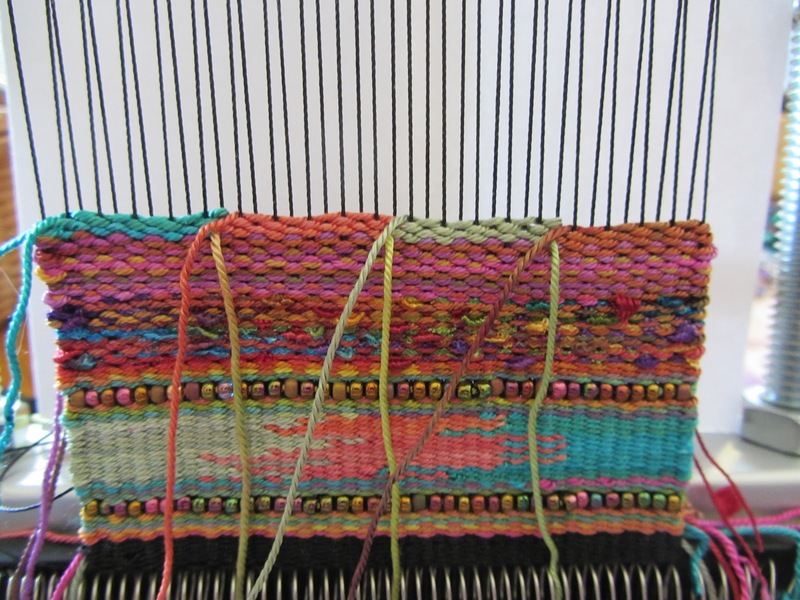 Start like this: The four wefts begin and end where the markers are. 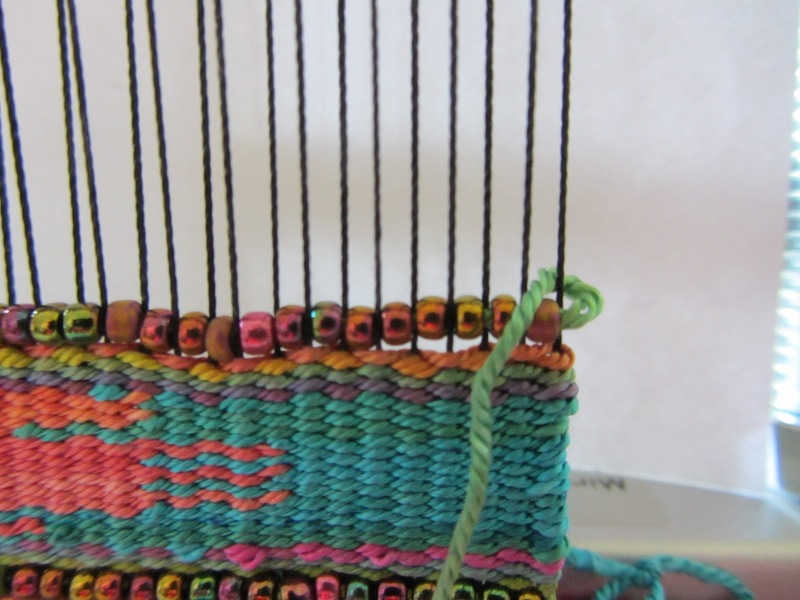 Weave the right weft to the left first. 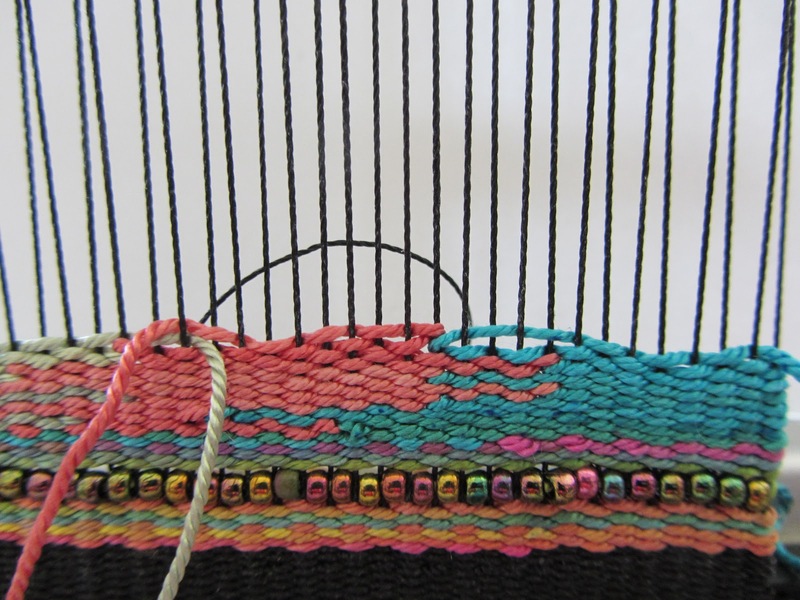 Weave the next three wefts in order to the left. 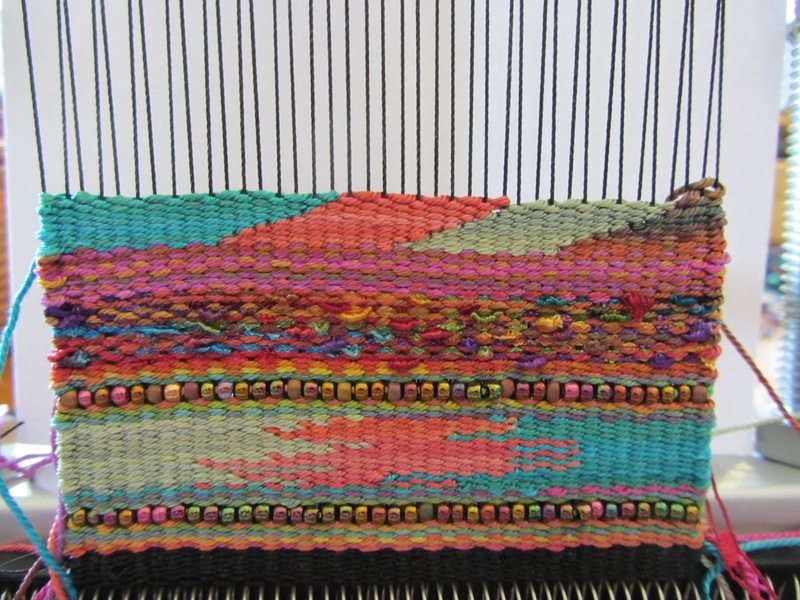 Next, weave the left weft to the right but weave over one more warp. 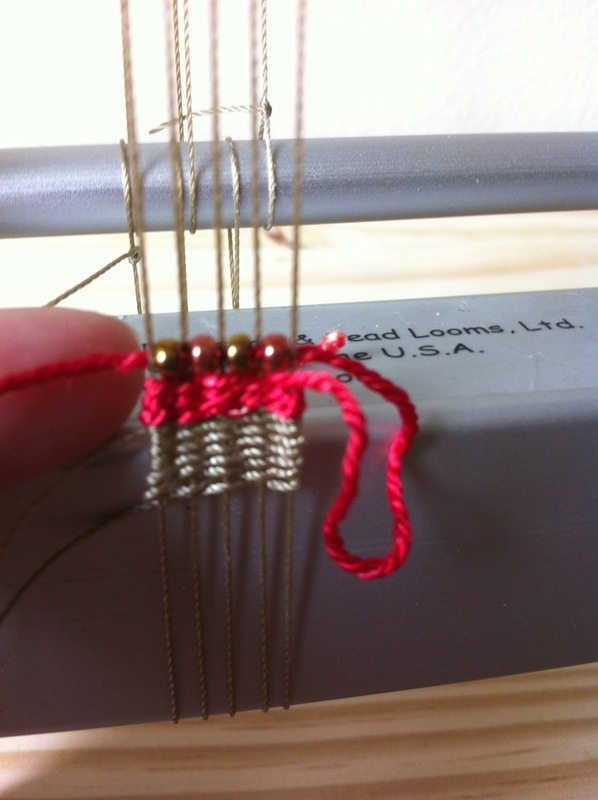 Do the same for the other three wefts. 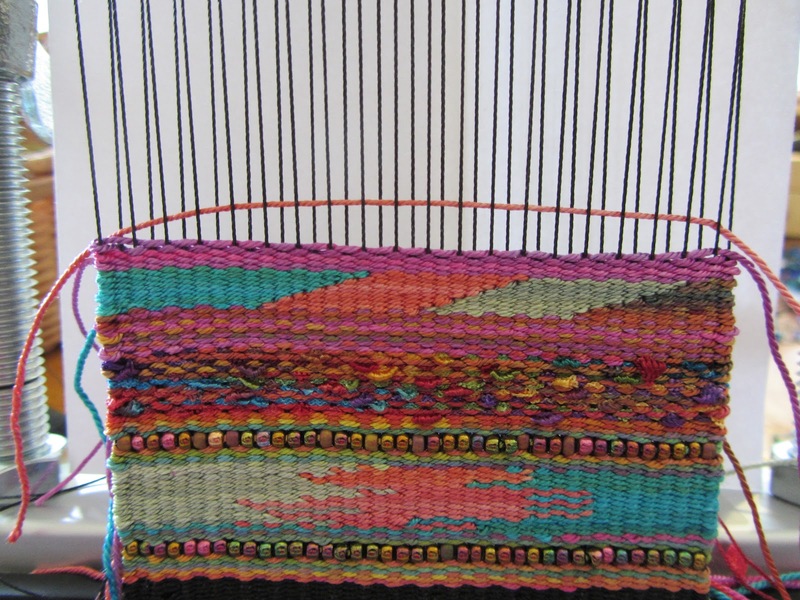 The goal is to create a diagnol shapes by weaving over one warp when you go to the left and reducing by one warp when you weave to the right. Follow the pictures. Your left shape is gong to get bigger and bigger whereas your right shape is going to shrink. At some point you can remove the guide threads as they won’t be necessary. 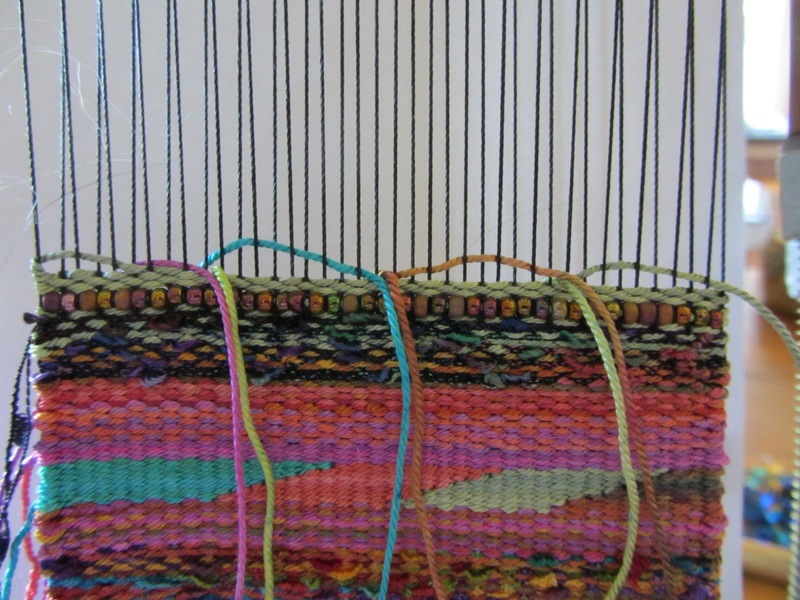 To end the left weft wrap around the end warp so it is hanging to the back. Weave back all the other wefts. 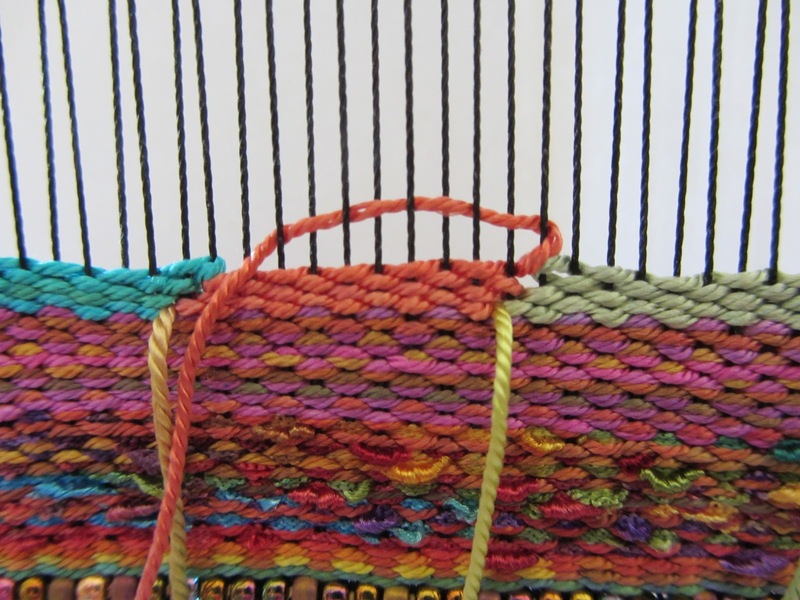 Stick the ends of the other wefts to the back of the piece. 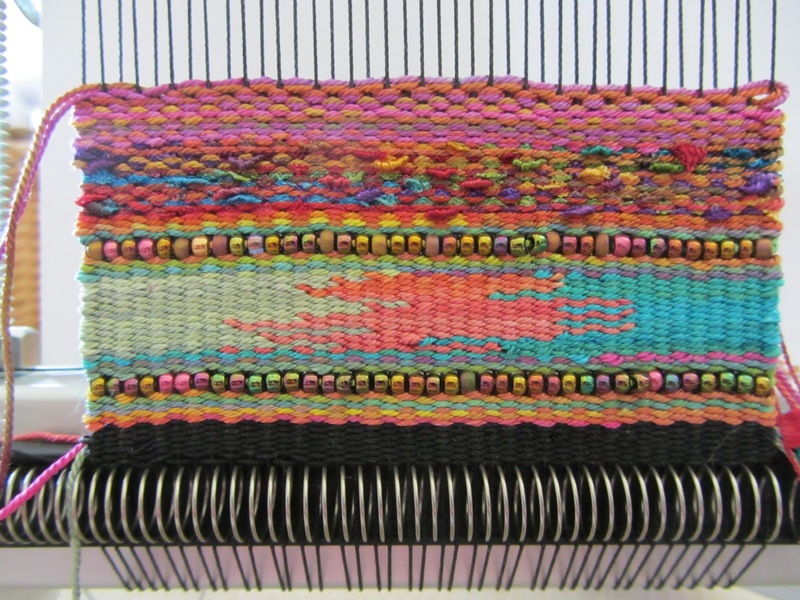 Insert a new silk weft. Weave it for a few passes. 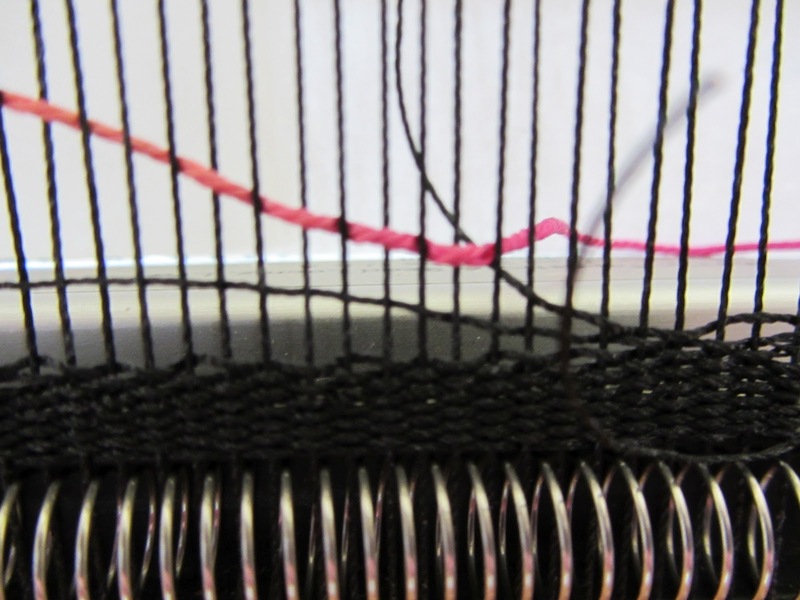 Add a second weft to the existing weft that is longer. Weave until you run out of the first silk. 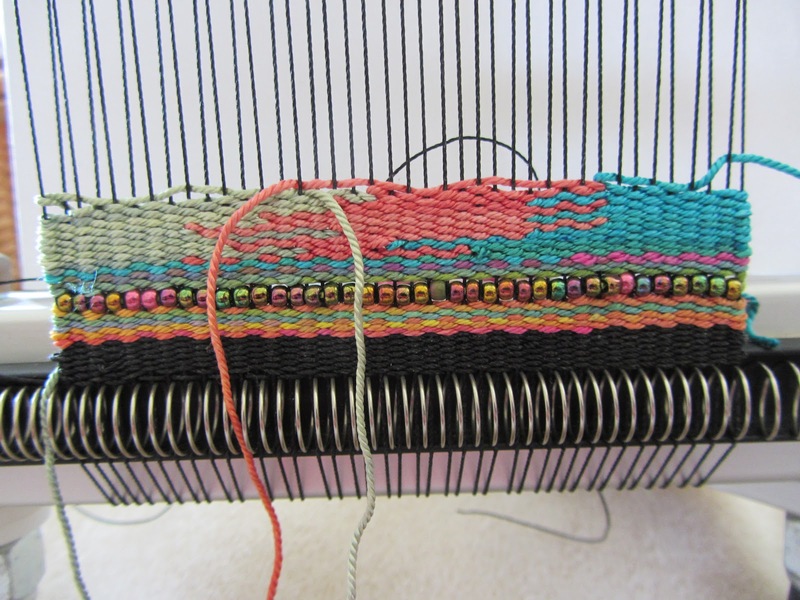 Replace with a new silk weft to add to the existing weft. 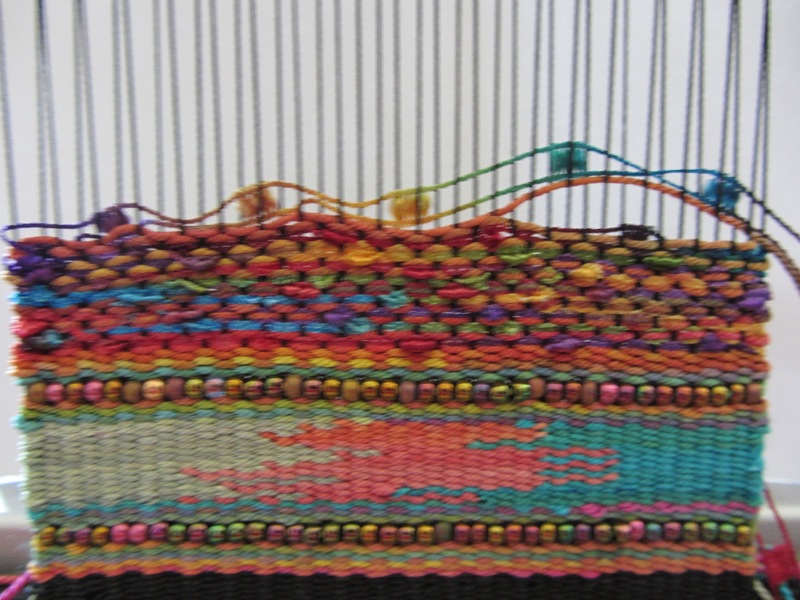 Weave until you run out of one of the silk threads and replace with railroad yarn. 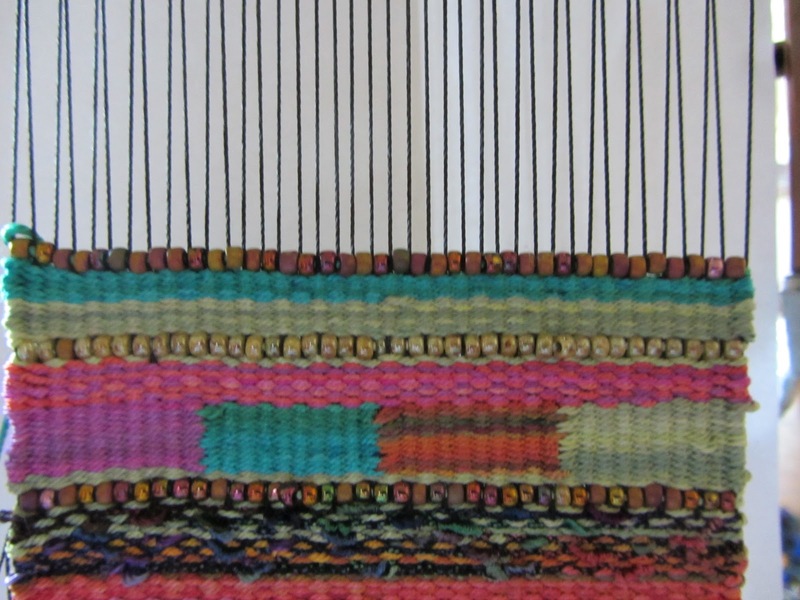 End the railroad yarn and replace with silk weft. 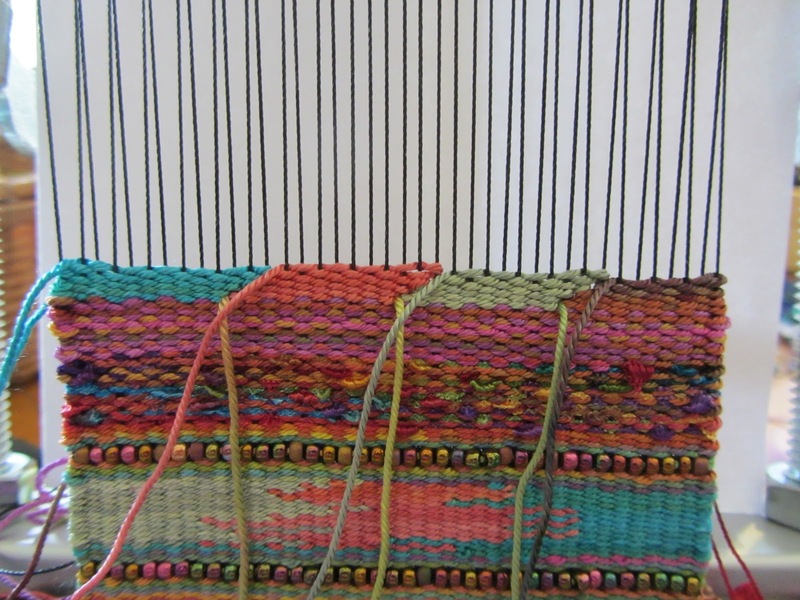 Weave a couple of rows of silk weft. You can continue to play with adding and replacing wefts. I will be teaching additional techniques but they can be anywhere on this piece. 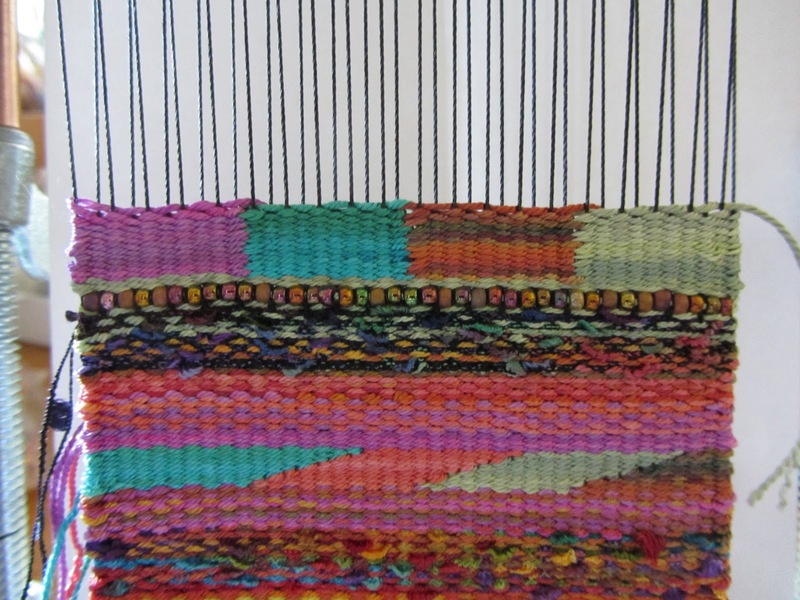 What we have just woven will actually be the flap of your piece. Or you can wait until next week and weave along with me. 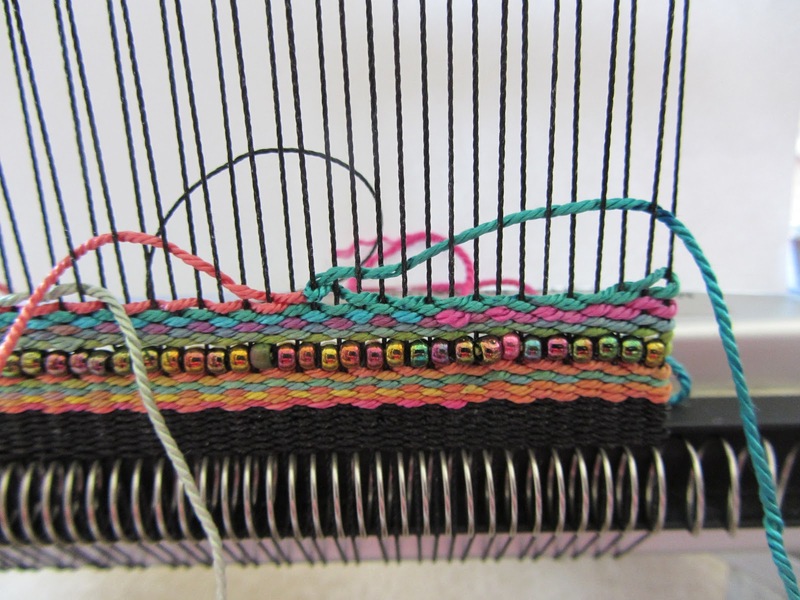 I am fascinated by exploring all the different things that I can do with Mirrix looms. 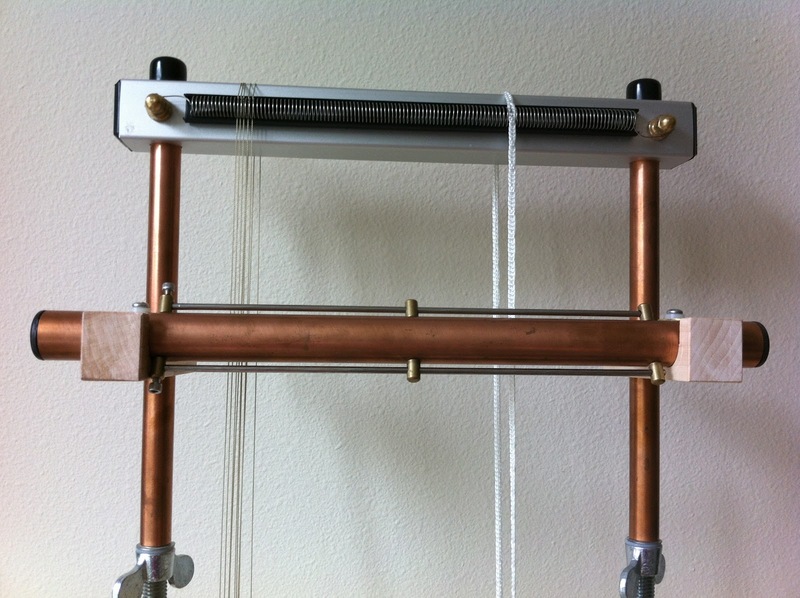 While I am involved in this four month long co-creation with Mirrix looms, I am going to be looking at what I can and can’t do with the Mirrix looms. (Guess what I am NO GOOD at? 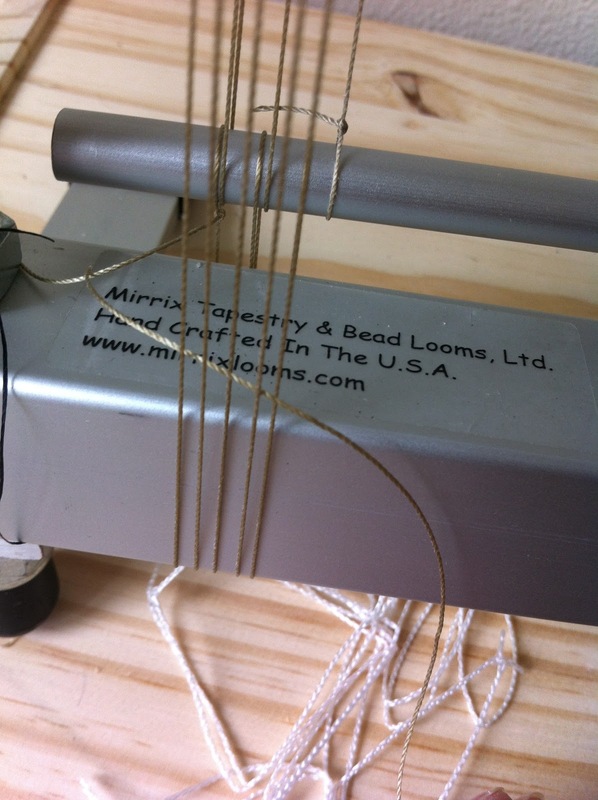 Bead weaving on the Mirrix! Yep. 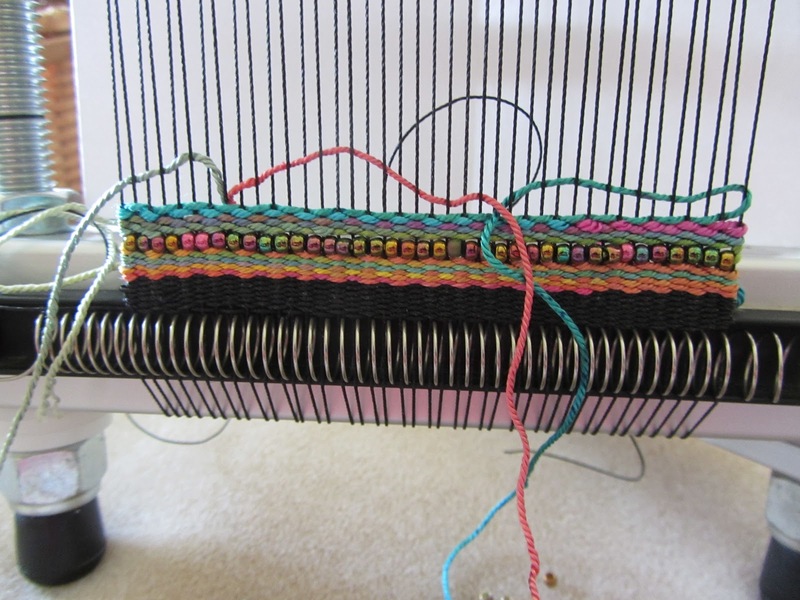 All my bead weaving has been off loom and I am TERRIBLE at bead weaving on the loom. 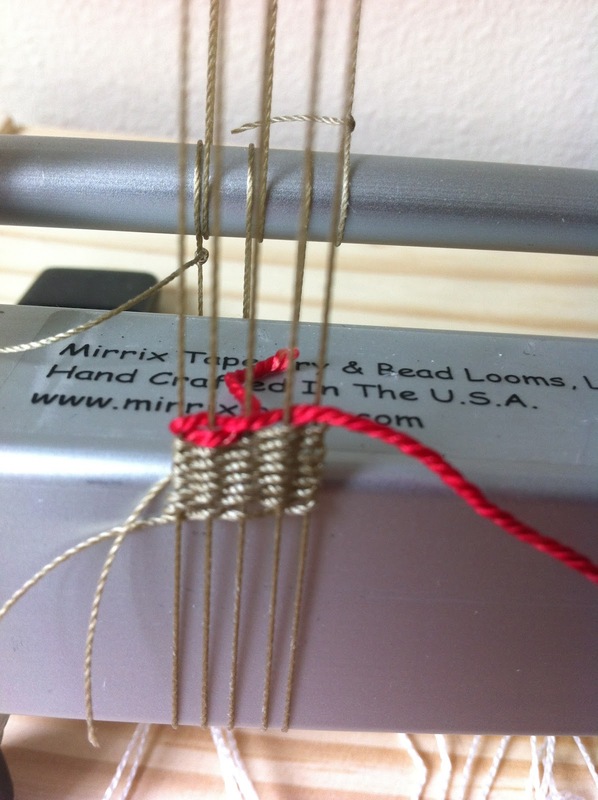 In my previous blog post, LINK, I showed how I set up my Lani Mirrix loom, using the ‘No Warp Ends’ warping technique. 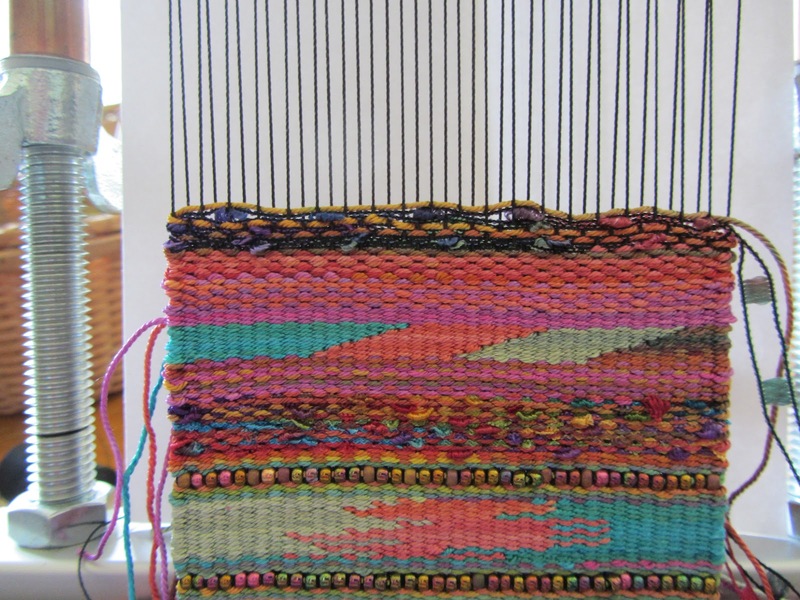 It allows you to sample different weaving techniques quickly and efficiently. 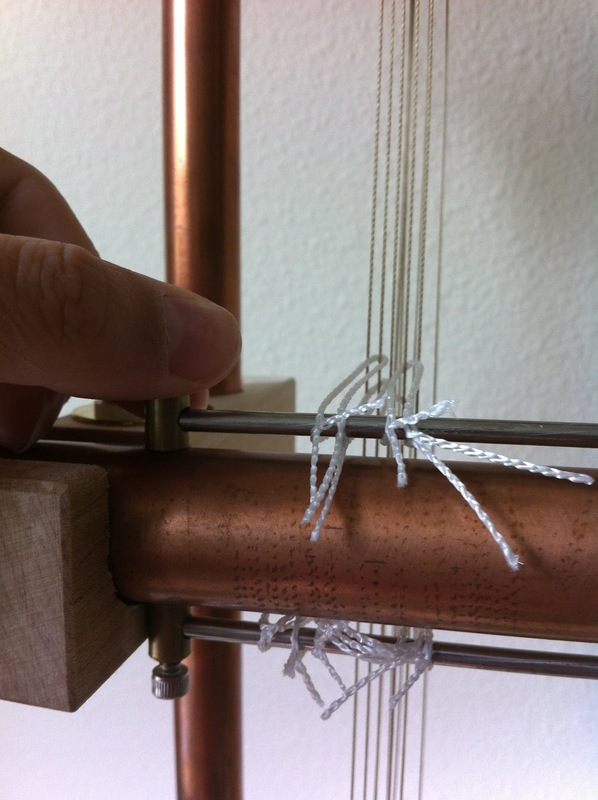 You won’t waste time OR yarn when using the ‘No Warp Ends’ technique. 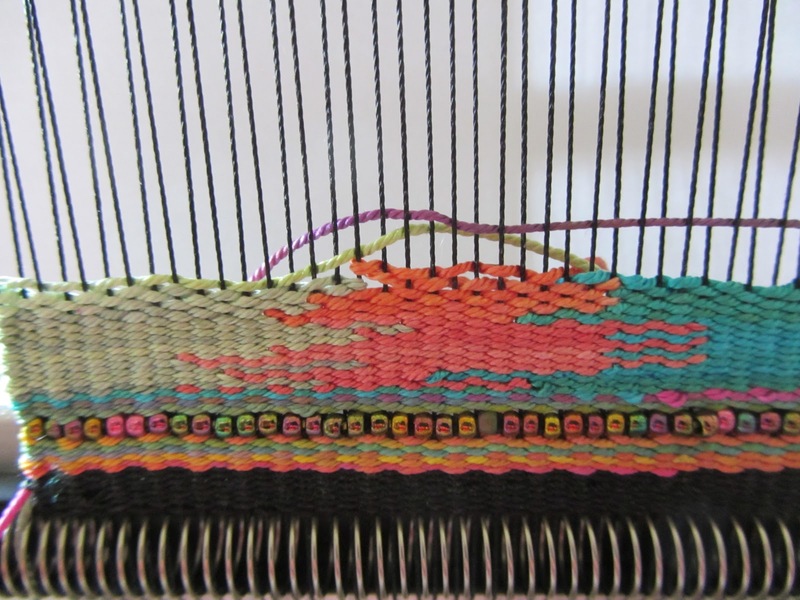 Because the ‘No Warp Ends’ warping technique precludes using a shedding device, it is perfect for weaving techniques that are hand manipulated, like: LENO lace! Yay! I think that Leno lace is the bee’s knees. 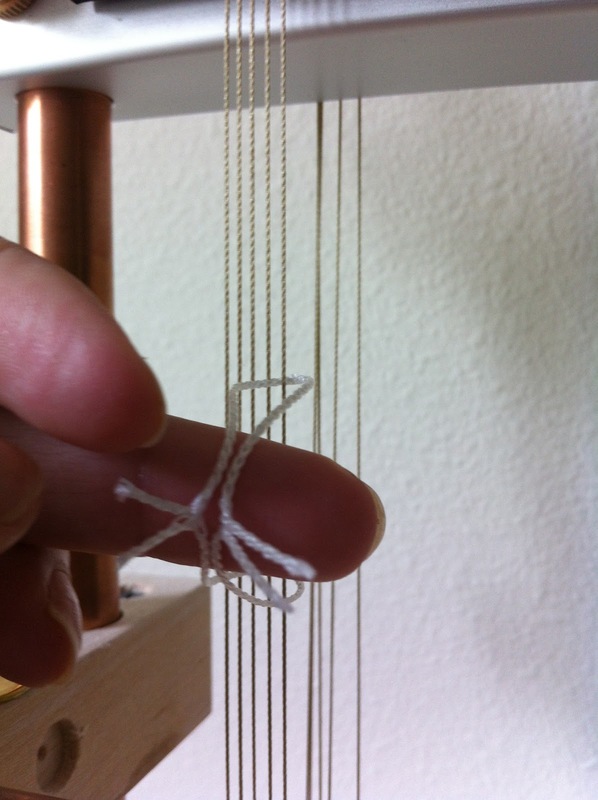 It’s kind of a miniature version of the ancient technique of twisting fibers, called, Sprang. You do this nifty twist thing, and tadah! You get a bonus free row that is cheerfully waiting for you, gratis! Whee! Leno can seem a little challenging at first, so I figured that a video tutorial is a good idea. 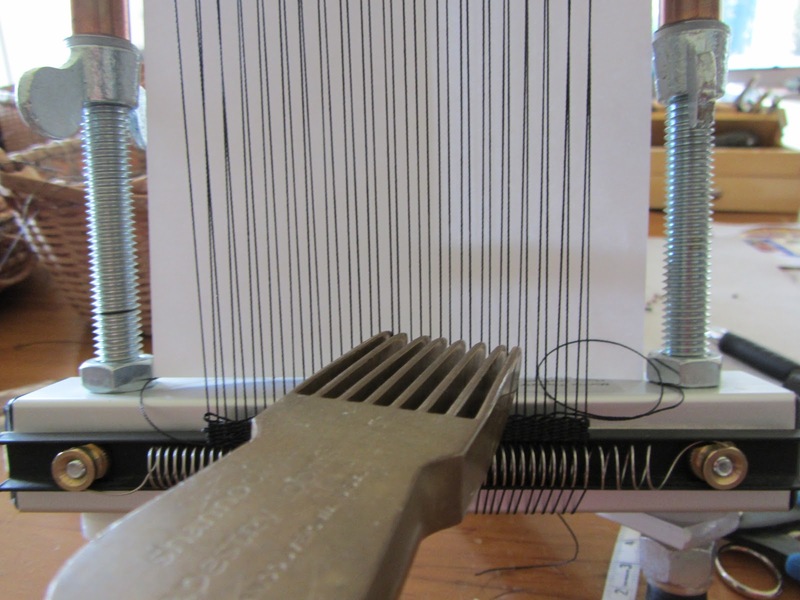 That’s why I love Claudia Chase’s ‘No Warp Ends’ technique for the Mirrix looms. The one thing that I wasn’t keen on was using paper clips to be the holders for the yarn ends, so I thought about it and mulled it over. Hmmmm…. 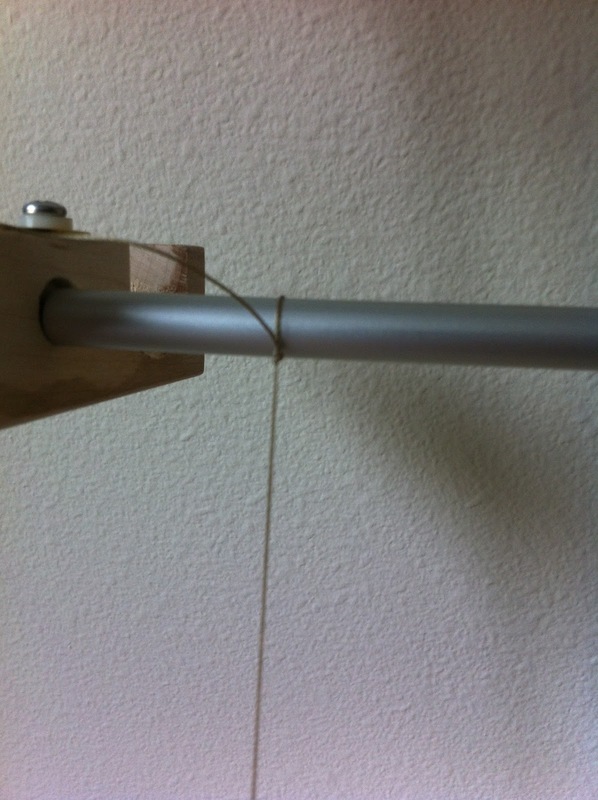 I use ‘S’ hooks all the time to hang things and connect them, but I have never used them on a loom. This called for some experimenting. I don’t know about you…. but, I have a tendency to start with a really complicated plan, and have to do a lot of trial and errors to get to the elegant and simple final version. 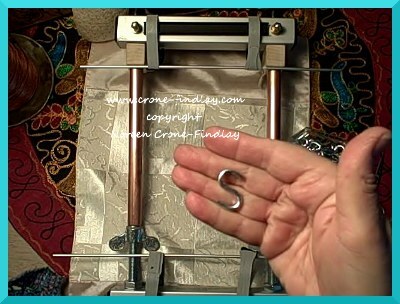 I was thinking about all kinds of ways of making harnesses to hold the bars for the ‘s’ hooks…. oh my! 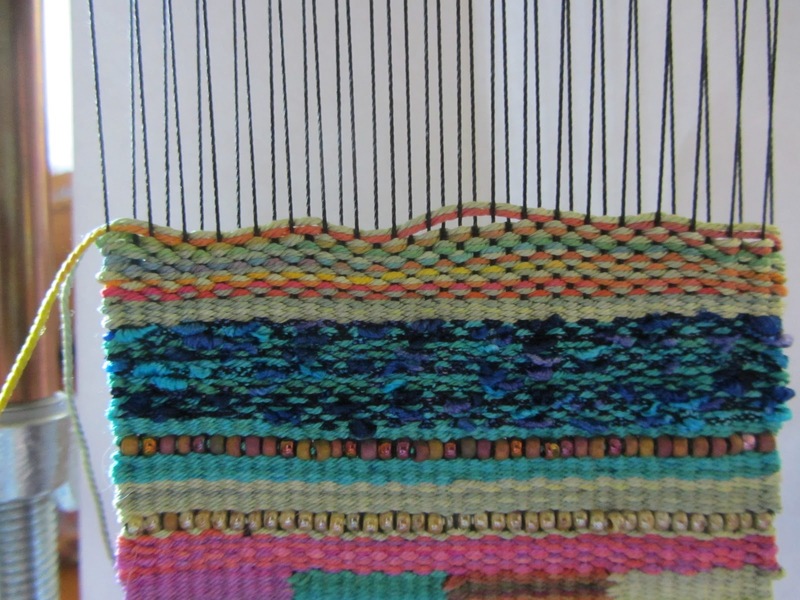 I also figured that I wanted to use both sides of the loom while setting up for this technique. 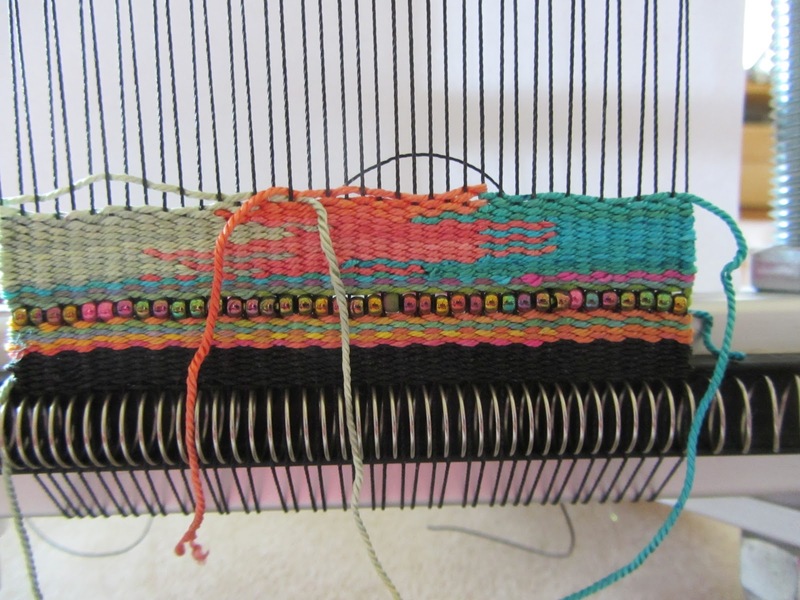 I had woven two affinity bracelets at the same time- one on the front of the loom, and one on the back, so this seemed to stick in my mind as ‘the way to go’. 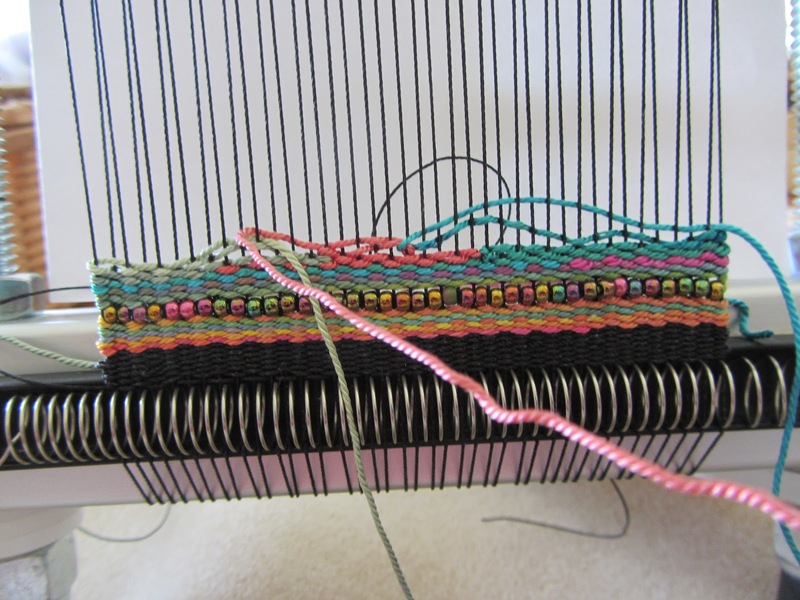 Well… I twiddled and fiddled, and threw away the whole overly elaborate harness idea, and ended up using 4 loops of double sided velcro to hold the bars to the upper and lower edges of the loom. And, I am really pleased with the final method that I came up with- it really works for me! 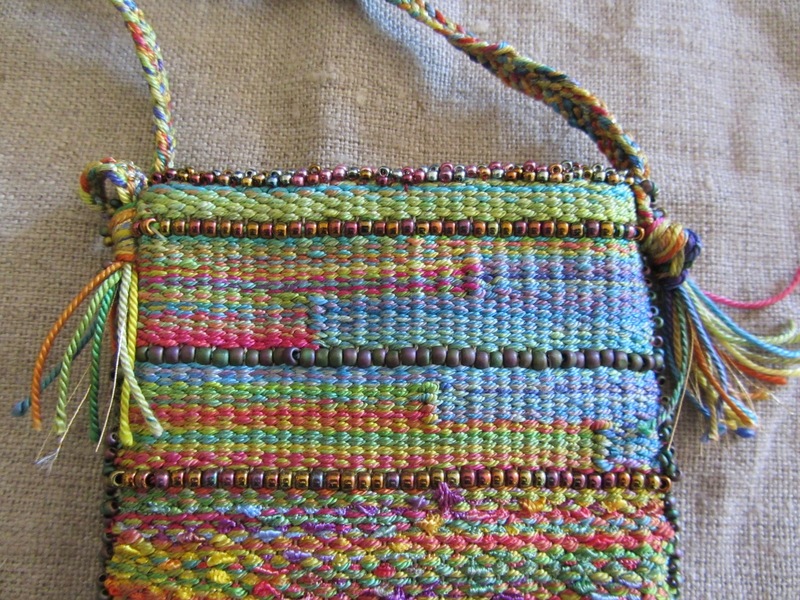 A while back I started the silk purse for the latest weave-along. I was so proud of myself for starting it a while few weeks before I needed to. I took a bunch of photos but took no notes. When I finally got around the compiling all the photos into something that resembles instructions, it was clear I had both screwed a bunch of things up and missed a bunch of essential photographs. 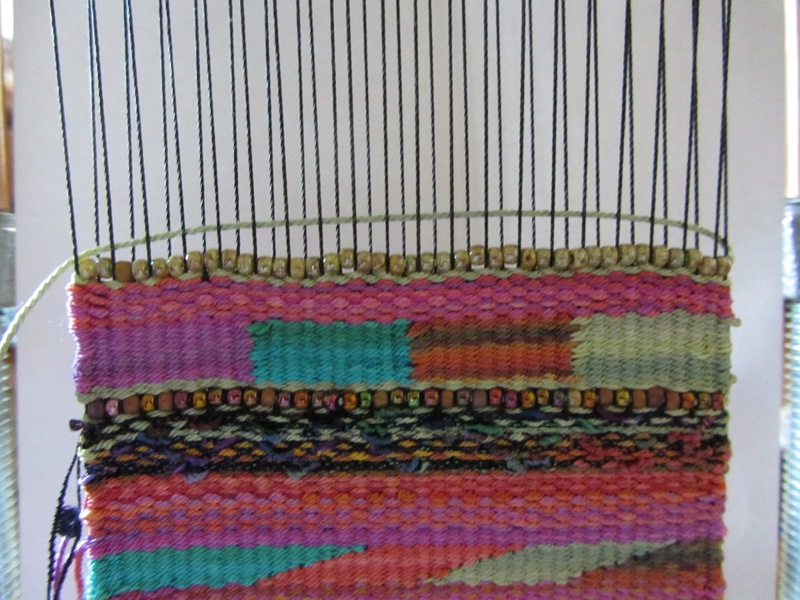 Elena said: do it again!But I decided at very least to finish the piece on the loom in adequate as it was. Who wants to cut off and toss ten inches or so of weaving. So I grit my teeth and wove away. And this is what I just finished. The strap is a flat braid. 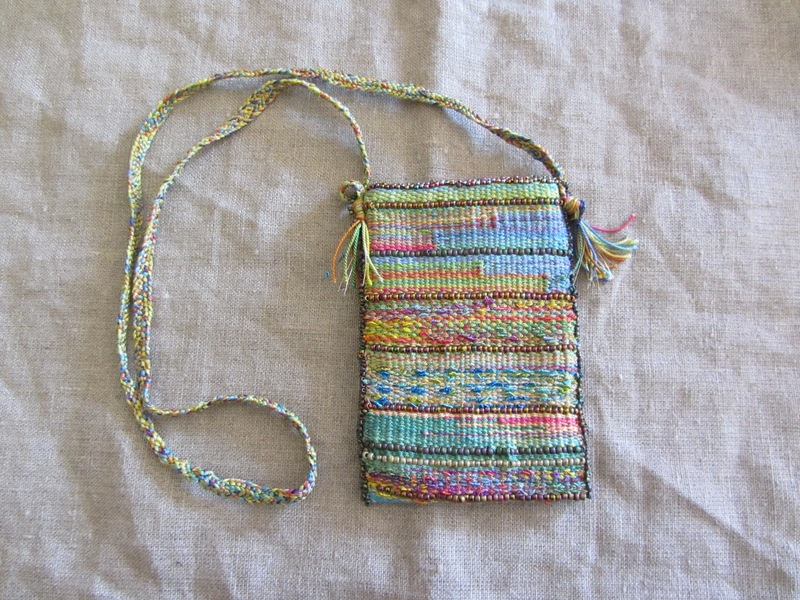 I’ve used mostly hand painted silk with a little bit of railroad yarn. I lined it with silk. It will work. It’s just not what I envisioned at all for the weave along. I will spend the rest of today an tomorrow working on the new one. 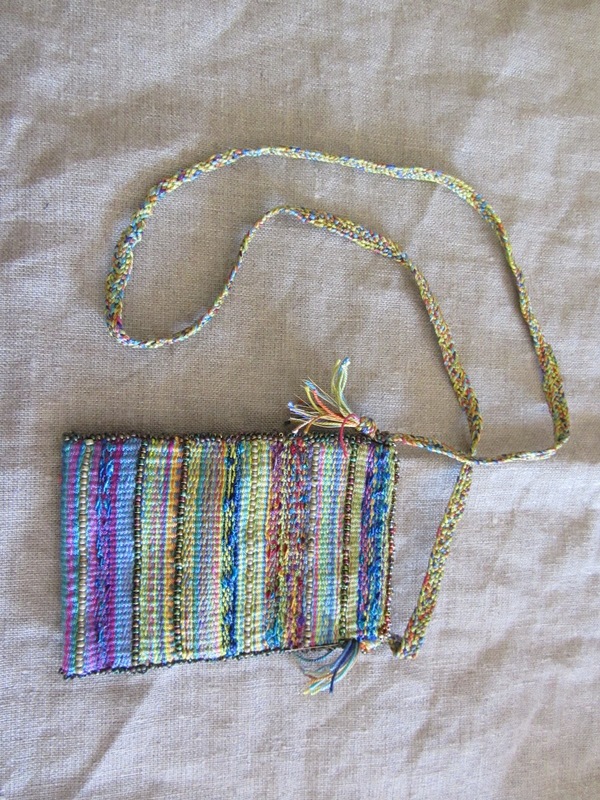 And below, of course, is where this purse comes from! I my last blog post, I talked about two projects that I rally want to loom, and how I couldn’t choose which to do first. 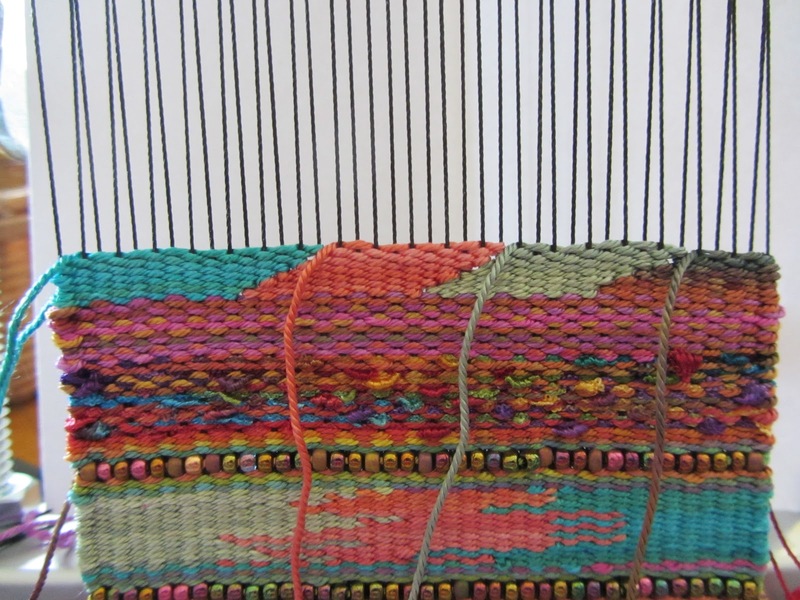 Someone then suggested I could get them both on the loom. There are two options for this. 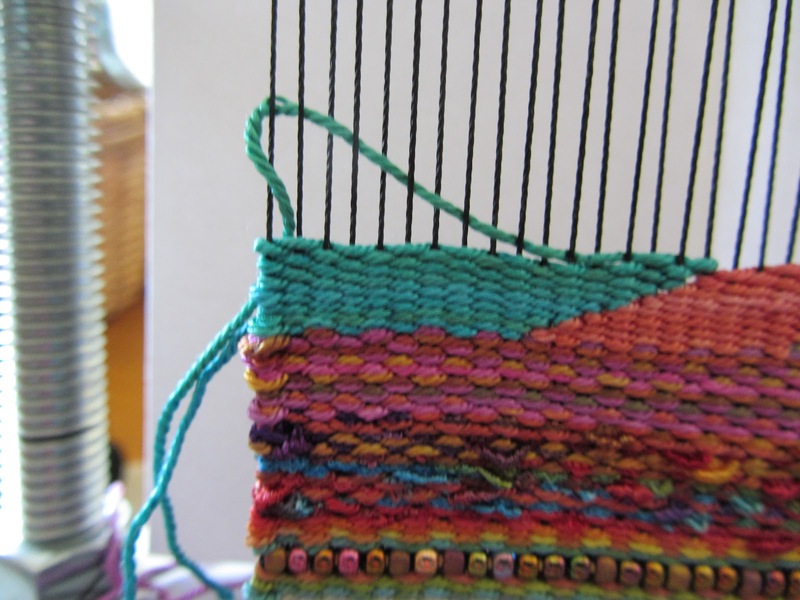 Firstly, I could loom one, then advance the completed weaving and then loom the other. 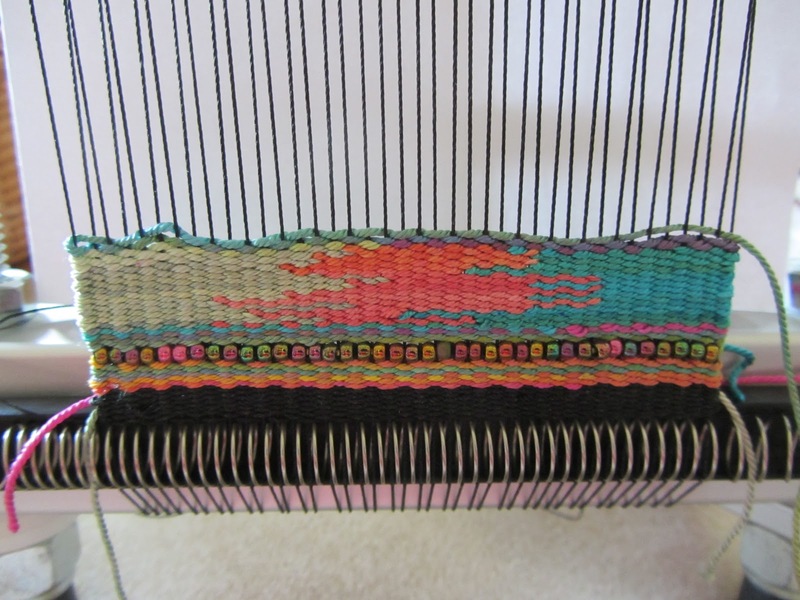 secondly, I could warp as usual and push the warping bar all the way down. 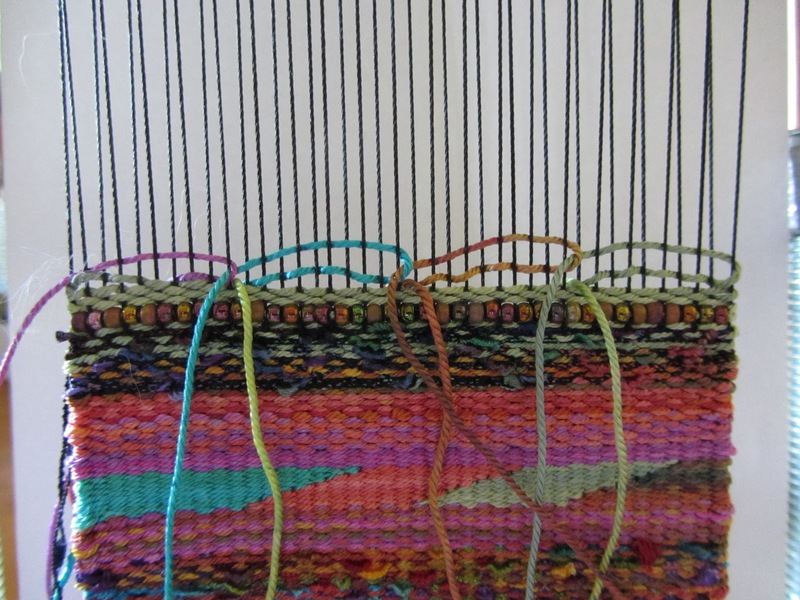 Then I would be free to use both sides of the loom simultaneously. The latter sounded more like what would be the suitable method. 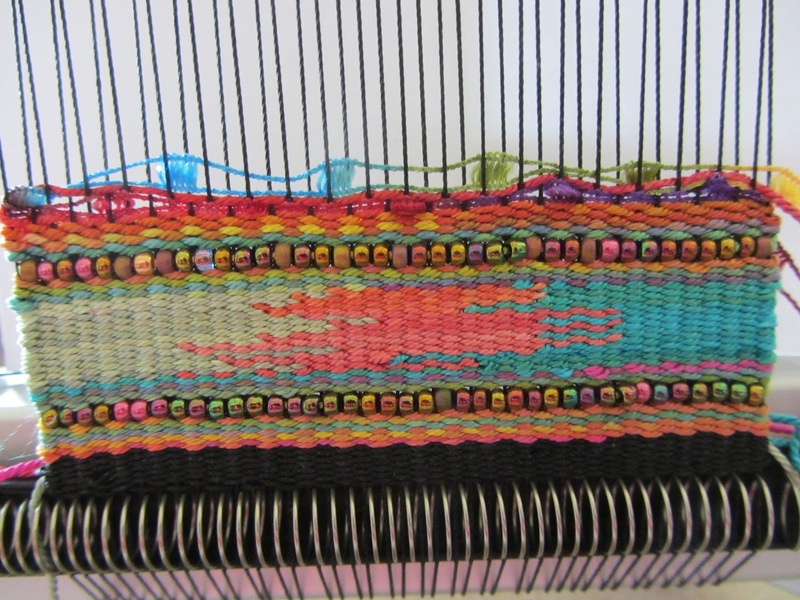 Now, the two projects are 152 and 162 beads wide. I don’t want to jump in at the deep end, as it’s crucial for me to get them absolutely right. 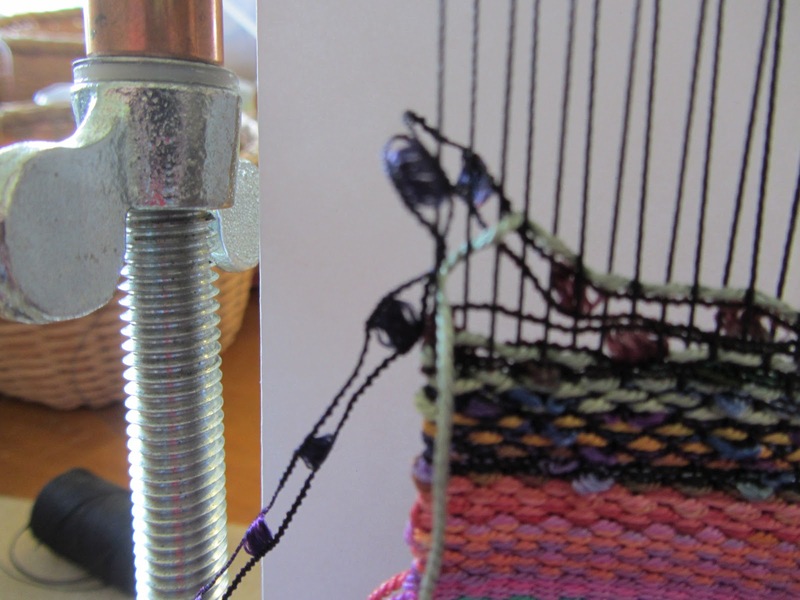 With that in mind, I decided to try out this way of using the loom before proceeding with the portrait and purse. I warped as usual, then pushed the warping bar as far down as I could. 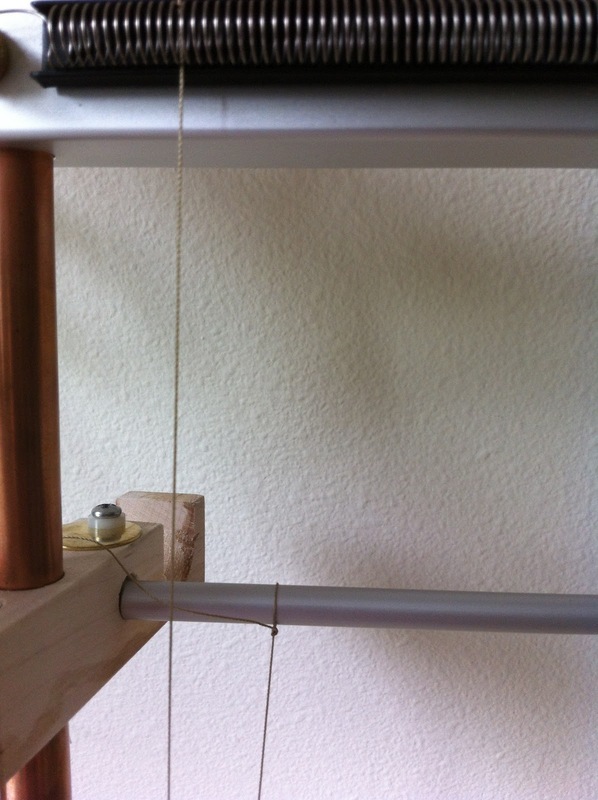 It doesn’t quite fit underneath the loom so it juts out slightly at an angle. 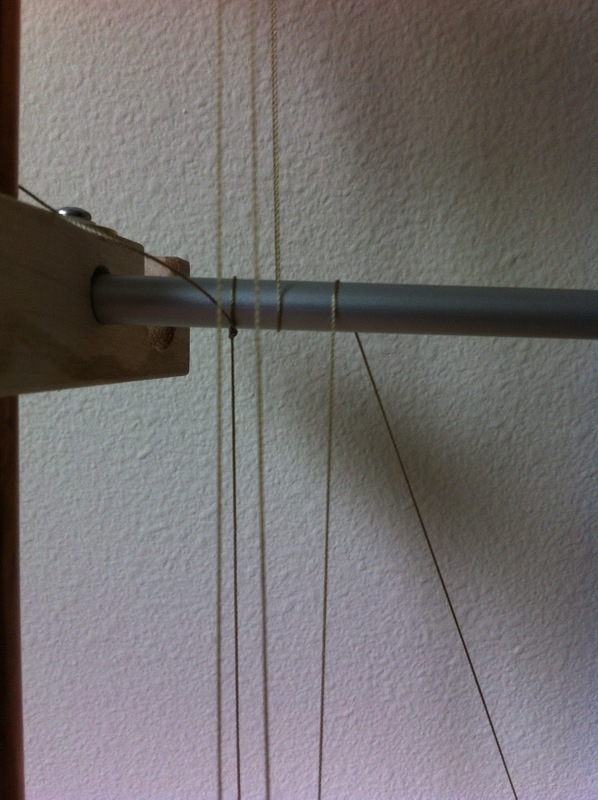 I encountered no problems in warping and moving the warping bar. 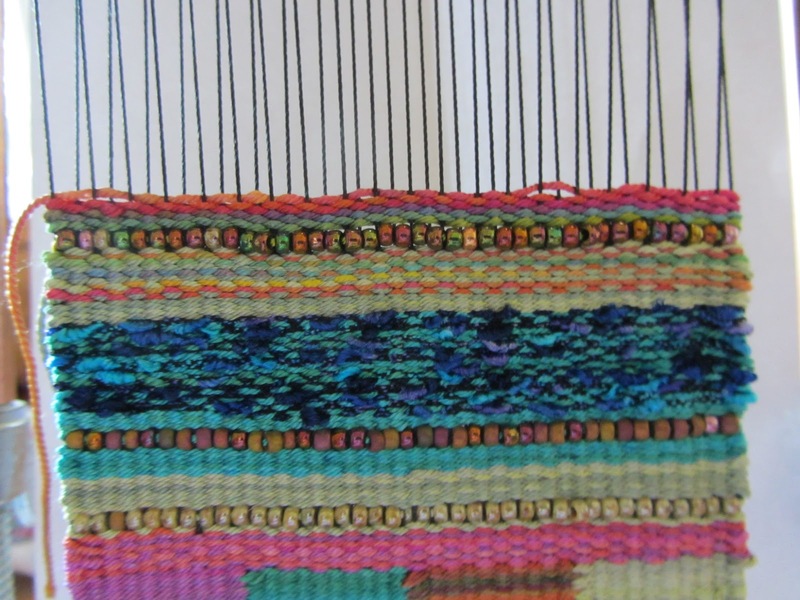 I then loomed two rows at top and bottom of the warps for the (two) projects that would go on the back. 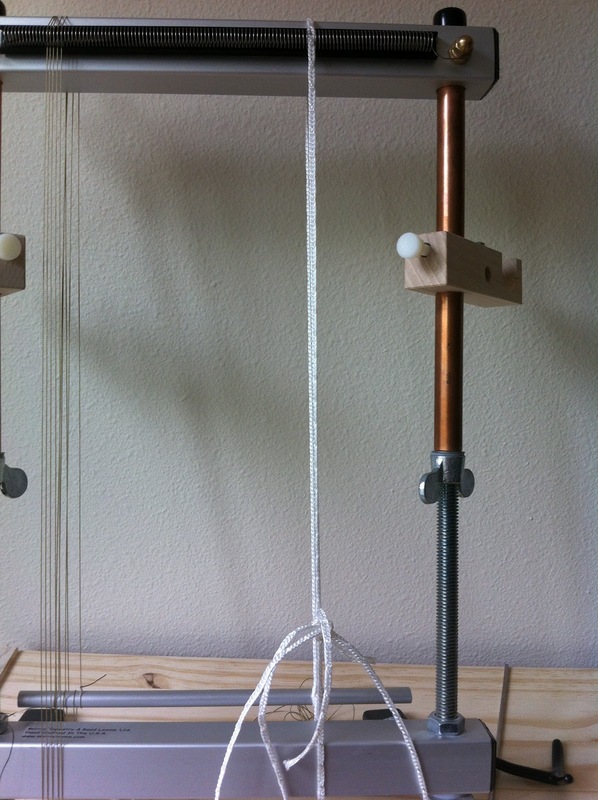 There was no need to do this for the front project, as the coil was enough to space the warps. 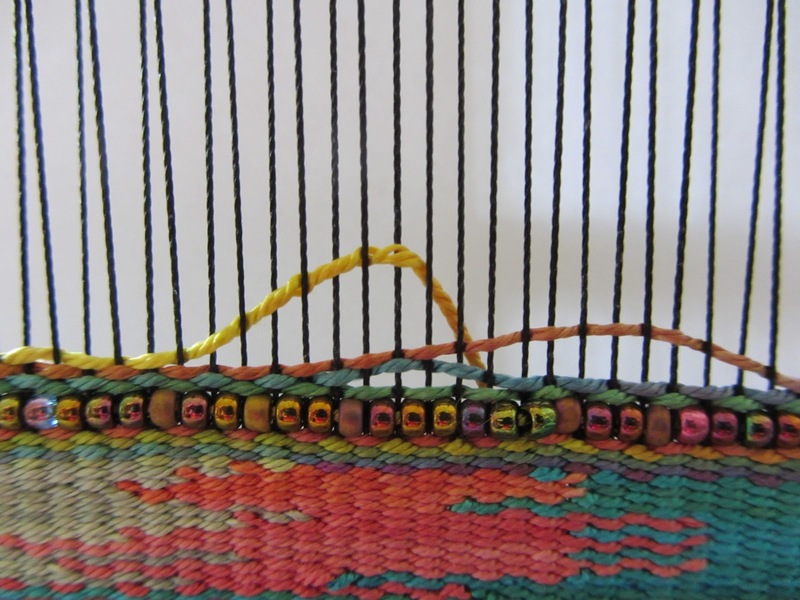 I did add a line of beads on the front of the bottom bar, but found I couldn’t quite place the warps in it once I had moved the warping bar downwards. 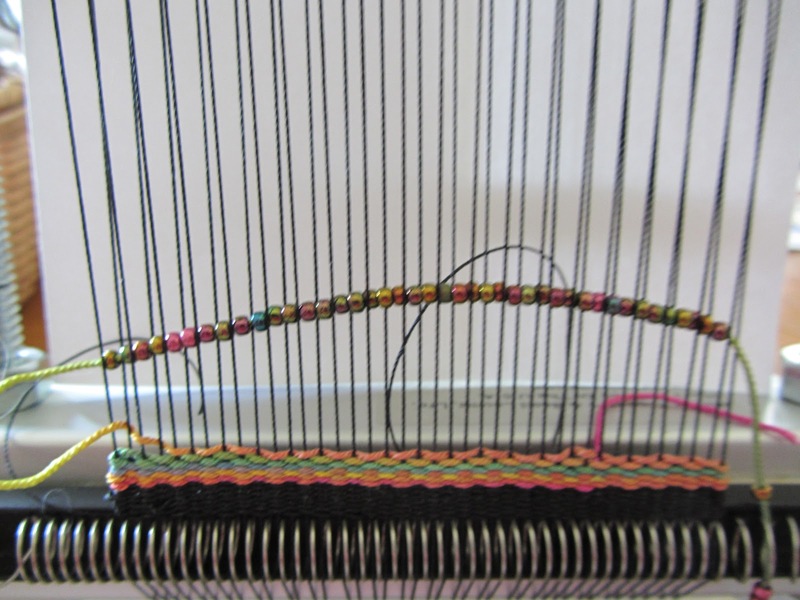 However, this can be very effective in spacing the warps towards the bottom of the loom, if you don’t have the bottom spring kit. Thank you to the person who suggested it to me (you know who you are). As you can see I am able to work on three projects at the same time. 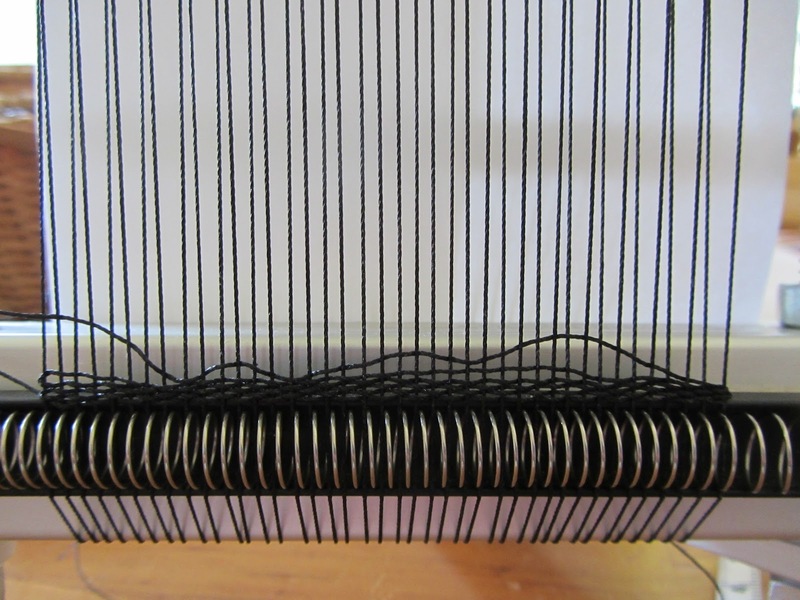 Without the extra warping bar kit, a substantial amount of warping thread is used for warping. 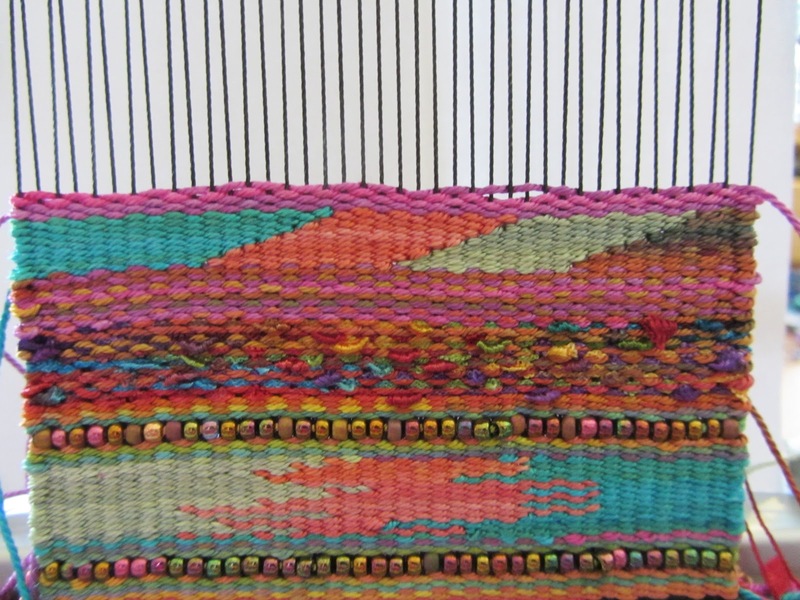 This is one way to reduce this warp wastage, as long as the warp colour chosen matches what you plan to loom. So, a little forward planning helps. 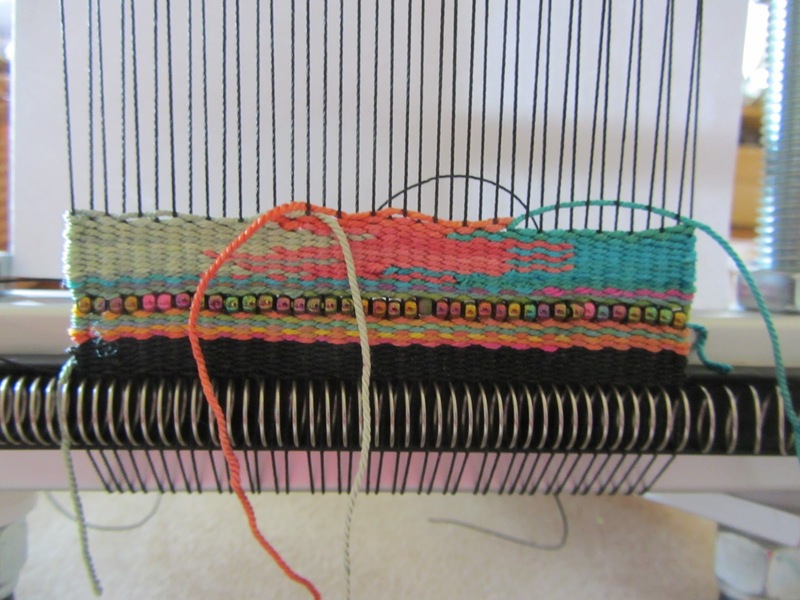 As I often like to (or inevitably) work on several projects, this makes things easier for me – I don’t have to keep swapping looms to work on each, and my thread doesn’t go to waste. So, I think this could be something I use again in the future if I have multiple projects that can fit on the Mirrix at the same time. 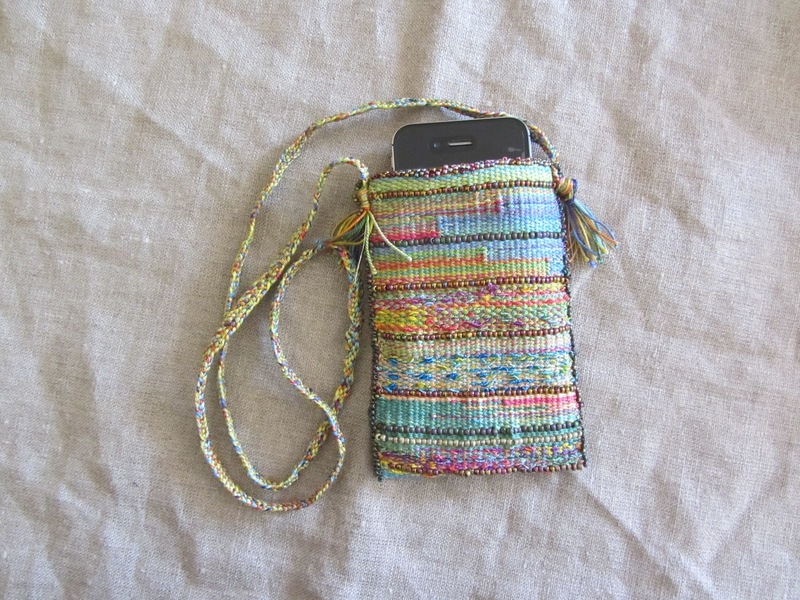 For now, I have the two bracelets at the back, and the front of a photo purse to complete. 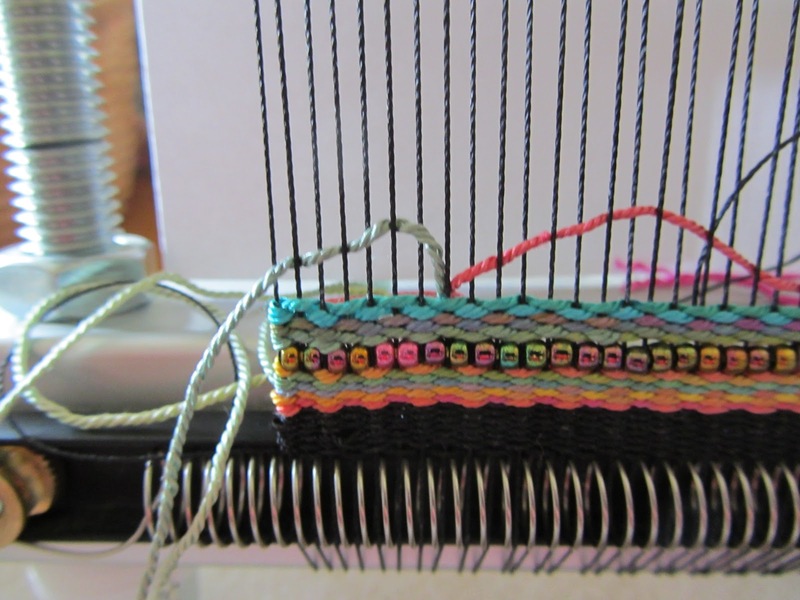 Some warp cutting is necessary for the bracelet on the left, but I may leave that till the front project is all loomed. I’ll make up my mind as I go along. I’m off to nurse my cold and get some sleep. Hopefully I can do some more tomorrow evening. 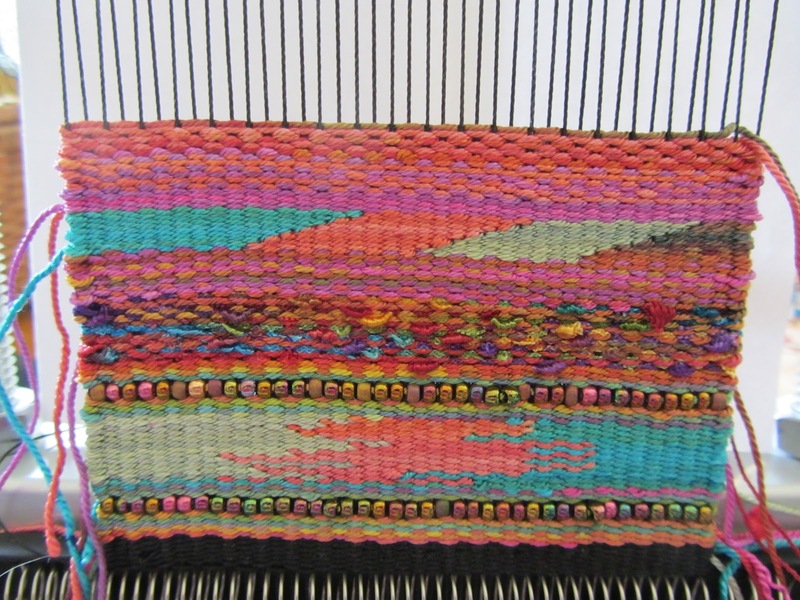 The purse (front) takes some time to set everything up – more than 26 colours need to be laid out on bead mats, in a particular order. It’s a little boring but needs must! Sweet beady dreams! 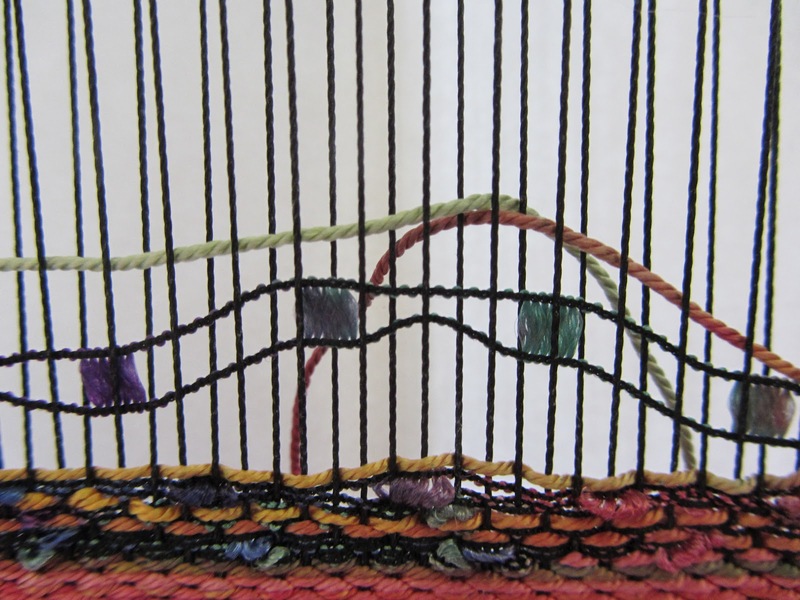 This tutorial shows you how to do three basic tapestry techniques: Pick and Pick, Wavy Lines, Hatching. 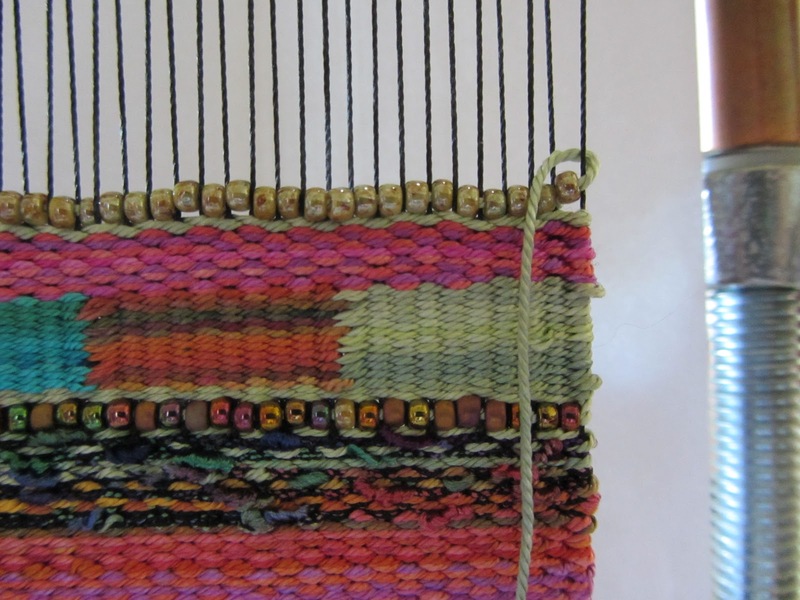 Once you learn to combine beads and fiber, your weaving possibilities are endless. 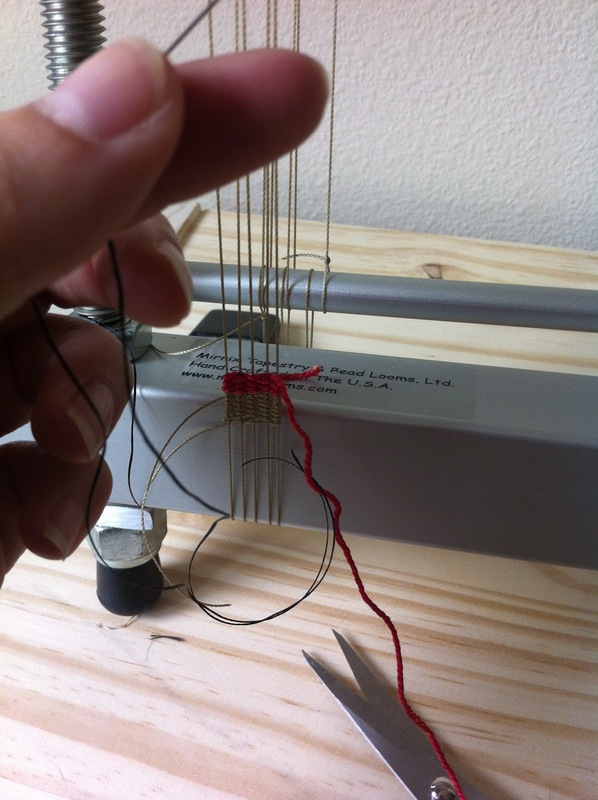 With a shedding device and the right warp spacing, this is easy to do! 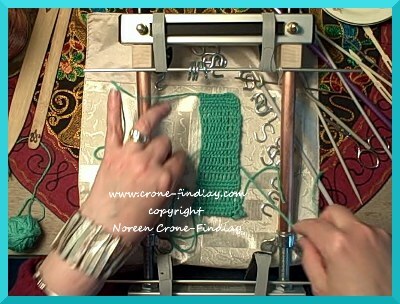 For this tutorial, I will be weaving with C-Lon cord as warp, 8/0 beads and a ten dent spring. 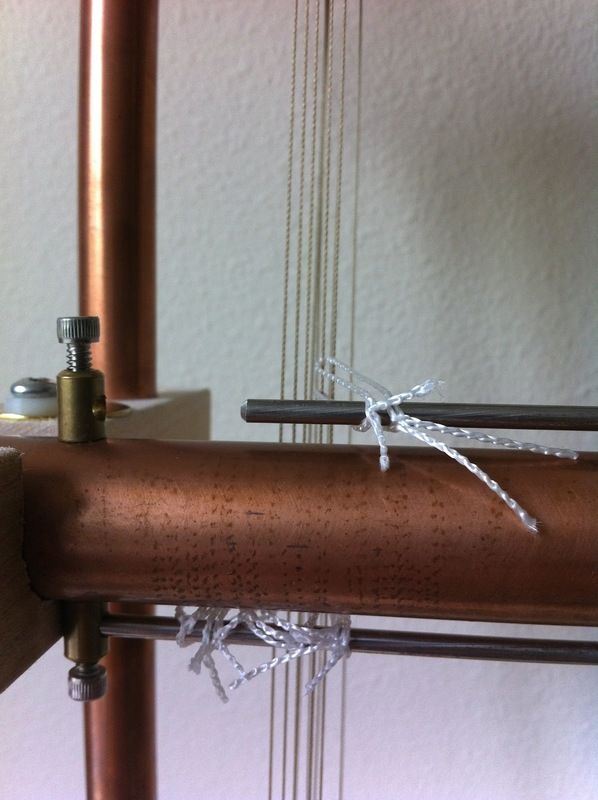 First, warp your loom for tapestry with the shedding device (not bead weaving). 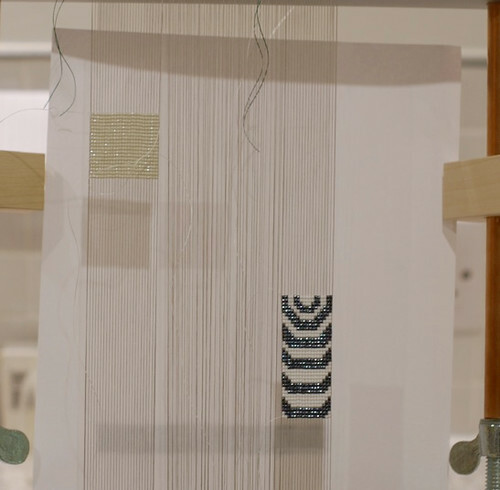 This means you will put on warp thread in each dent (space) in your spring. 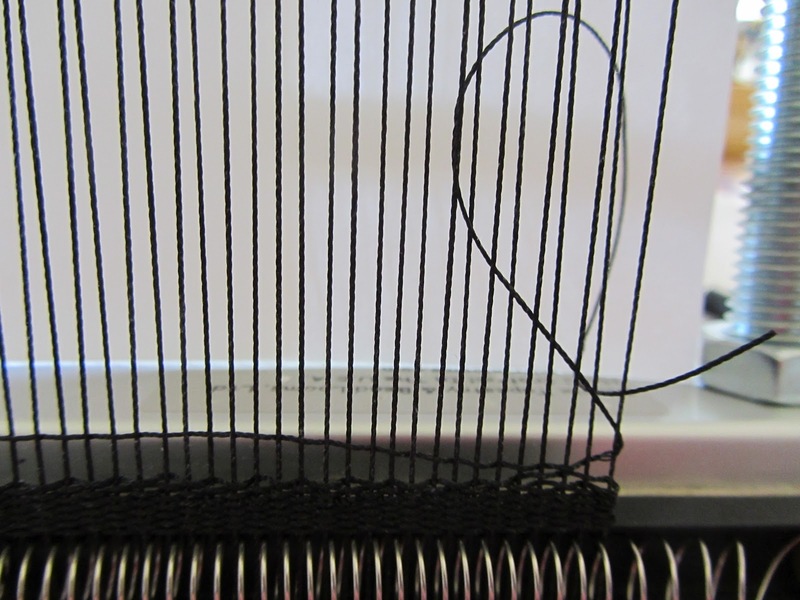 You can get more detailed warping instructions here, but we’ve gone over the basics below. What do you need? 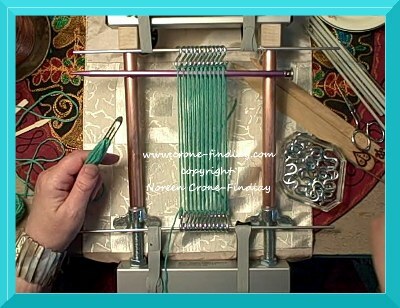 A Mirrix Loom with shedding device and the warping bar, clips and spring bar that came with the loom, a ten-dent spring (this does not come with any loom), heddles, C-Lon cord, beading thread, a needle, a pair of scissors, size 8/0 beads, silk or perle cotton. 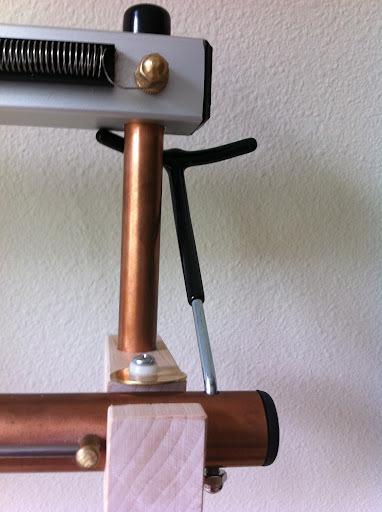 Place your warping bar between your clips. 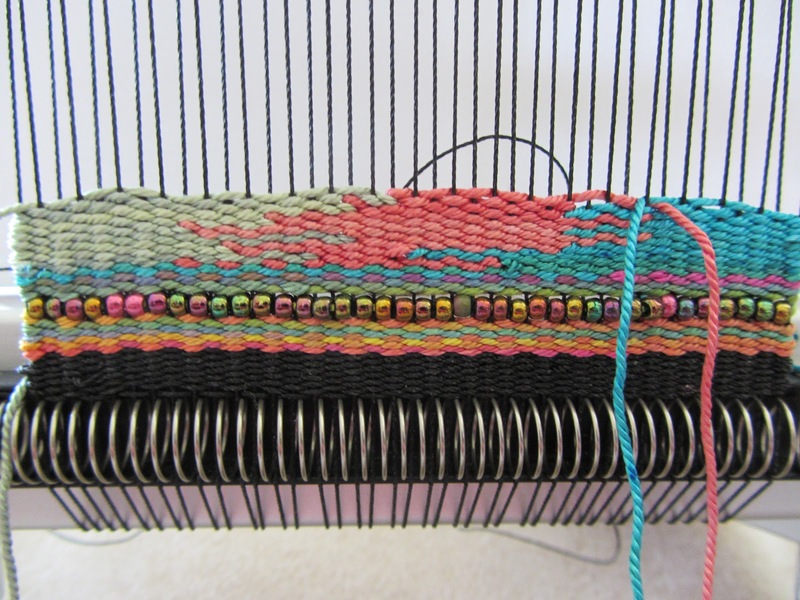 Begin warping by bringing your warp thread behind and under the loom to the front. Bring the warp up the front of the loom and into one dent (space) in the spring. 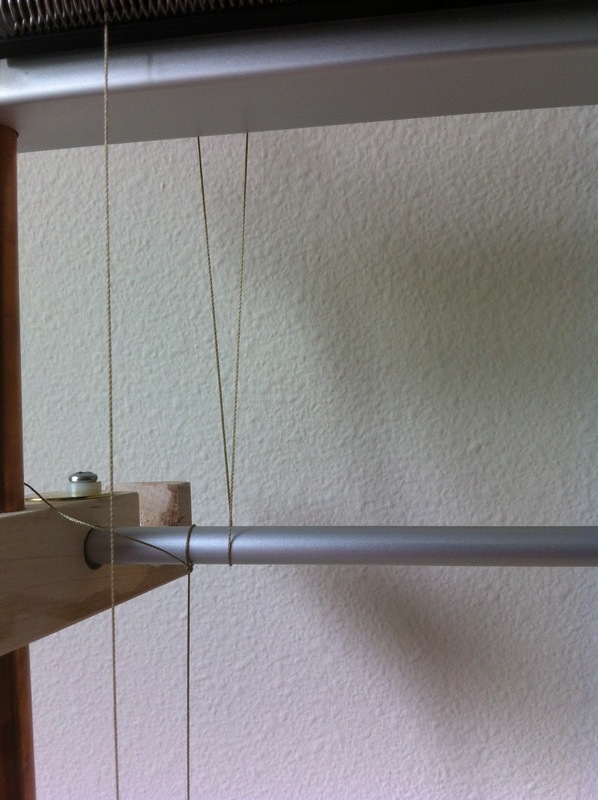 Bring your warp thread over the top of the loom and down the back until you hit the warping bar. When you hit the warping bar, go around the bar and back in the direction you came. 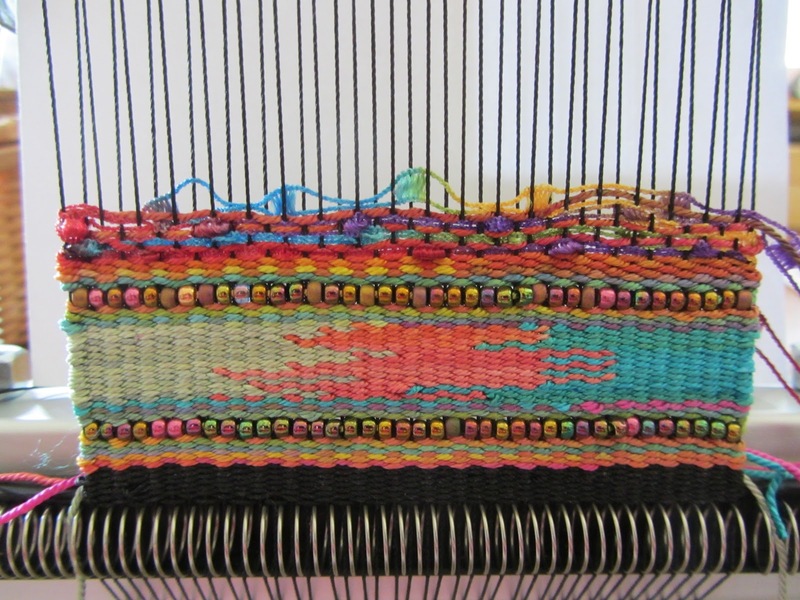 Come back over the top of the loom from the back to the front. 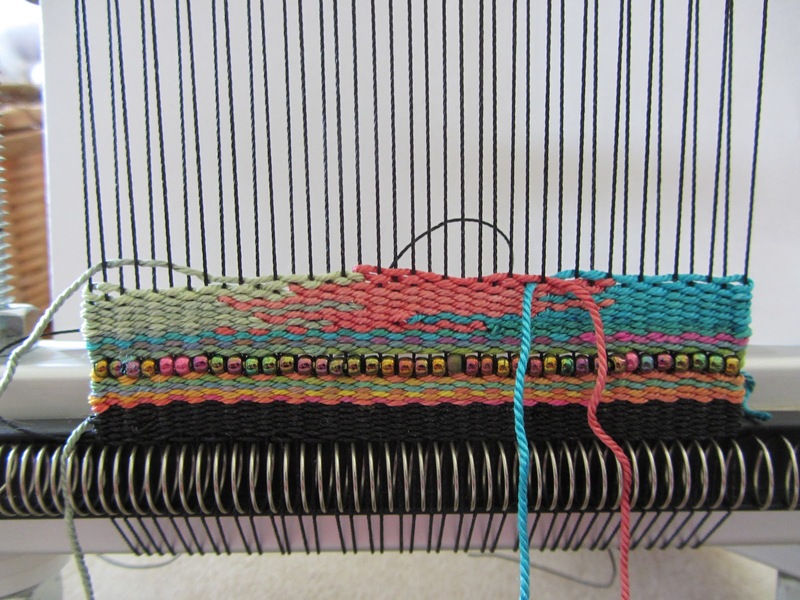 Remember to never cross inside the loom, you will always be going around the outside of the loom. 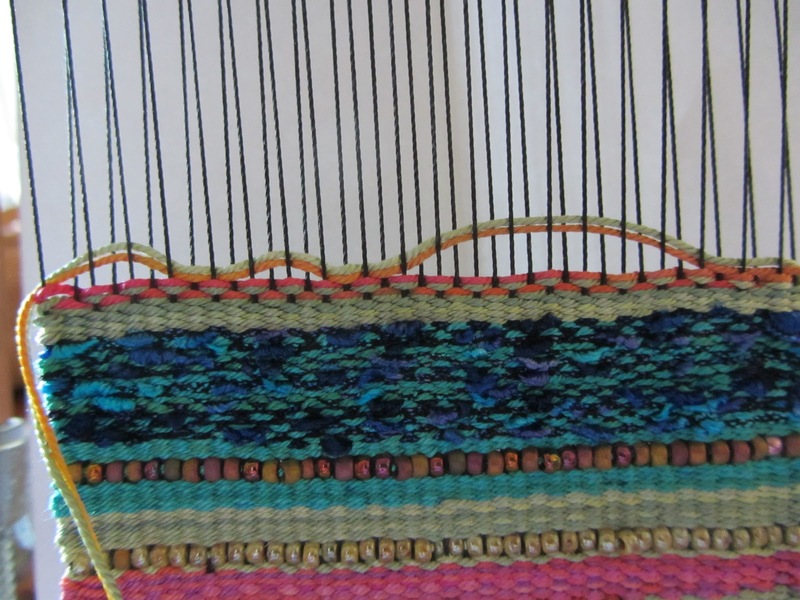 Place your warp thread in the next dent over. 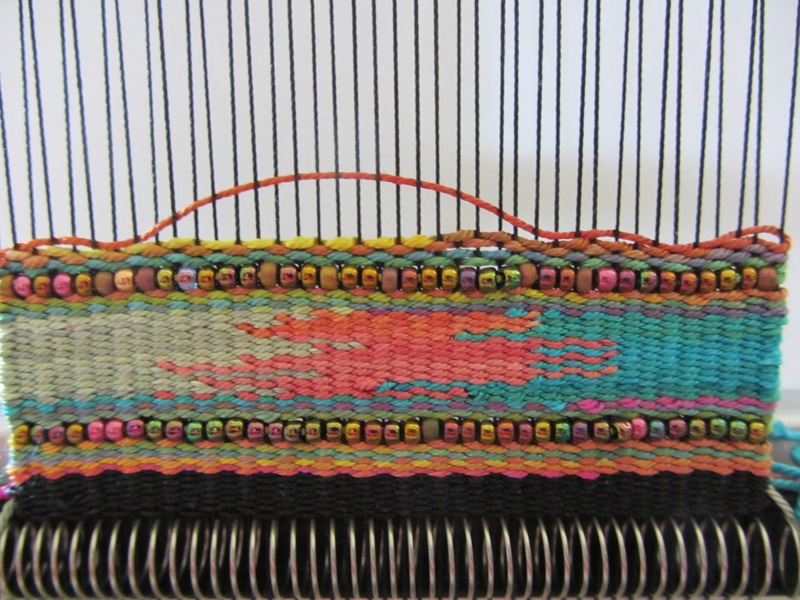 Continue down the front of the loom. 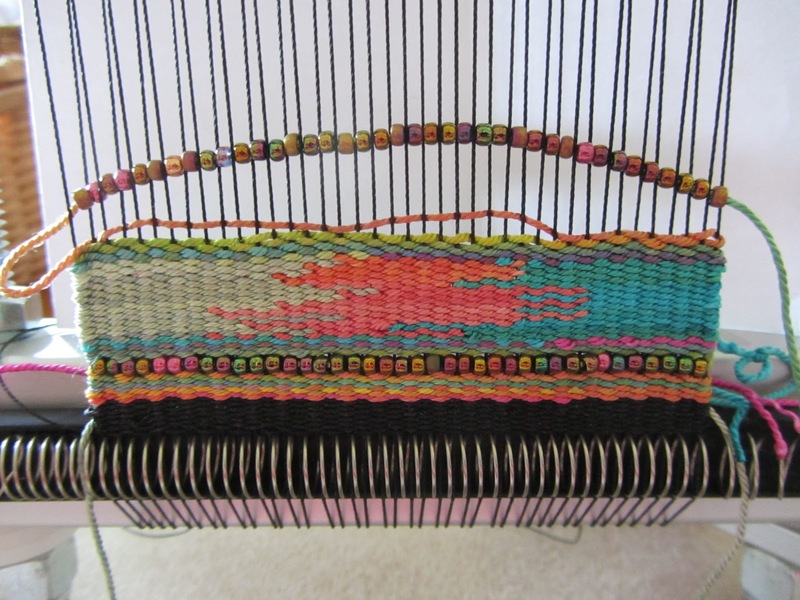 Go back down the front of the loom, around the bottom bar to the back and up the back until you hit the warping bar. Go around the warping bar and start heading back in the direction you came. Continue doing this until you’ve warped as wide as you want your piece to be. I warped 5 warps wide. When you are finished, tie on to the warping bar. 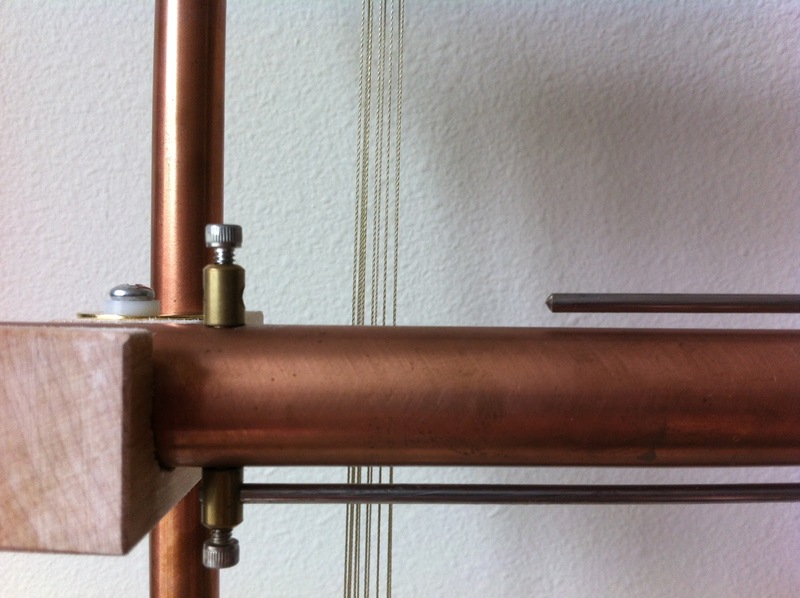 Make sure your warp threads have even tension. 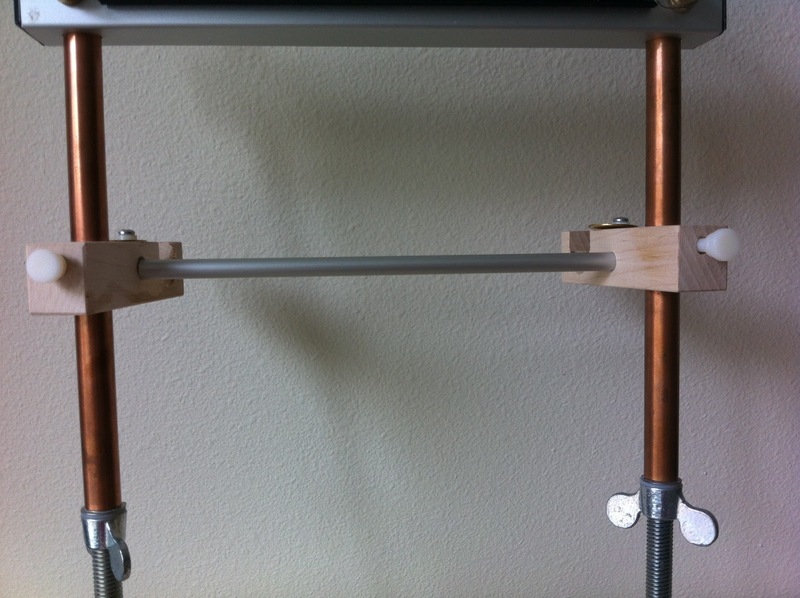 Move your springs out away from the warping bar and bring the bar down to near the bottom beam. 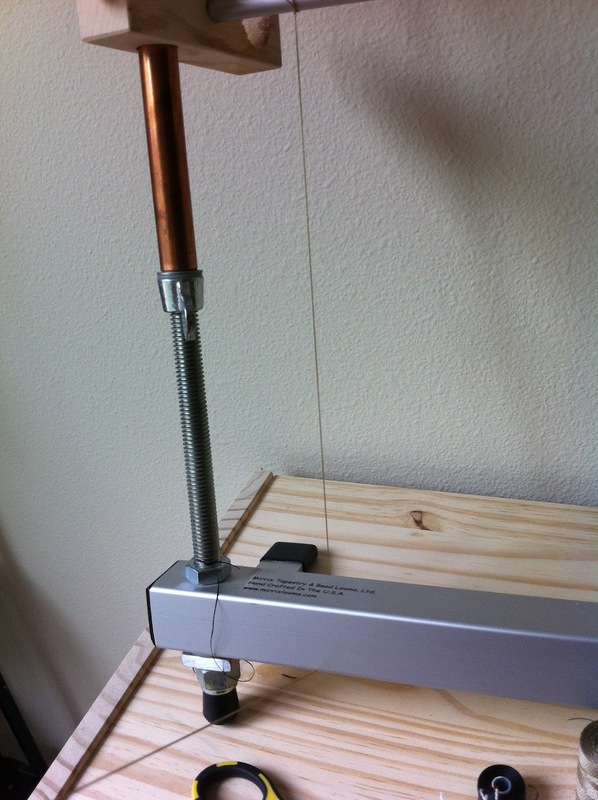 At this point, you may want to tighten your tension slightly. Make sure your warps and not sagging and everything is even. 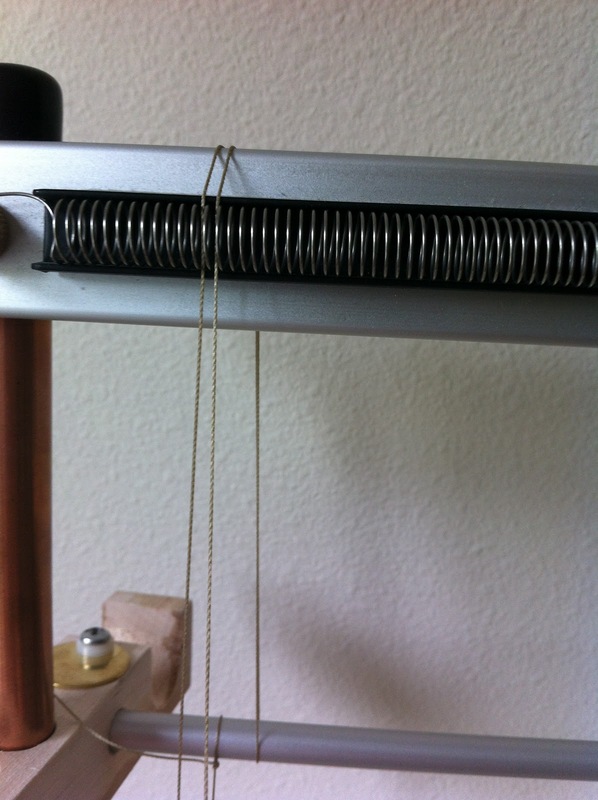 At this time, make sure to slide your spring bar (thin metal bar) into the spring at the top of your loom. 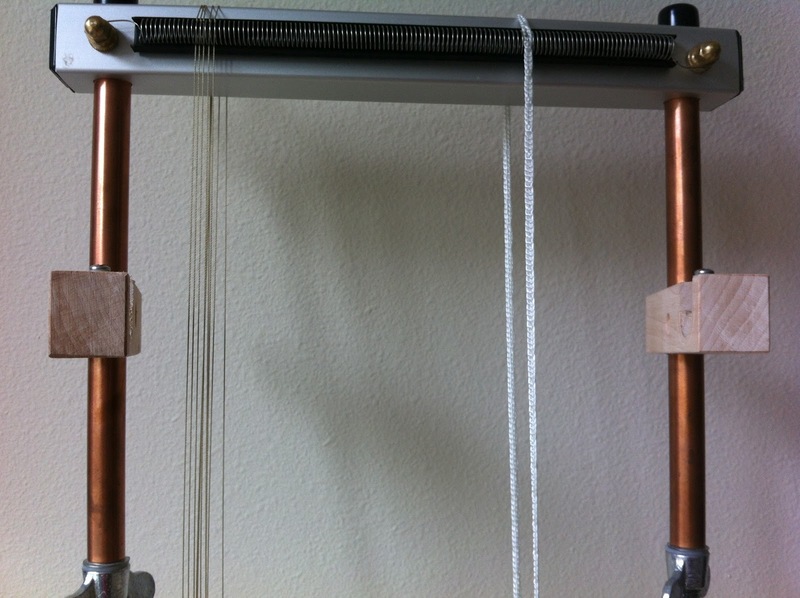 This will prevent your warp threads from coming out. 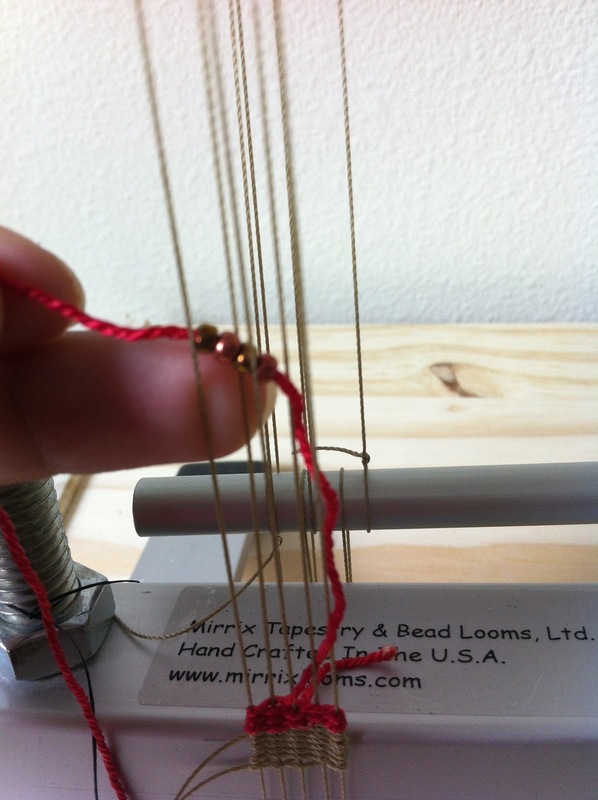 Rotate your clips to the front of the loom. Place your shedding device in your clips. Make sure the hole in the shedding device is on the right side if you are right handed and the left side if you are left handed. 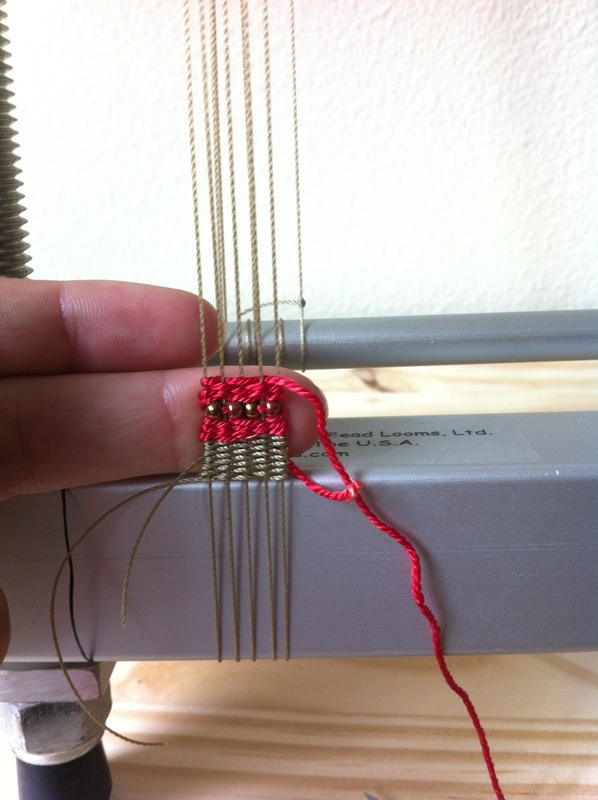 Unscrew the screw on the top of your shedding device and move the silver bar to the side of your warp. 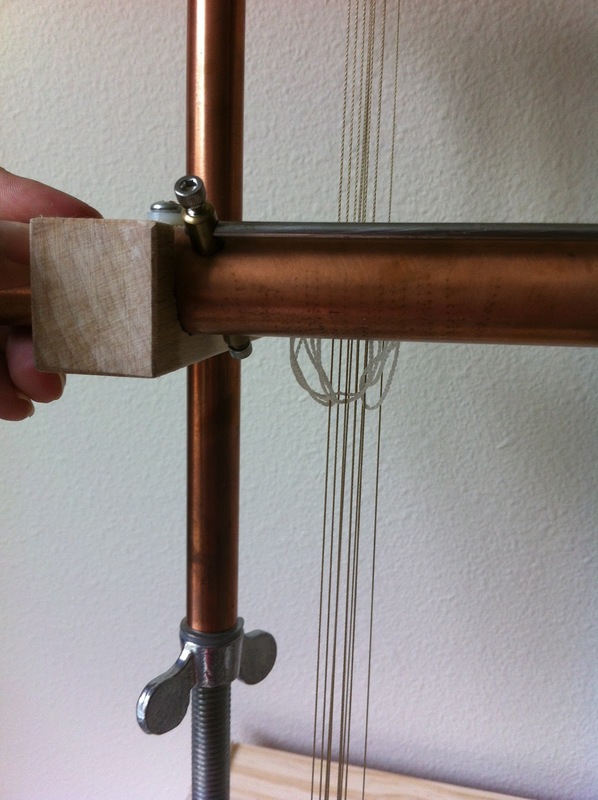 Take a heddle and place it around your first warp thread. 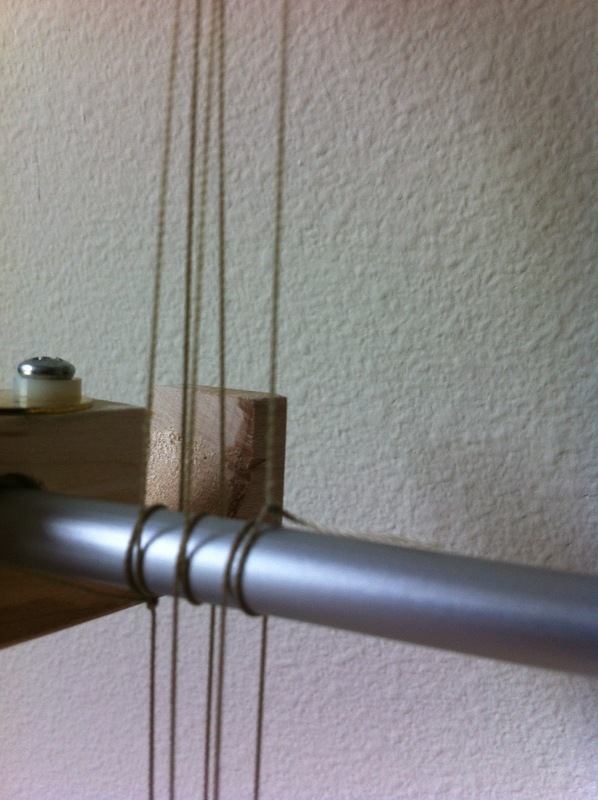 Then, slip the ends of the heddle onto the bar. 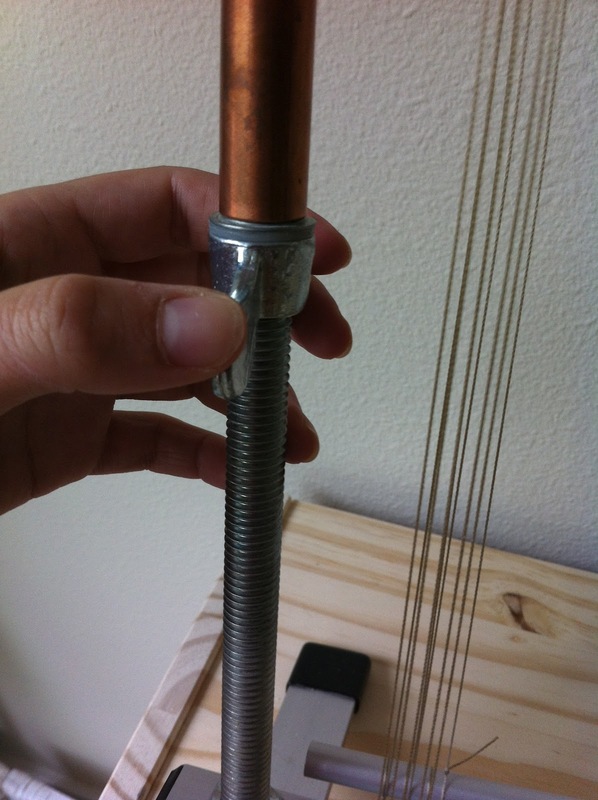 This attaches the warp thread to the shedding device. Continue doing this with every other warp thread. When you get to the other edge of your piece, retighten your bar. Next, flip your shedding device over, bringing the heddles you just put on to the bottom of the shedding device and the other silver bar to the top. 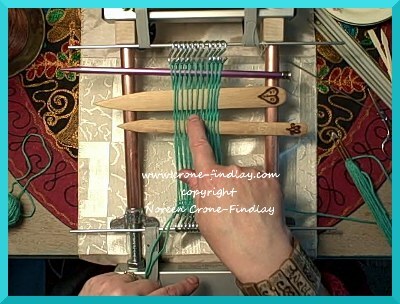 Put heddles on every other warp thread the same way you did with the first bar, but this time put them on every warp thread you didn’t put a heddle on last time. Place your shedding device handle in the hole on the side of your shedding device. 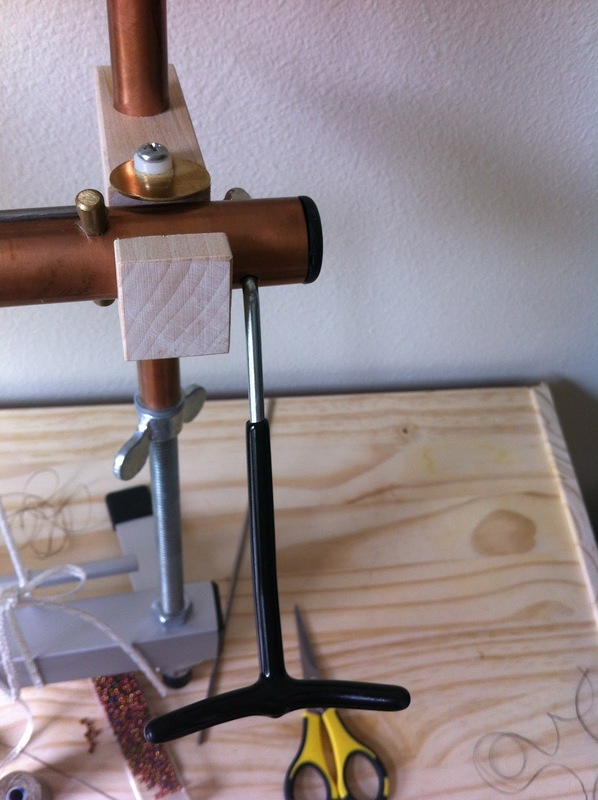 Also remember to swing the brass circle on the clip up over the shedding device to prevent it from falling out. You may need a Philips head screwdriver to do this. 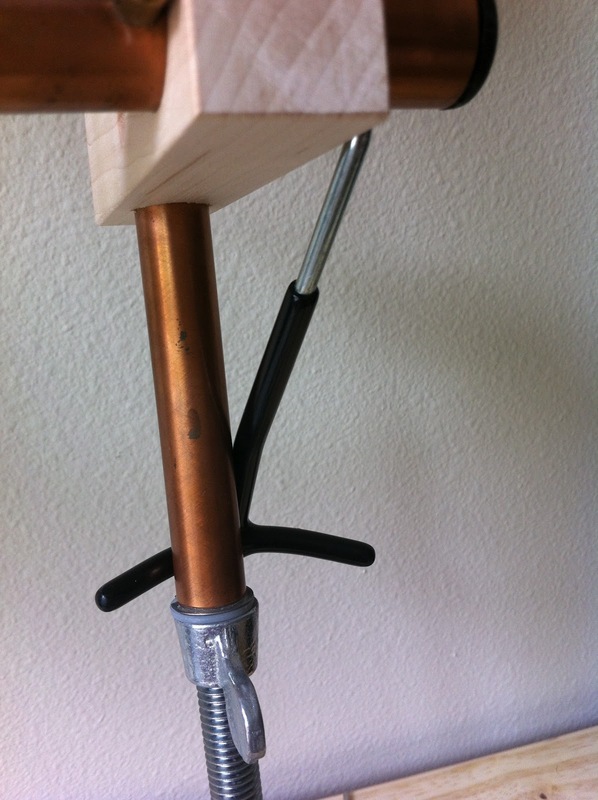 Tighten your tension with your wingnuts. You want it tight but not about-to-break tight. 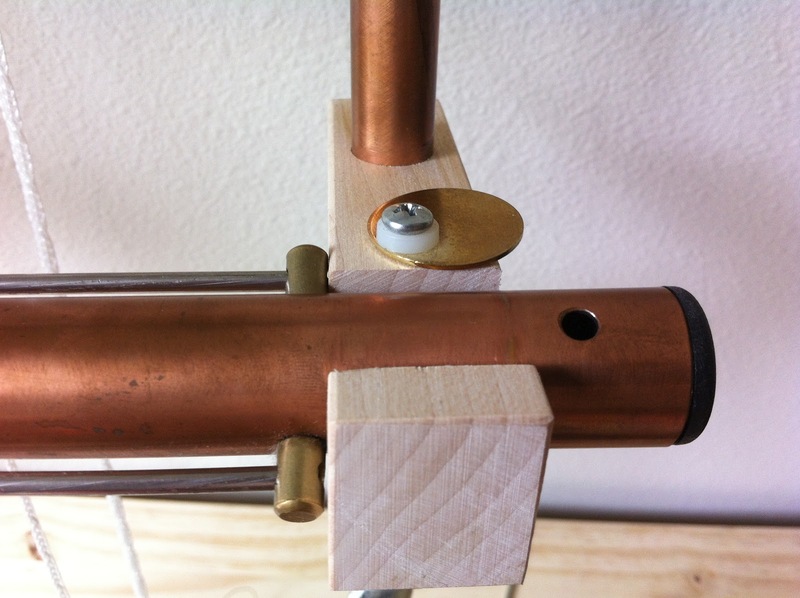 Place your shedding device handle behind the brass side bar. This creates a shed. Your other shed is created when you move your shedding device handle up (behind the brass bar above the wooden clip) instead of down. 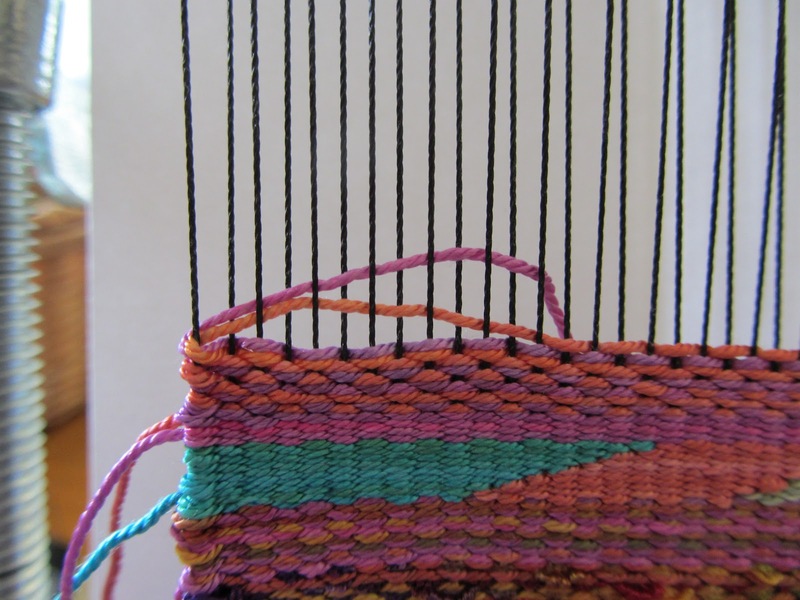 Weave a header by taking a length of warp thread and weaving it between the warps while you have the shedding device engaged. 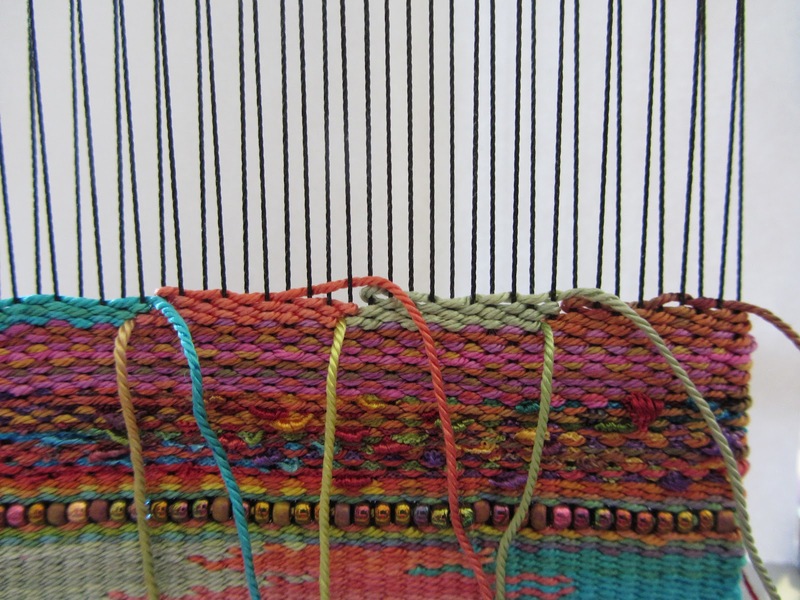 Weave through your warp threads in the other direction. 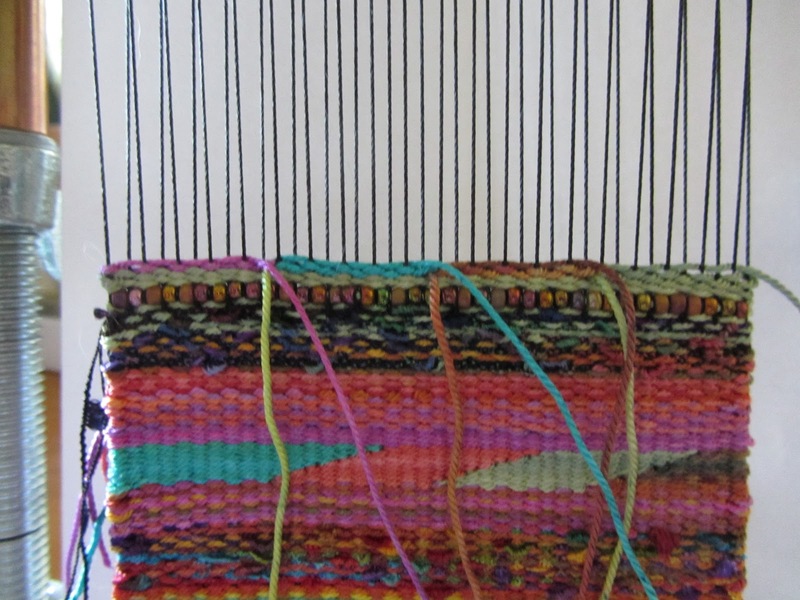 Continue doing this, weaving between the warp threads and changing your shed after each pass through. Now, you’re ready to add color! 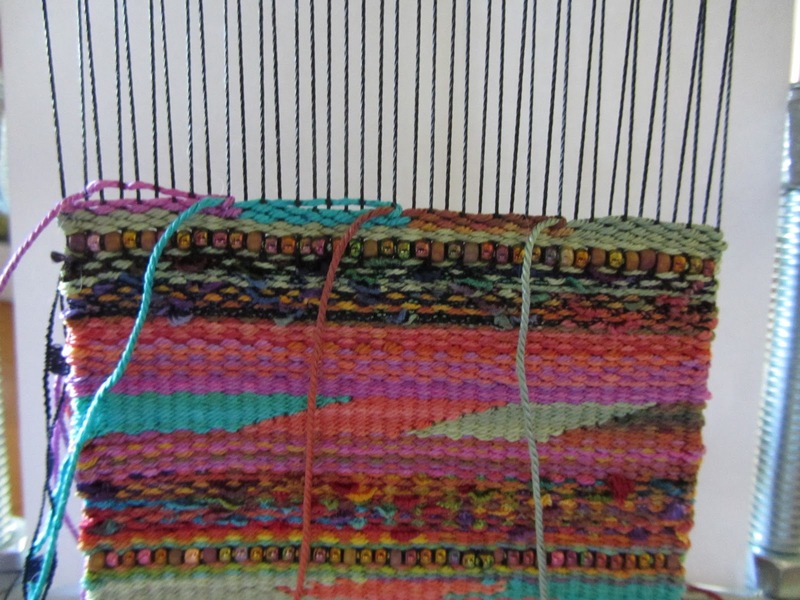 Weave the same way you wove your header. 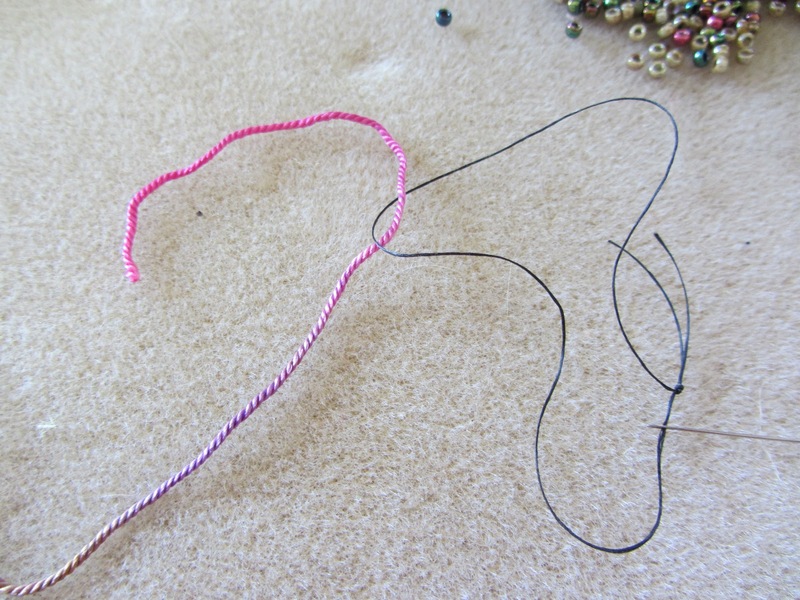 Start your thread in the middle of the piece and bring the end to the back to deal with later. 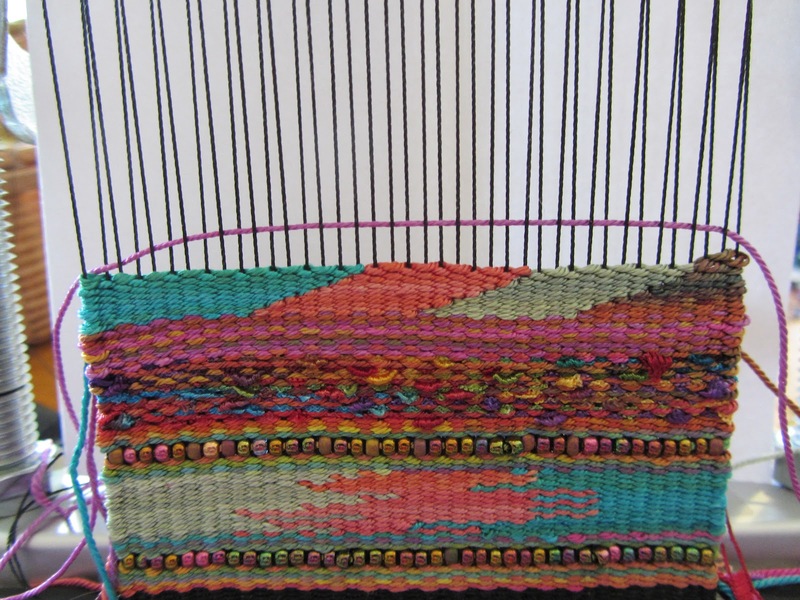 Keep weaving in this way. Thread some beading thread onto a needle and tie the ends to make a loop. 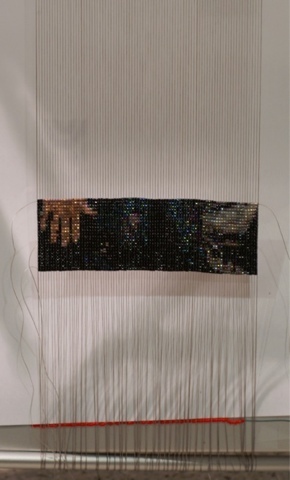 Push your beads onto the silk. 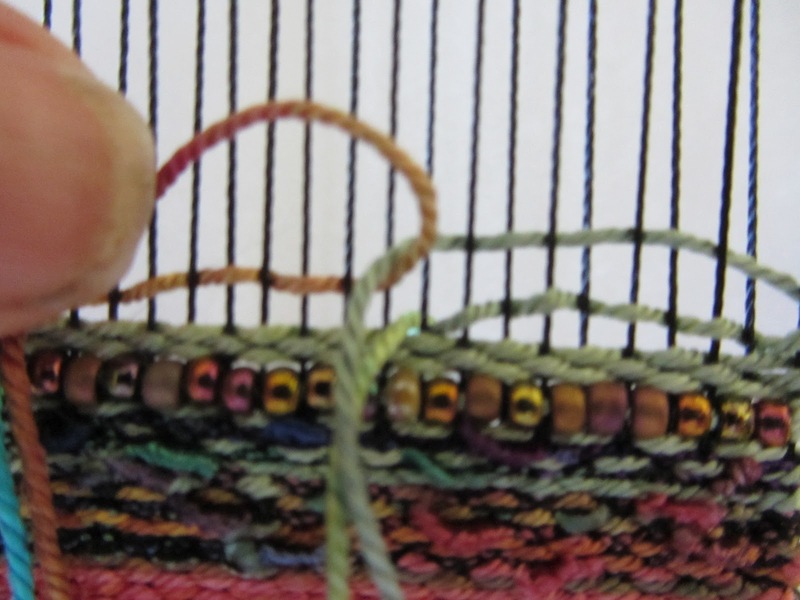 Place your beads between the warp threads, weaving them in the same way you weave in your weft. 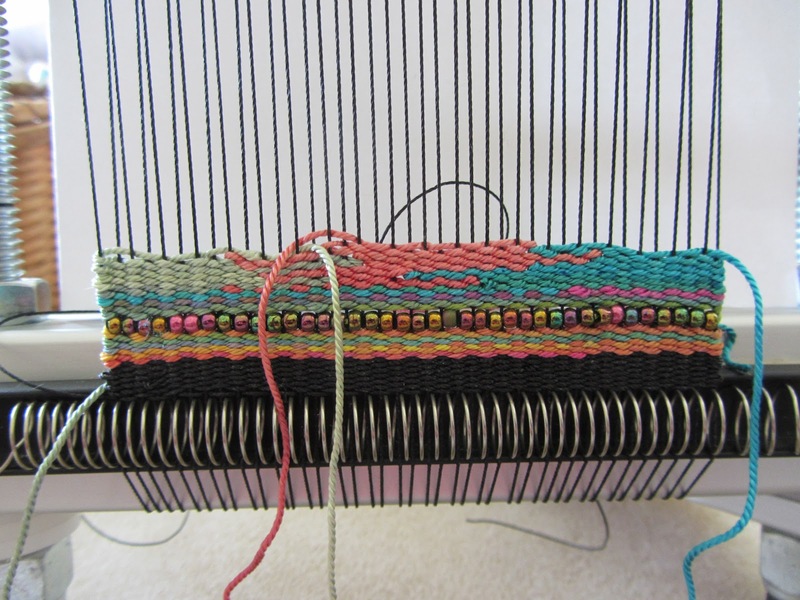 Push the beads down between the warp threads. 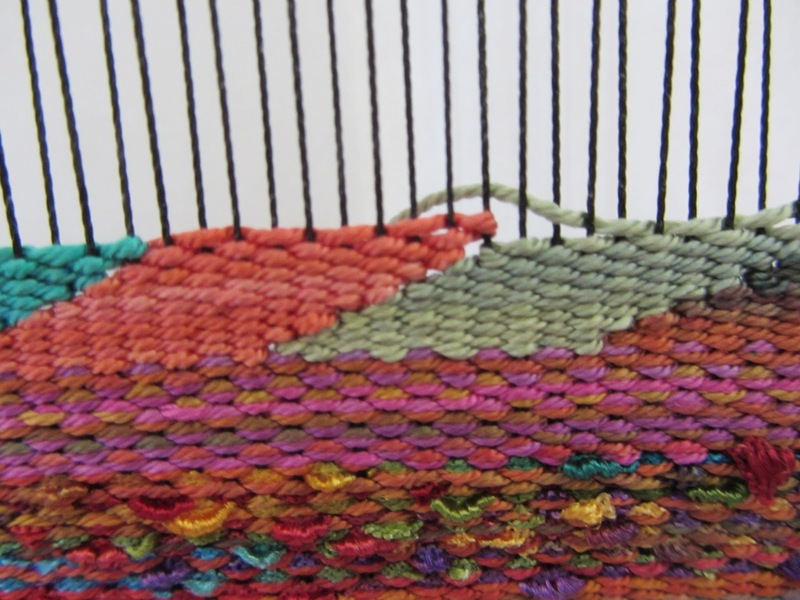 Continue to weave with the fiber!